For the first time since the relaunch, I’m happy to bring back the Free Game Analysis section to Chess^Summit. 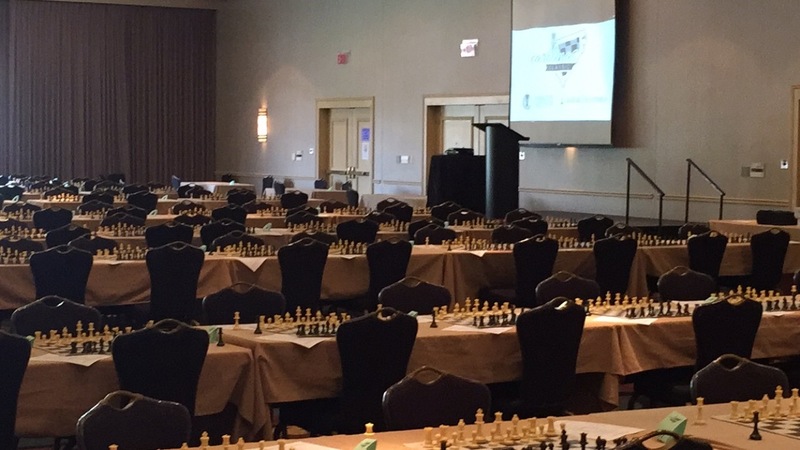 As always, if you have an interesting game to share, please send us your PGNs at chess.summit@gmail.com, and we’ll try to cover it within the two-week cycle. We’ve had some fun submissions in the past, and today’s is certainly no exception! For today’s post, I’ll be using a ChessBase external link instead of sharing tons of diagrams of the game (don’t worry, you don’t need ChessBase to access it!). Let me know if you guys like this format more in the comments! Veenay was the Chess Club President at his New Jersey High School, and now hopes to break 1800 by the time he graduates Rutgers! Remember that feeling when you first broke 1000? Well, recent high school graduate Veenay Komaragiri did that in style. Scoring 3/5 in the U1600 section of the recent Manhattan Open, Veenay didn’t just break 1000 – he skipped it, jumping from 945 to 1135! 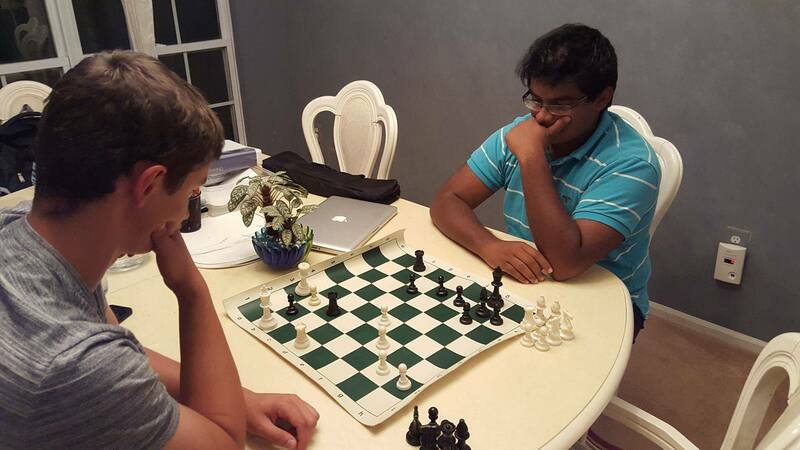 Though college is often a deterrent from chess improvement for many, Veenay hopes to build off his summer success while he furthers his education at Rutgers University as either a Biology or Economics major. With his optimism and tactical foresight, I think he can be looking forward to a lot of future improvement. But why let me be the judge? Let’s take a look at two of the games he sent to Chess^Summit from his performance in Manhattan! 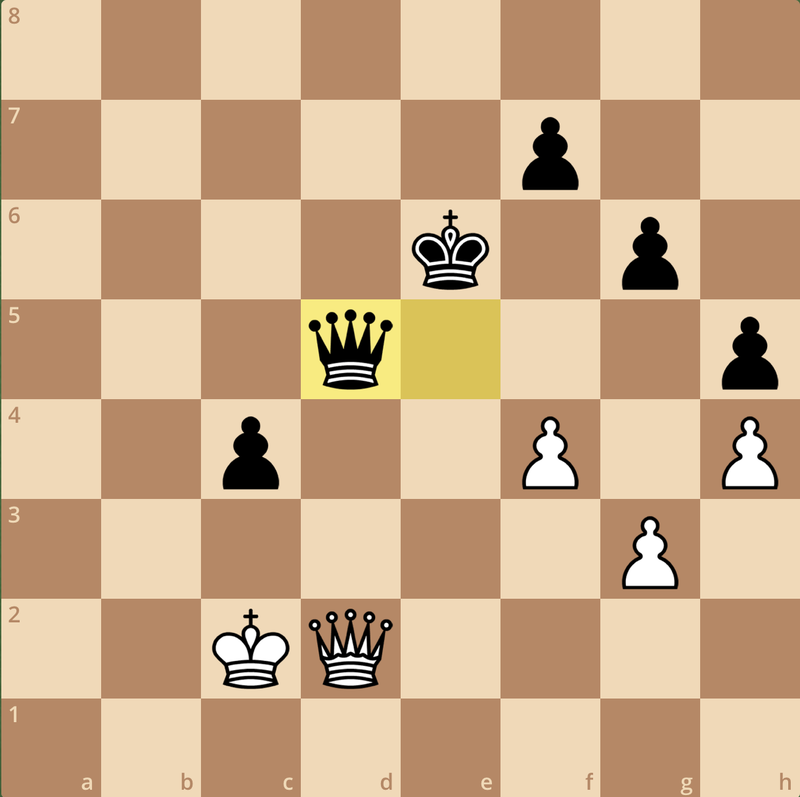 Though his first win of the tournament was short, Veenay’s game offered a lot of opening improvements for both sides out of a Slav, but ultimately culminated into this position. 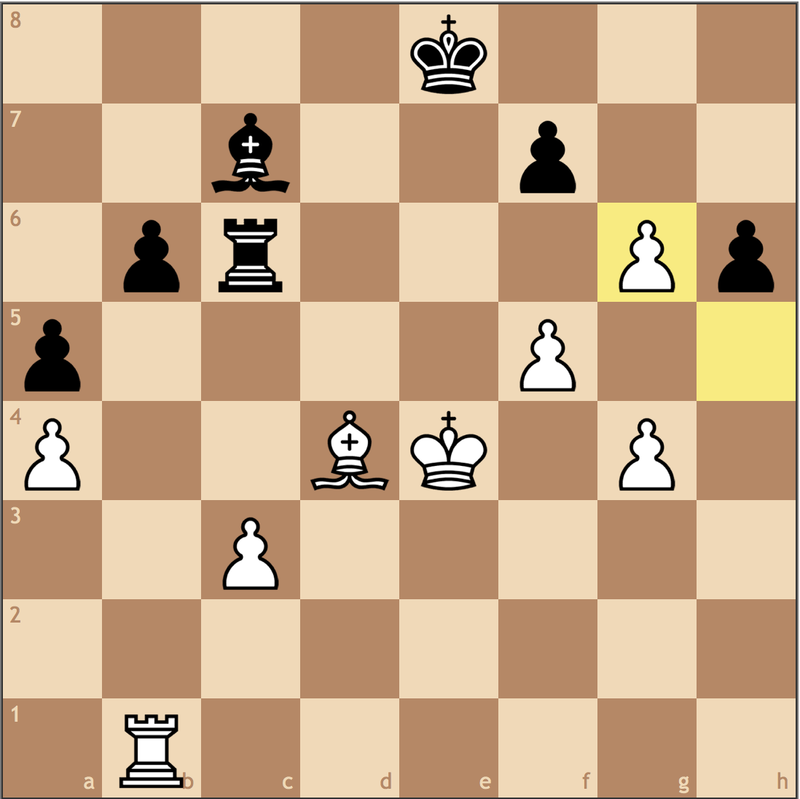 Just as it seemed White had managed to get firm control over the center, Veenay found an excellent tactic here to show that Black was still alive and kicking with 13…Nxe4! and his higher rated opponent immediately fell apart! After picking up two quick wins, Veenay really met his test in the fourth round where he was a 500+ rating point underdog! 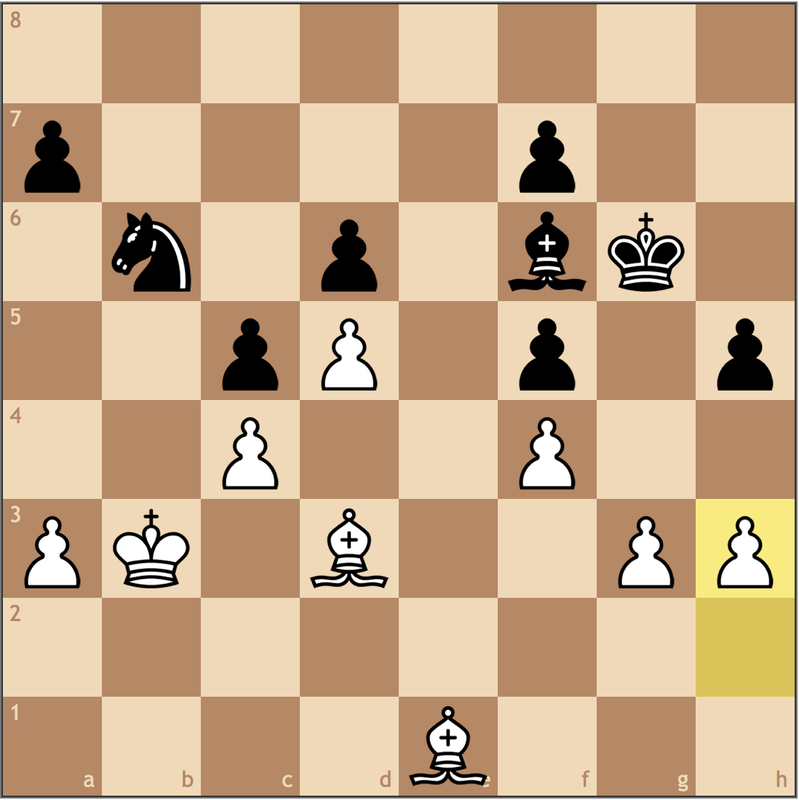 Outclassed in the opening, Veenay had one chance to reach an equal endgame in this position but faltered with 13…Rfe8? !, and soon lost the thread of the game. However, with his never say die attitude, the Warlord from West Windsor managed to keep the Cinderella story going, finding a tactic late in the game to pull off his best career win – what a turnaround! 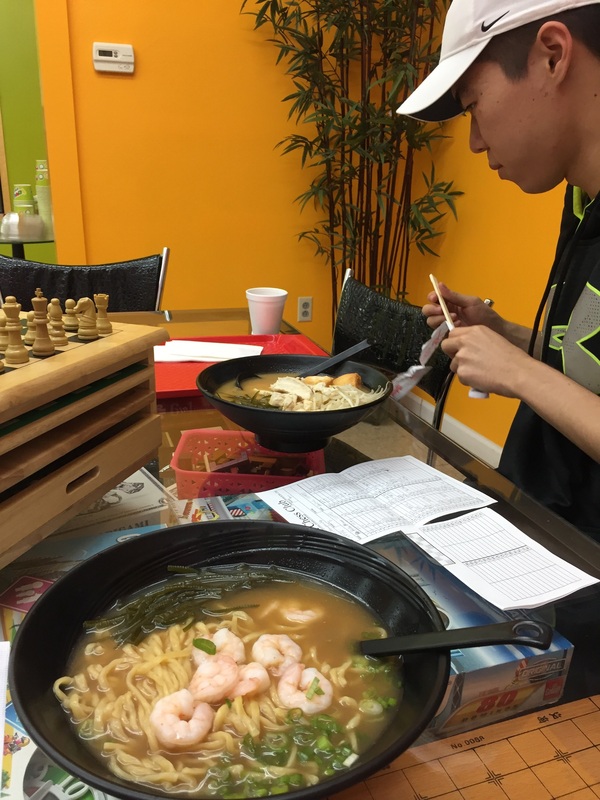 So what advice can I offer Veenay as he starts on his journey to become a strong tournament player? 1. 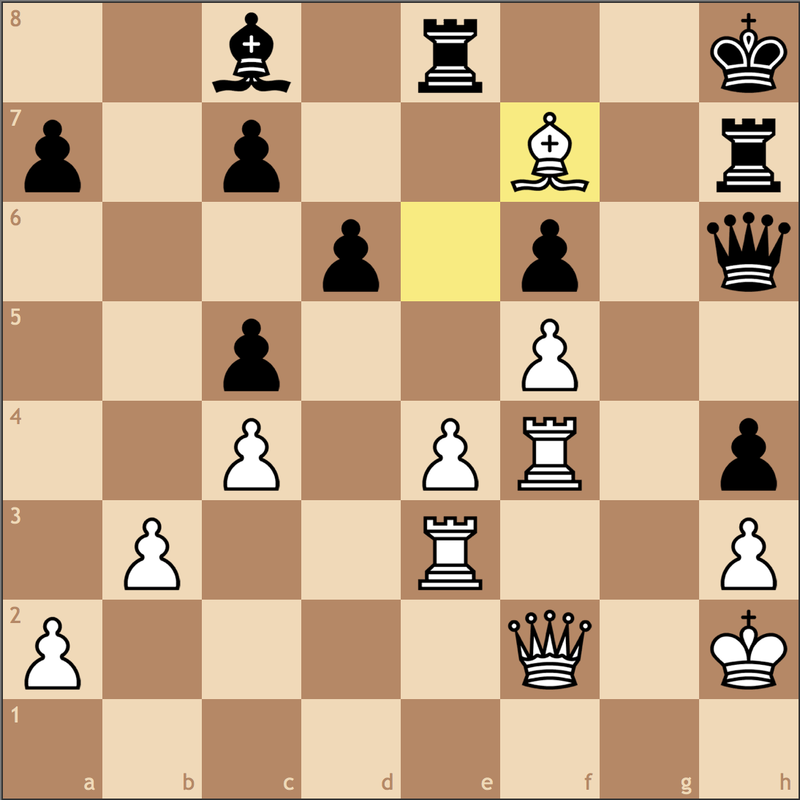 When your opponent makes a move, always ask “What can my opponent do?” This is one of the most elementary forms of prophylaxis but is extremely effective when developing a thought process and playing at a higher level. I think too much of beginner level chess focuses on “I do this, he does that” and not enough on thinking about the bigger picture. While your first game was great, several of your problems in the second derived from not asking this very question. This one question alone is so powerful, I still use it in my games. Here’s one case where I failed to use it and it probably cost me the game! A slightly better position for White as I have breaks on both the kingside on the queenside. 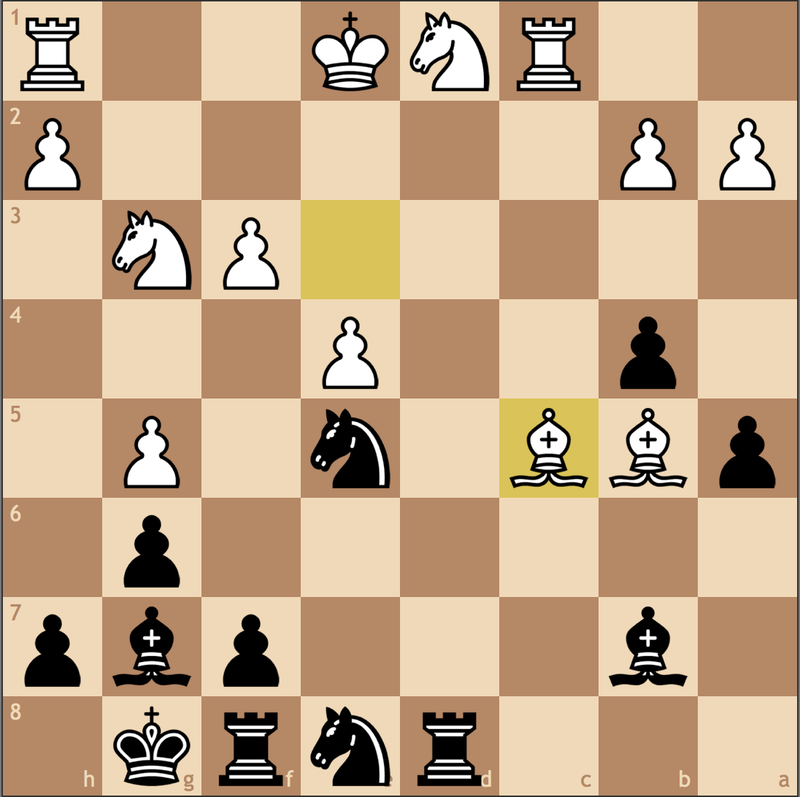 Black meanwhile has a weak f5 pawn and must find ways to generate counter play. If I had stopped at 20…Rde8 and recognized this plan, who knows? Maybe I would have been the one to win this game! 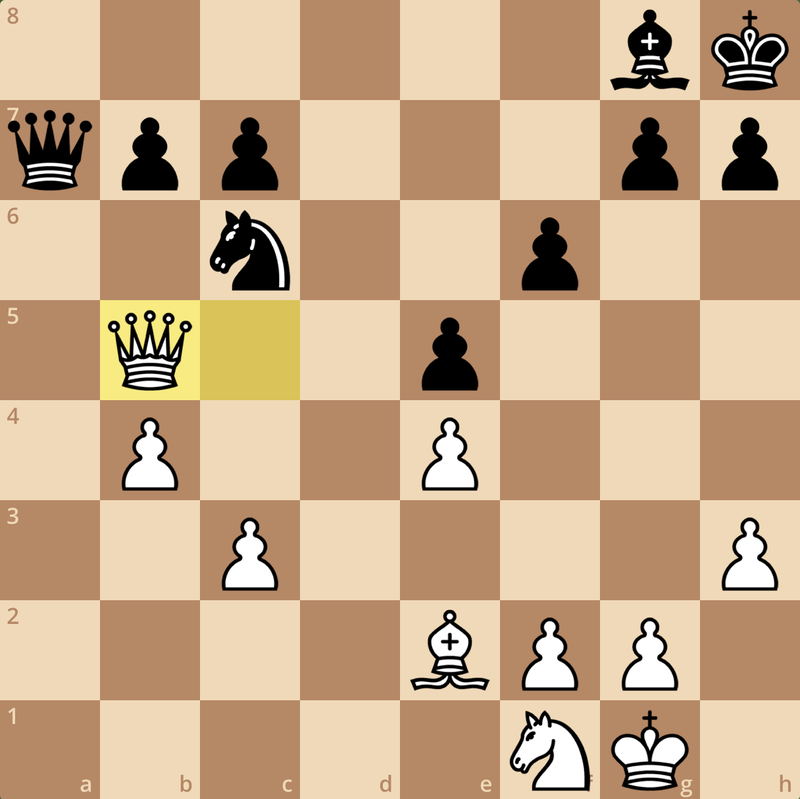 There’s a certain magical aspect to prophylaxis in that we can see it applied in games of every level – whether it’s preventing a mate threat, stopping an attack, or in this case taking away an outpost. the bishop on g7 was poorly placed on this diagonal, and would have been much better suited on the e7 square for future use. Of course, conceptual understandings like this take many games to develop, but while you are still improving this is the best time to work on this skill. If you want to see how I break down unfamiliar openings and choose my development, check out my post from the World Open! Despite personally having a rough tournament, I think you could learn a lot from the two games I shared on the site! 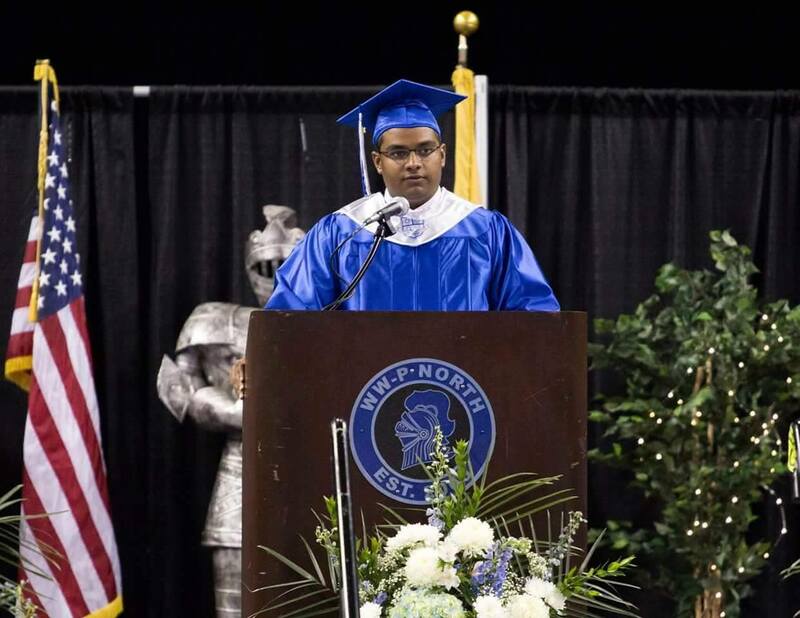 Veenay speaking at his High School graduation earlier this summer. 3. Lastly, always stay positive! You seem really enthusiastic about getting better, and that’s probably the most important attribute when it comes to improving and getting results. As Paul told us last week, it doesn’t matter when you start playing chess, as long as you put in the work, it’s never too late to become an expert! He offered a lot of advice and personal anecdotes about improving despite only learning how to play in college, and I think you’ll find it very relatable! 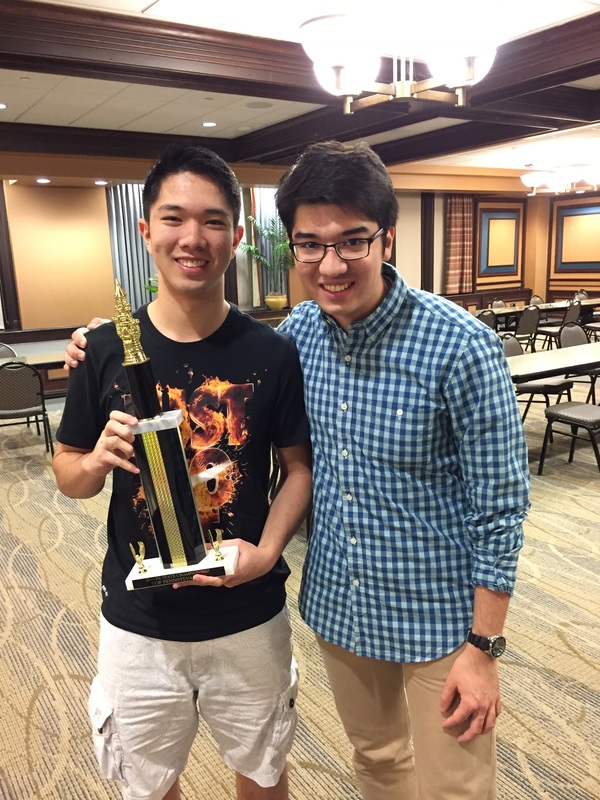 Best of luck improving on your chess while studying at Rutgers – it was a lot of fun going over your games, and even I learned a few things along the way! Here’s to continued success in your near future! 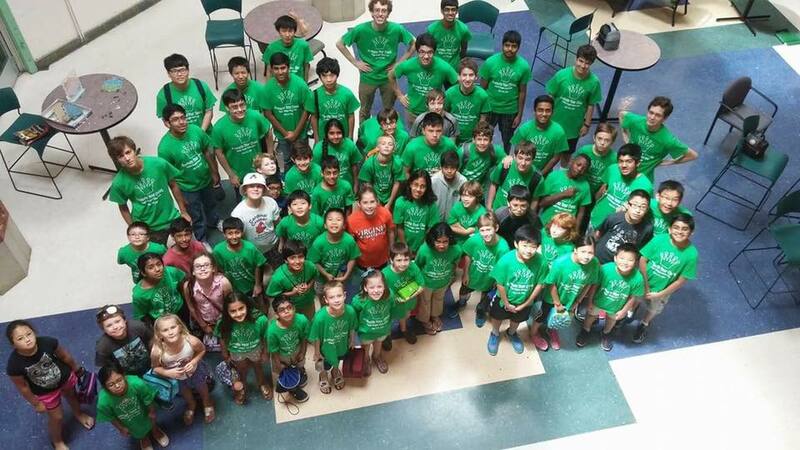 The 2016 edition of Dragon Chess Camp brought in a record 51 campers for the week long program. What a long couple of weeks it has been! Since my return from Philidelphia, improving from one of my most nightmarish tournaments of my career has been at the forefront of my agenda. 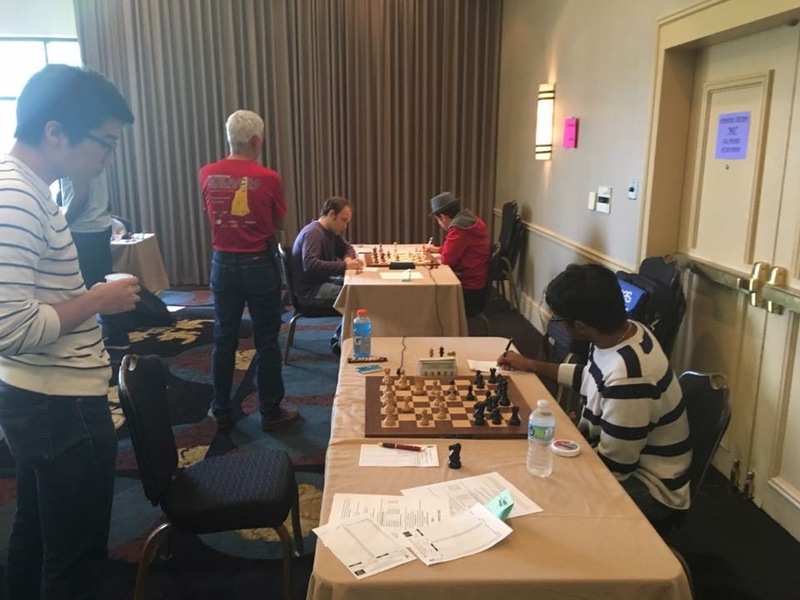 With new openings to learn and grandmaster games to review, I had exactly two weeks to prepare for this past weekend’s Southern Open in Orlando. While such a short period of time to prepare is by no means ideal when preparing a new repertoire, I was ready to play some new lines as Black. 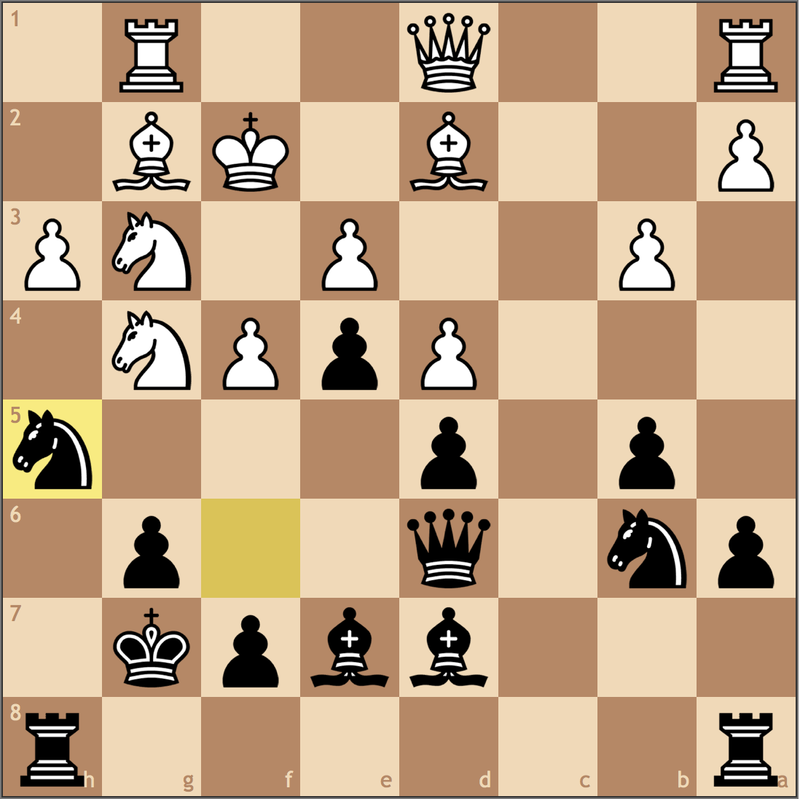 In fact, in each of my games as Black I got to play new openings and reached much more solid positions! So progress has been steady, but there’s still a long ways to go. 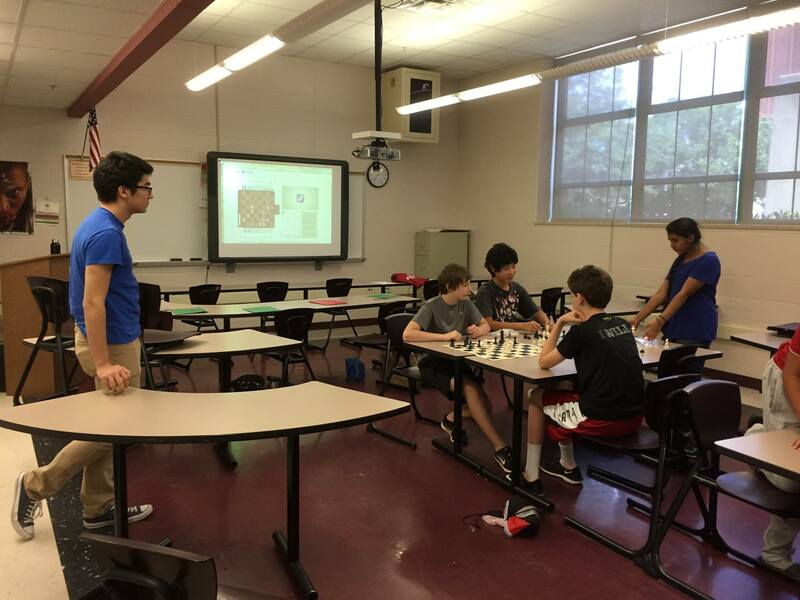 On top of my own personal opening preparations, my first week back from the World Open was also spent volunteering at a program I had started back in 2013, Dragon Chess Camp. Back in my sophomore year of high school, I wanted to push our team to become much more competitive and provide my teammates with competitive opportunities across the country. 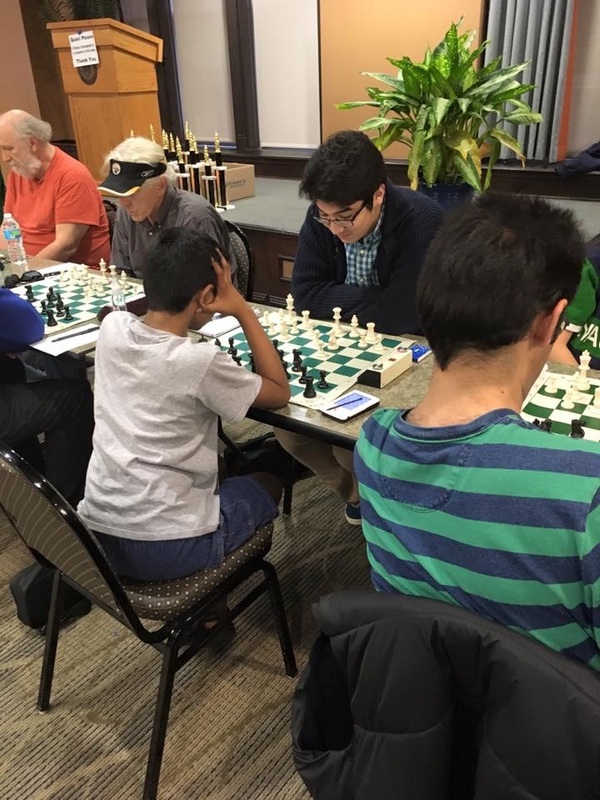 The first edition of the summer camp had twenty participants and raised enough for our team to travel to the National High School Chess Championships in San Diego the following year where we won clear first in the U1200 section. 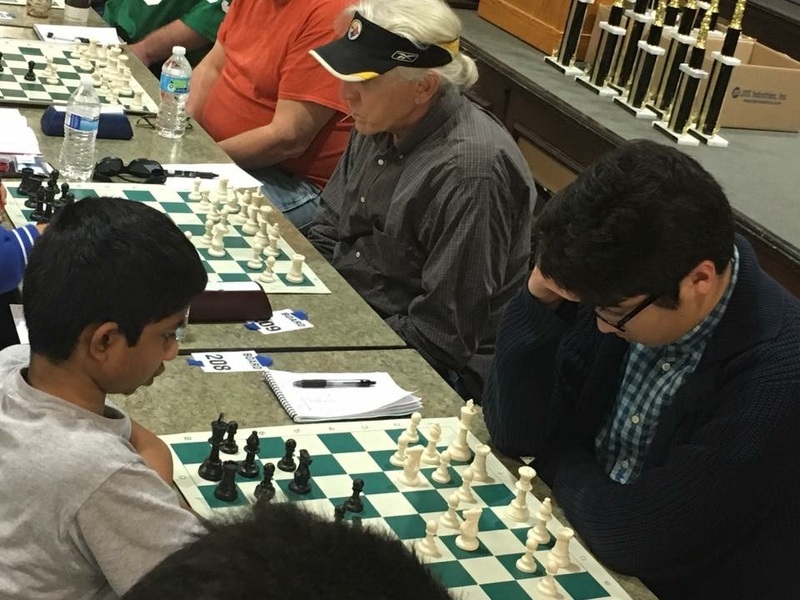 Since, the team’s outreach has really taken off – running free chess clinics, more summer programs, and hosting a plethora of scholastic tournaments – and the Maggie L. Walker Governor’s School has become the pinnacle of chess in Richmond. Watching the kids practice the Lucena and Philidor positions – better now than later! And that screen in the background? 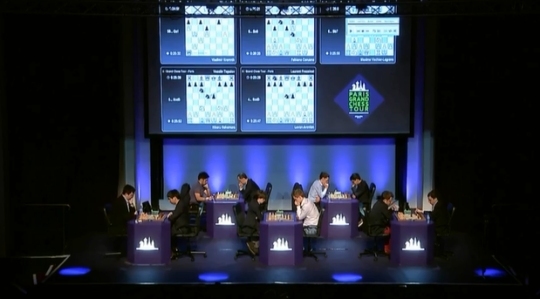 We were watching Nakamura’s big win over Carlsen too. This summer, fifty-one scholastic players registered, which will help next year’s team compete in their first SuperNationals in Nashville, Tennessee! With such high attendance, I was tasked with the largest group I had taught in all four editions of the program. For that week, our class focused on theoretical rook endgames – the Lucena, Philidor, Vancura, known draws – whatever you could think of! Despite the relatively young age of my group, by having the players practice both converting and defending, they proved to be extremely fast learners and one of the players even used the ‘building a bridge’ technique to convert a win at the weekend’s tournament. The second half of the course focused on principled opening play, which I had put together after my performance at the World Open. Halfway through the week, I had realized that many of the players in the camp only knew “unprincipled” openings – for example, various Pirc and Modern structures as Black – and were constantly having problems because they didn’t know theory. Thinking back to the thousands of pages of chess literature I’ve read, Greg Serper’s chess.com article on Inexperienced Player Mistakes comes to mind, where he calls a 1500 rated player’s choice of 1. c4 a mistake (of course this means I sinned in this same way six years ago) because a player of that caliber needs to learn chess by fighting for the center first with 1. e4 or 1. d4. 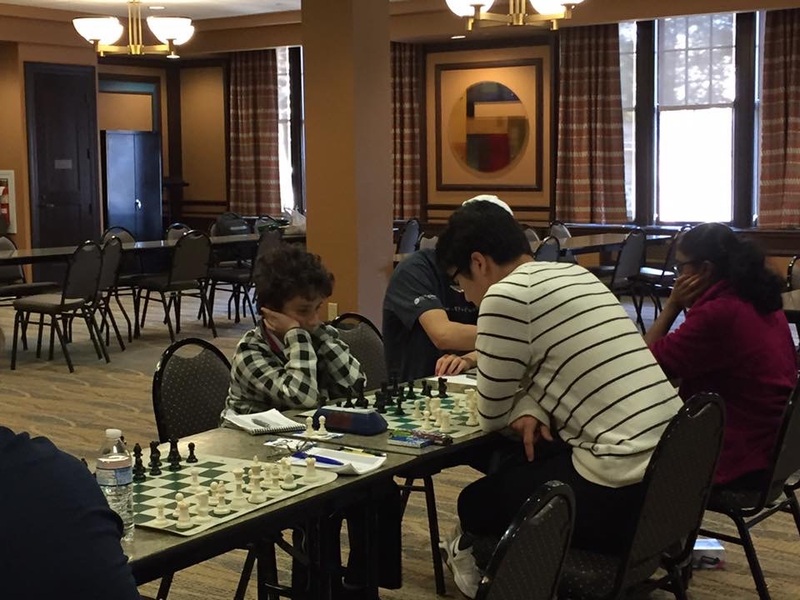 I think part of the openings-craze among scholastic players is driven by coaches who themselves don’t know classical openings, or perhaps think that changing openings will solve all of the problems their pupils may be having. Of course, this may temporarily improve the student’s performance, but long term – as I too have recently found – could be more of a hindrance than a strength. 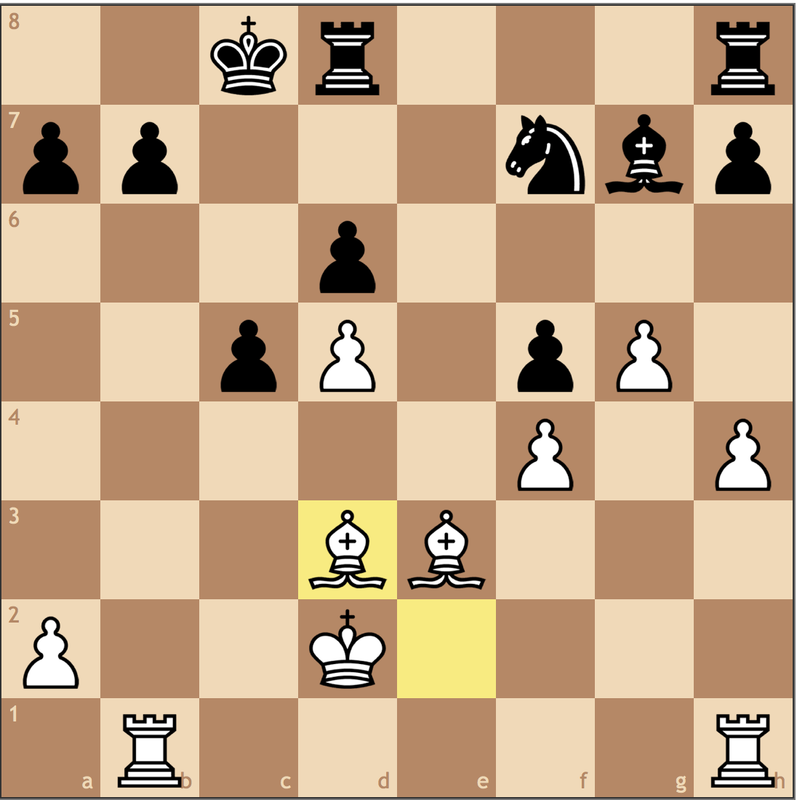 As a gift to all the 1. e4 players in my class, I showed them a simple plan Amonatov used in similar structures to demonstrate how Black’s failure to fight for the center was the root of his problems. 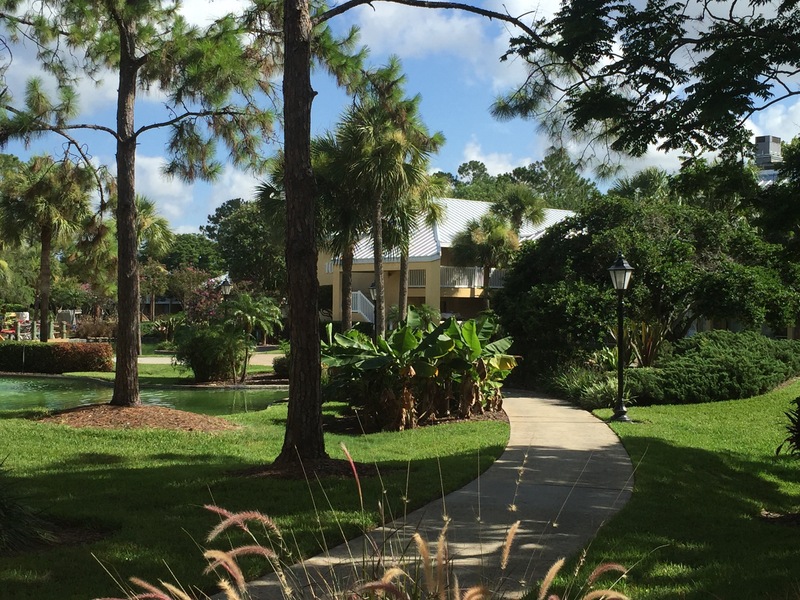 The tournament venue – good thing the US Junior Open in New Orleans taught me how to cope with the heat! So that’s enough banter, how did my first tournament back from the World Open go? Admittedly, not what I had hoped for. Without any opportunities to really practice my new openings or demonstrate improvement in an over-the-board game, I lacked a lot of confidence in my own abilities. This definitely had an impact on my overall play, but the bigger problem was that in spending all of my preparation on openings for this event, I was not as sharp tactically, and that proved to be the most apparent reason why I underperformed. As you can see, my opponent has done very little to improve the nature of his position, simply waiting for me to make a mistake. Of course, there’s nothing I can really do at the moment to punish him, but the more I continue to evolve my position the better suited it will be to fend off any attack from Black. 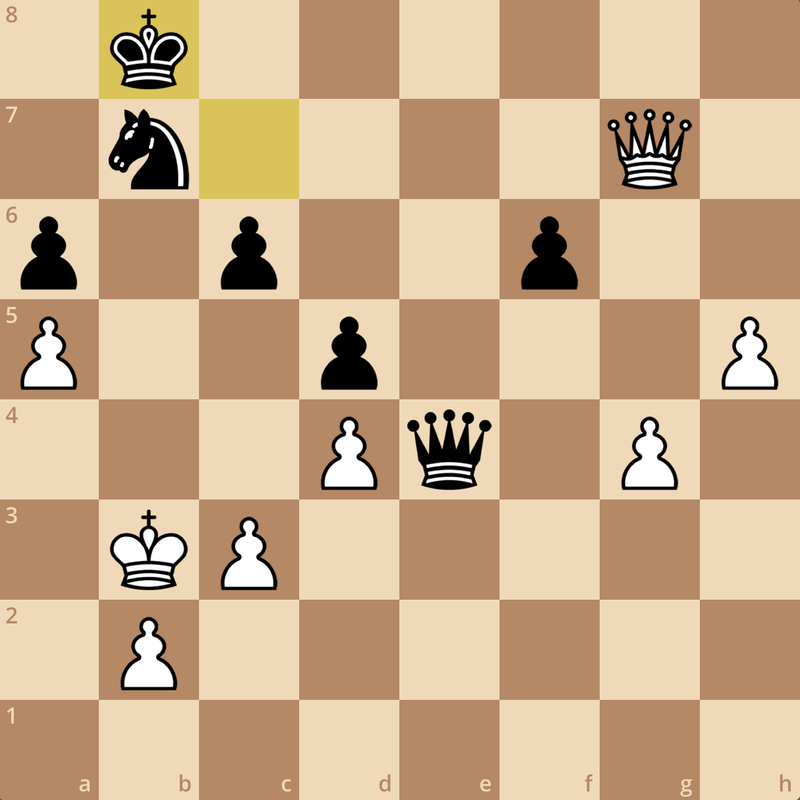 With this move, I create a little room from my king on h2. I was considering 28. f4?! but after 28… Qd4 starts to get annoying and tactical complications ensue after …f7-f5. 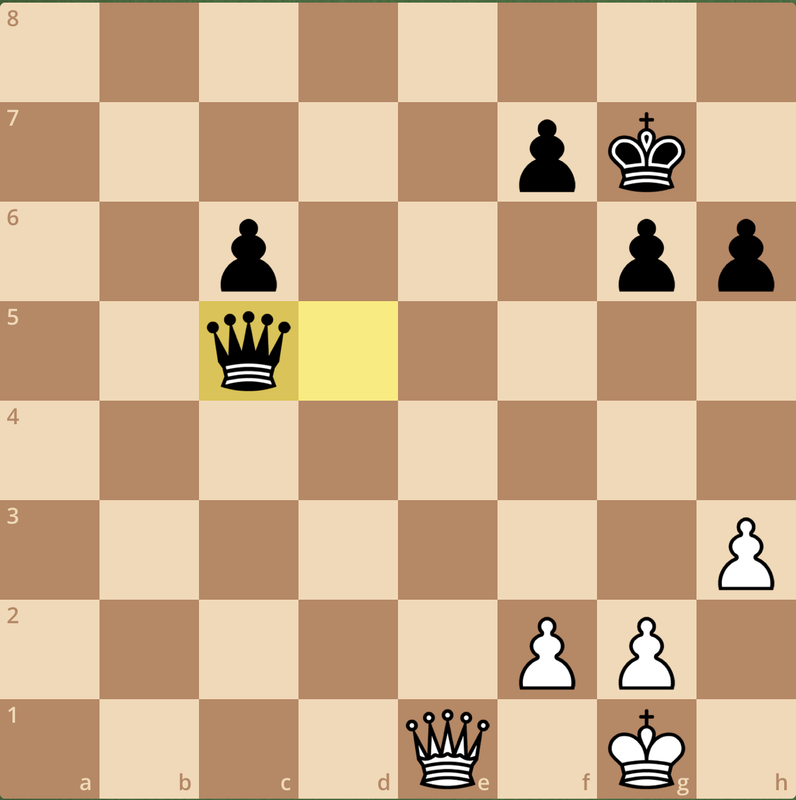 Though h1 seems like a suitable square for the monarch, it’s on the same diagonal as Black’s bishop, and I would rather avoid that if possible. With Black not doing much, I have time to place my pieces as I would like. Realizing I was planning f2-f4, my opponent lashed out with 28…g5? and then the party really started! If you compare this position to the previous diagram, you’ll see that Black’s position is identical to the one before it, while I’ve had the luxury of making two moves and am on turn to take a third. Here I decided to take control of the game with 33.f4 since now seemed the most logical time to change the structure in the game. Black’s ability to use his long-term trumps are starting to wear off, and it almost seems like the a8 bishop is every bit out of the game as mine on g2. 33…f6 34.Bf3 Kh8 35.Bh5? Not taking the pawn! 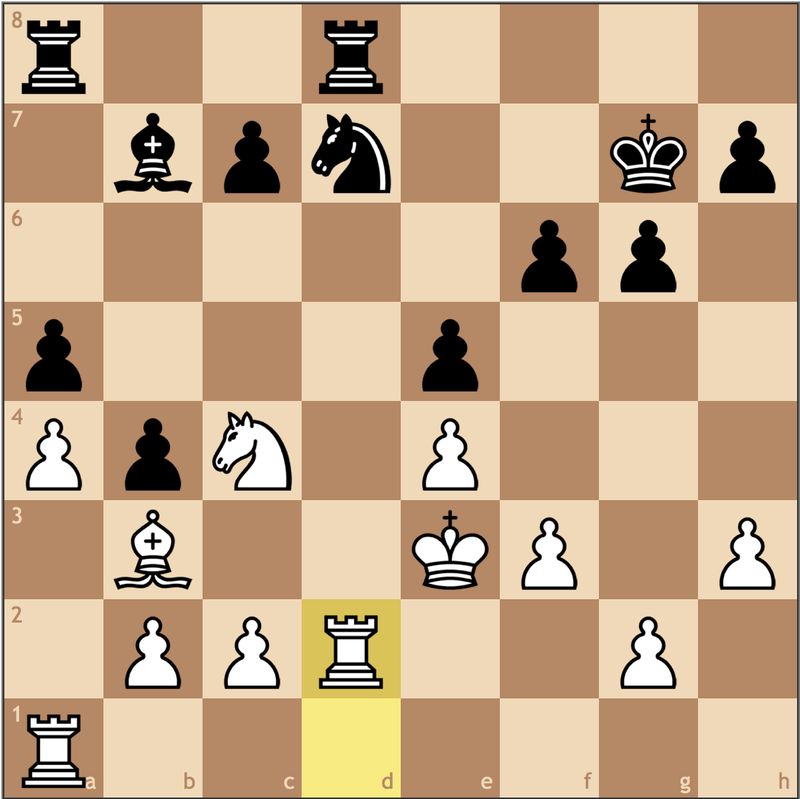 Positionally it is much more important to have a bishop on f5 and control the critical light squares in the position. 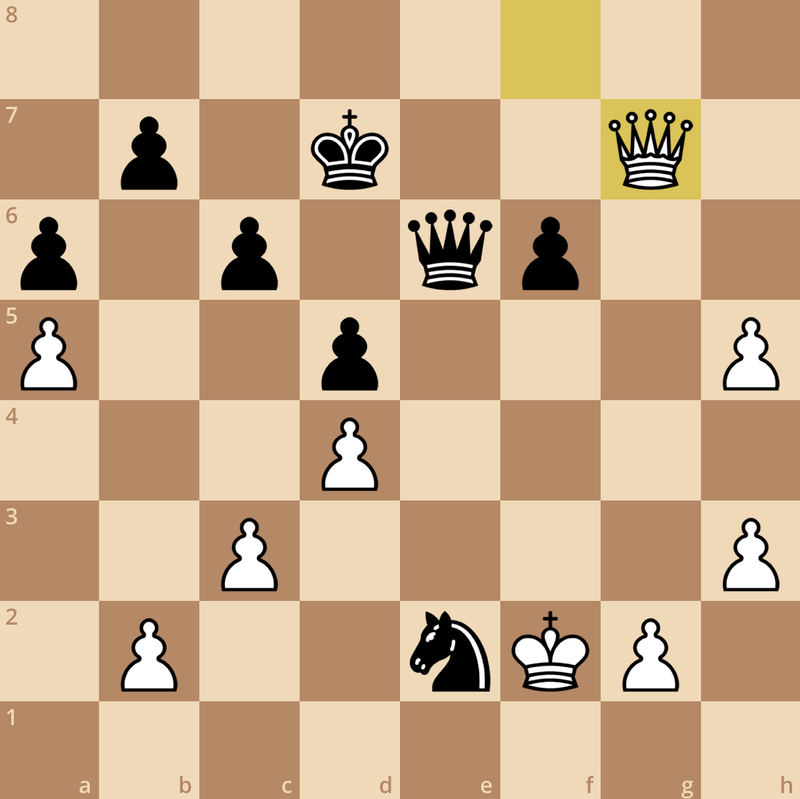 This enables my queen to enter the game on h5 if Black isn’t careful, which wasn’t an option if I had taken with the bishop. 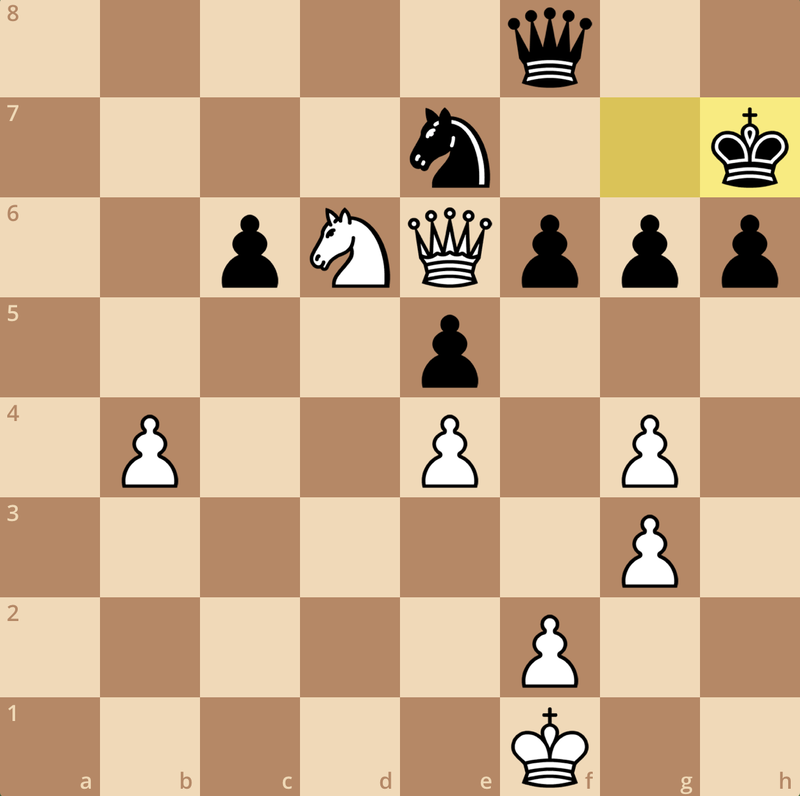 Tactically, Black probably retains an edge if after 38. Bxh5 f5! attempting to open the long light square diagonal. 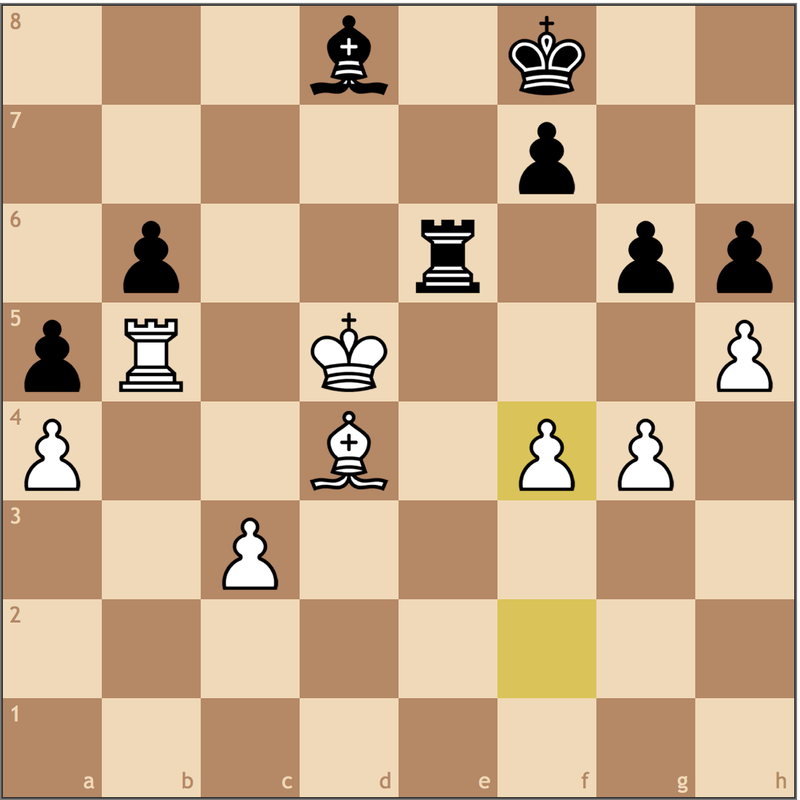 I awkwardly managed to set-up a defense until making this critical mistake some moves later. 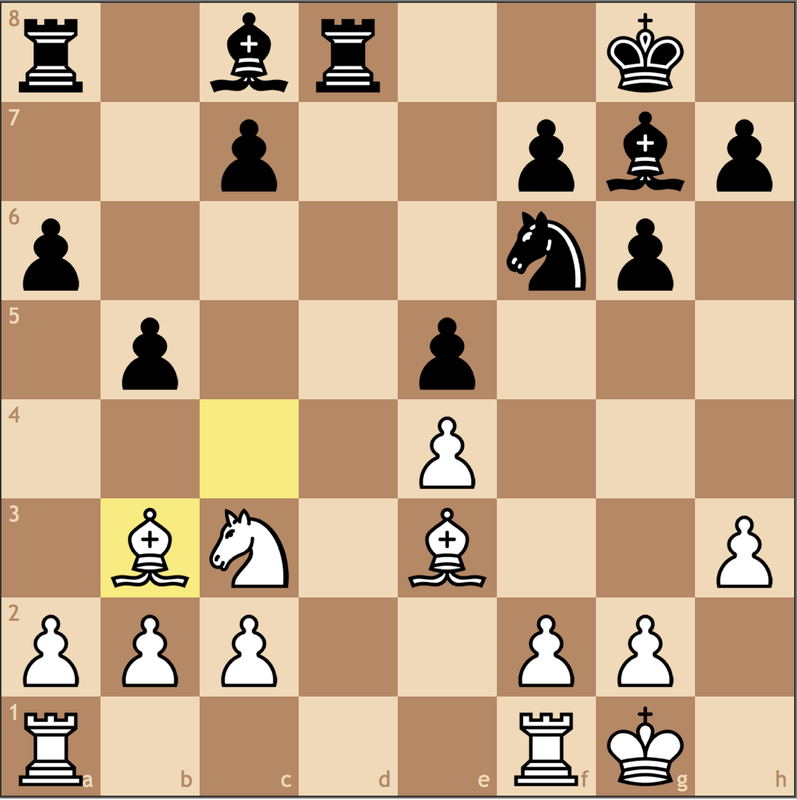 38…Qh6 39.Rf1 Reg7 40.Rff3 h4 41.Qf2 Bb7 42.Be6? 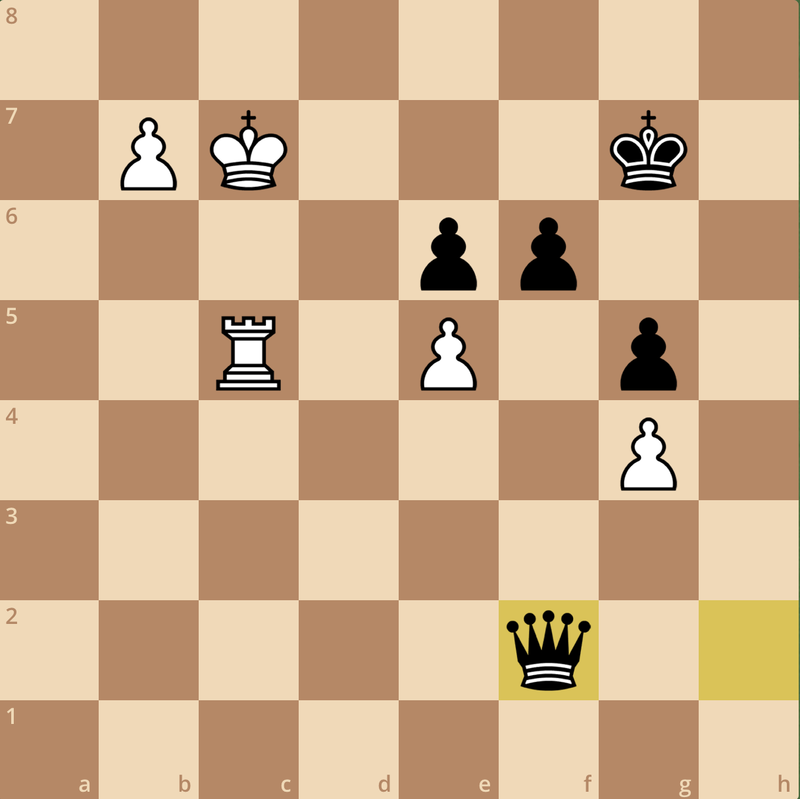 Black to move and win. I’ll attach the answer further down in the article if you want to try and solve it first. 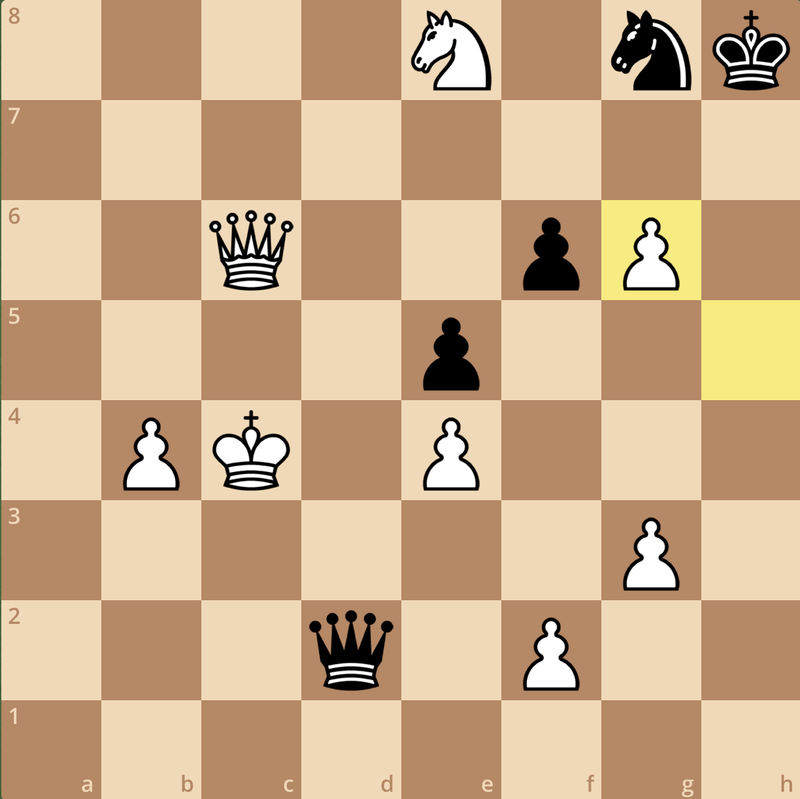 Positionally though, my goal was to lock down the e-file by playing f4-f5 and use the f4 square for my rook to attack h4. This is precisely what happened in the game, but even from a positionally better side of the board, tactics are still everywhere! 42…Re8 43.f5 Bc8 44.Rf4 Rh7 45.Bf7! And the game meets its rightful end. 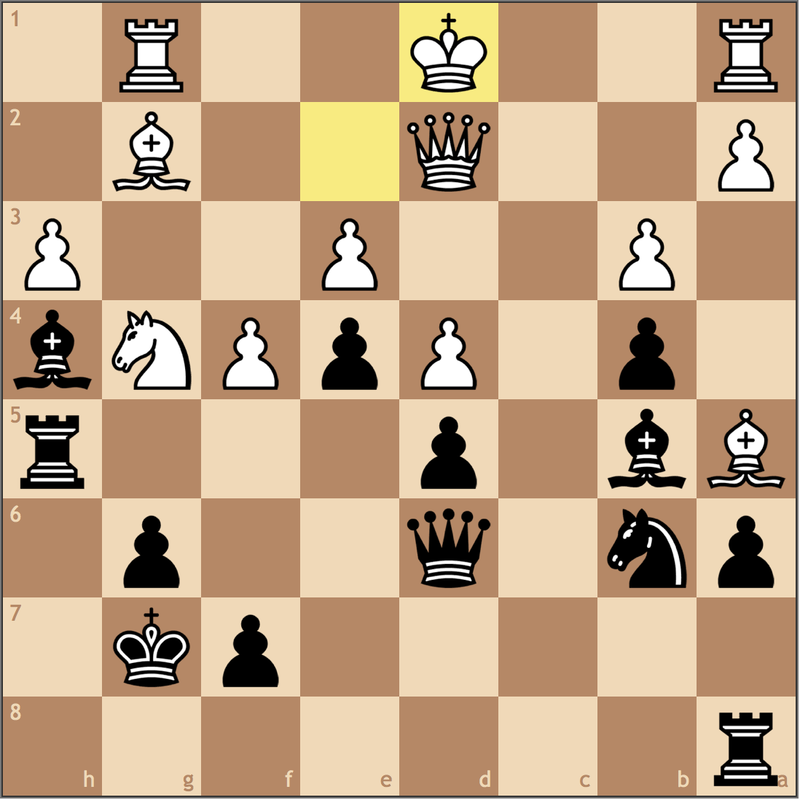 Black cannot save the h4 pawn, and my pressure on the kingside will be too much to handle. 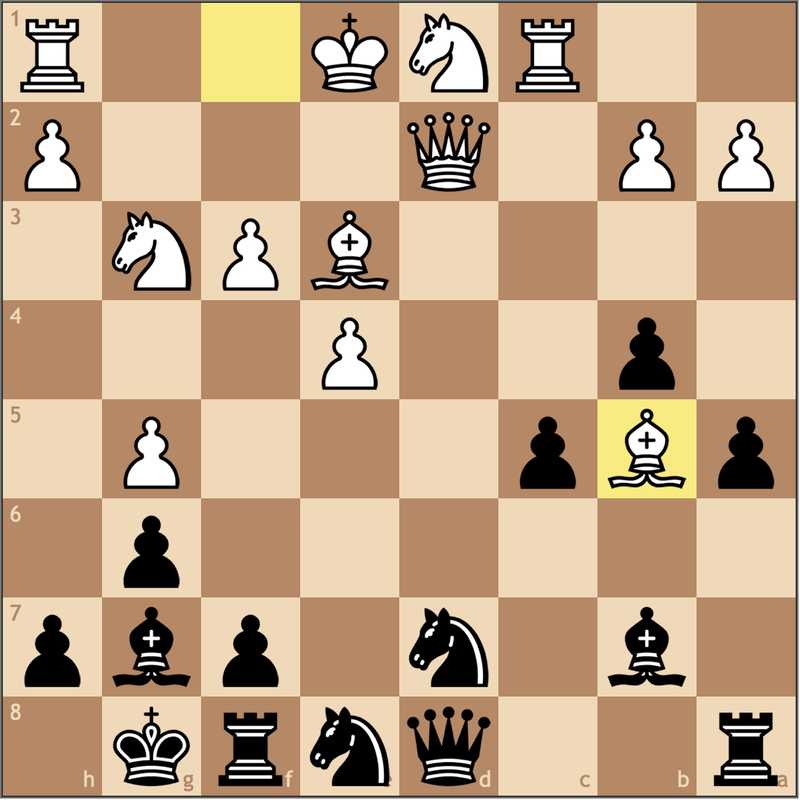 Black’s light-squared bishop, once the proudest piece in the position, now is utterly useless to aid Black in his struggles. 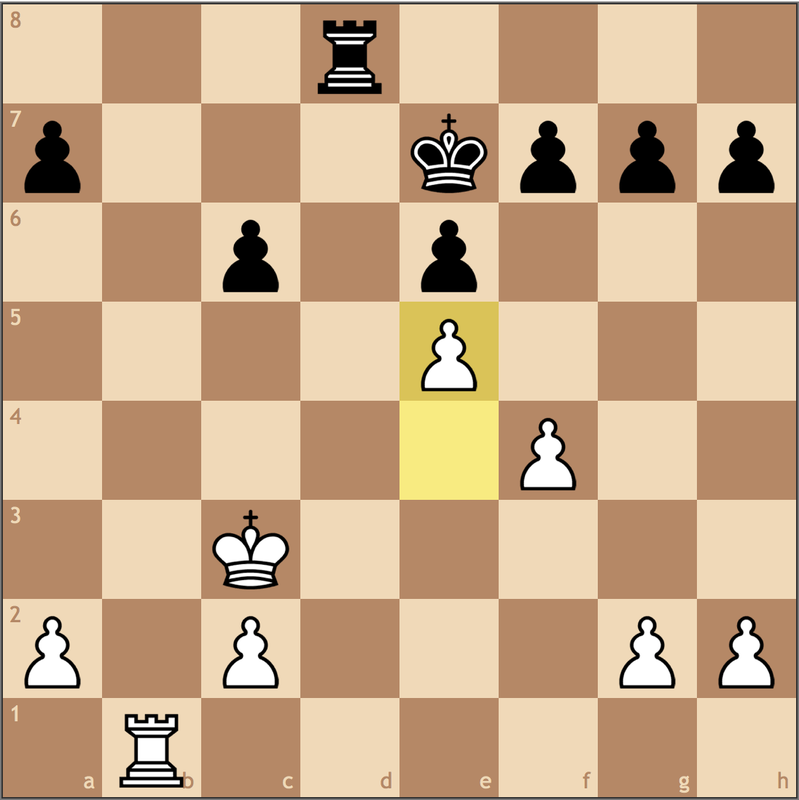 Not a particularly well-played game, but I thought it illustrated how at the 2100 level, how tactics and poor endgame technique still plague our games. And to some extent, the once abysmal d3 bishop’s road trip was quite amusing – it moved eleven times from d3 to reach h7 to win the game! 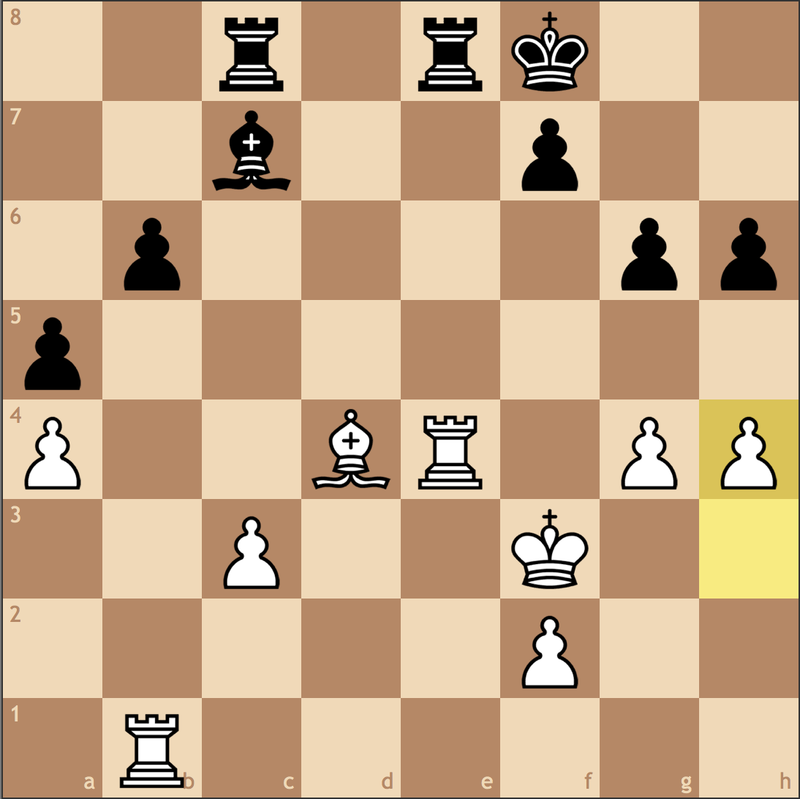 How easy it was to miss 44… Bxe4!!? Well, luck was certainly on my side this game. Last summer I took third in the U2200 section, which set me well on my way towards breaking 2100. I’m closing out this summer with my next tournament, the Washington International, before heading back to Pittsburgh for my fall semester. While I was flirting with the idea of trying the open section early in the summer, I’ve decided to compete in the U2200 section to iron out some of the weaknesses in my game. The Washington International is certainly the most accommodating tournament I’ve ever played in, and I’ve had this event marked on my calendar since I left Rockville last year. I’m hoping to make the most out of this tournament, and hopefully, it can be as good to me as it was last year! Until next time! 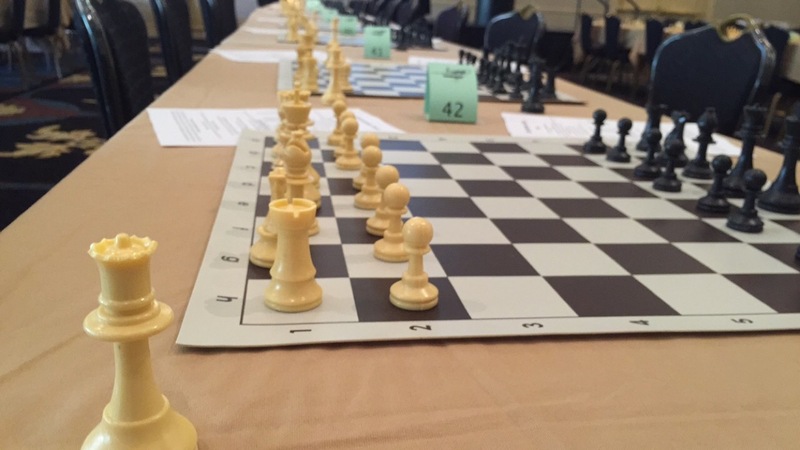 Endgame Essentials: In Action at the European Chess Championships! After writing my most recent Endgames Essentials post, I decided to watch the European Individual Chess Championships and stumbled across an endgame that I thought was an effective model of the principles we’ve established thus far. 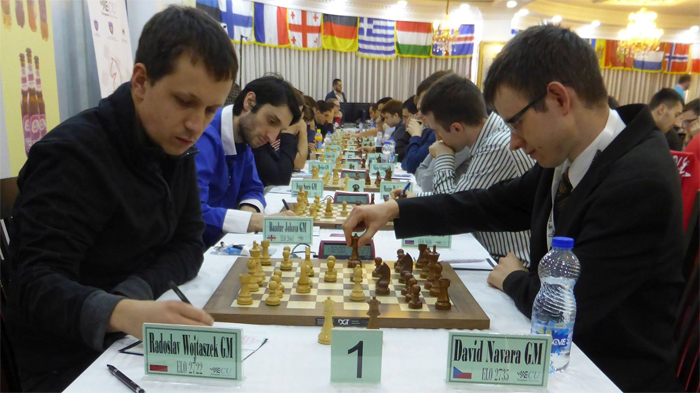 Today’s post features David Navara (right), a strong 2700+ rated Grandmaster from the Czech Republic! Before Ernesto Inarkiev managed to pull away from the pack and win the Championships, it looked like the event could go a number of ways – Saric, Navara, Jobava, Kovalenko, and Wojtaszek were all over 5/6, with a bunch of strong players at 4.5/6 with five rounds to go. While it wouldn’t determine the winner, David Navara’s game in round 7 against Baadur Jobava definetly impacted the course of the tournament. 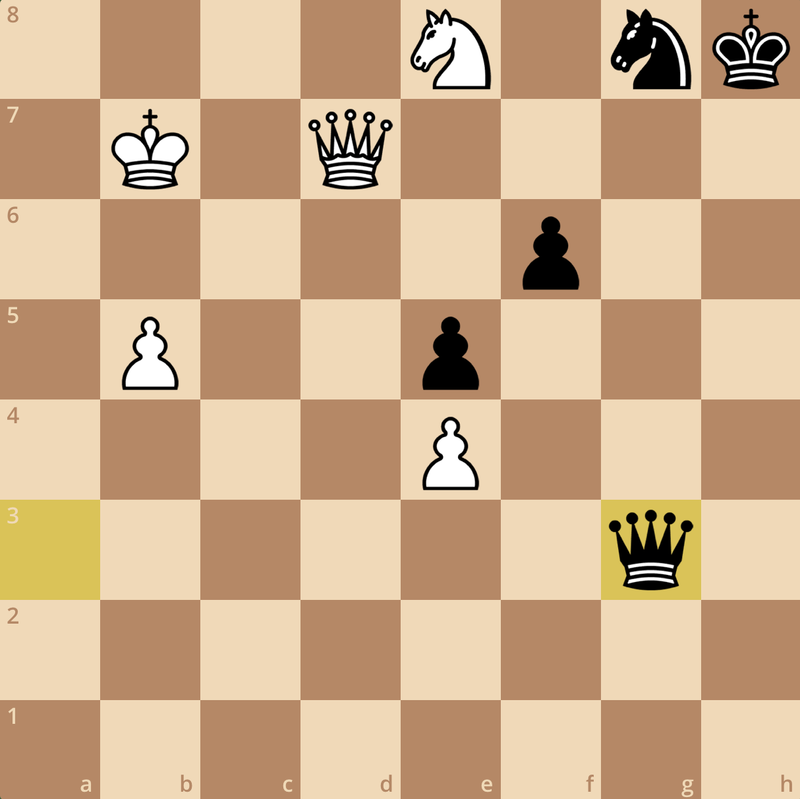 White has improved his position, but so has Black – in fact his king is coming into the game very quickly! 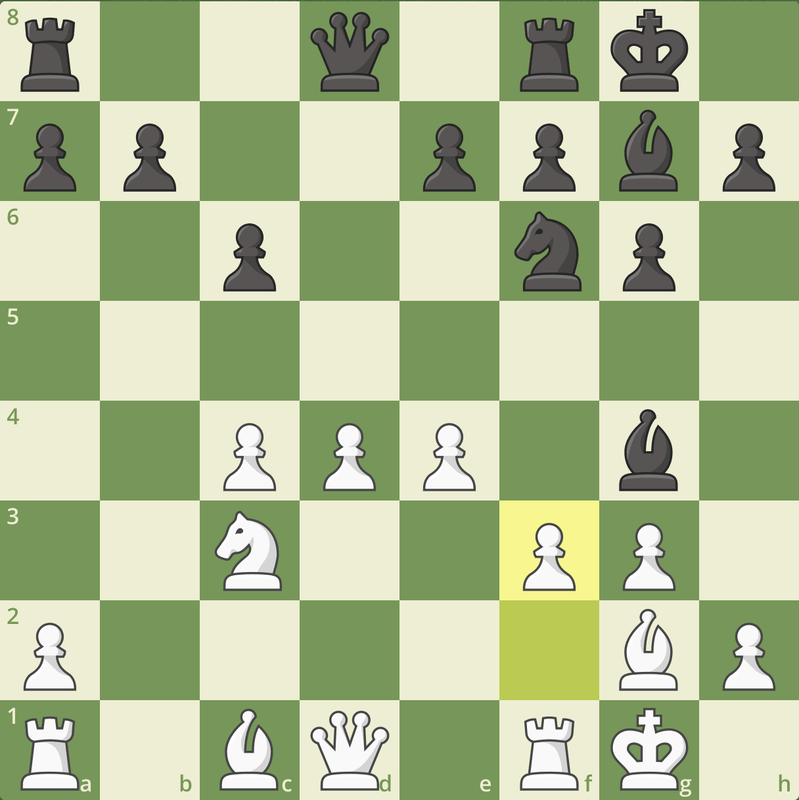 If White isn’t careful, Black can bring his king to d6 and rook to d7 with the hopes of creating a fortress. When you’re trying to improve your position and push your opponent, it’s always important to consider their plans and see if you can stop them. 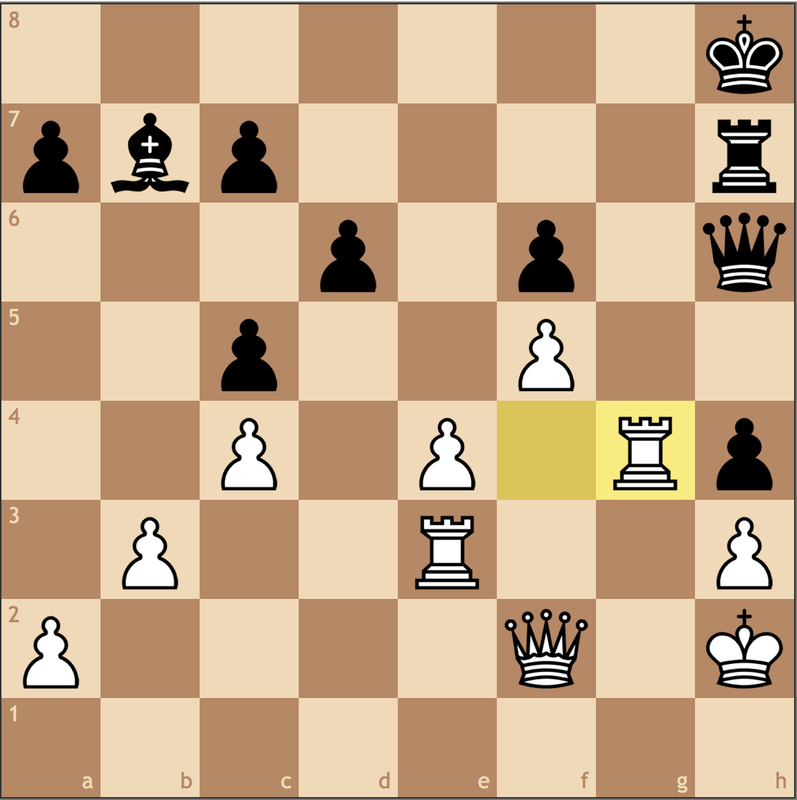 Navara spent 20 minutes on this next, and made the most contesting move on the board. 20. e5! Right now both sides are playing accurately. 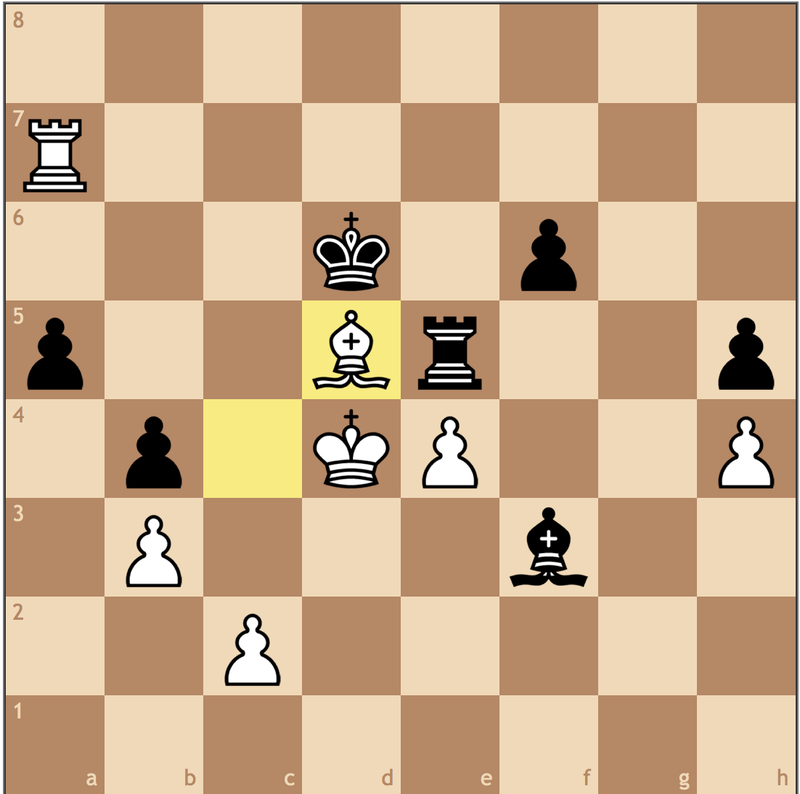 Black is trying to solidify his kingside, while White is trying to gain access to critical squares on the queenside. 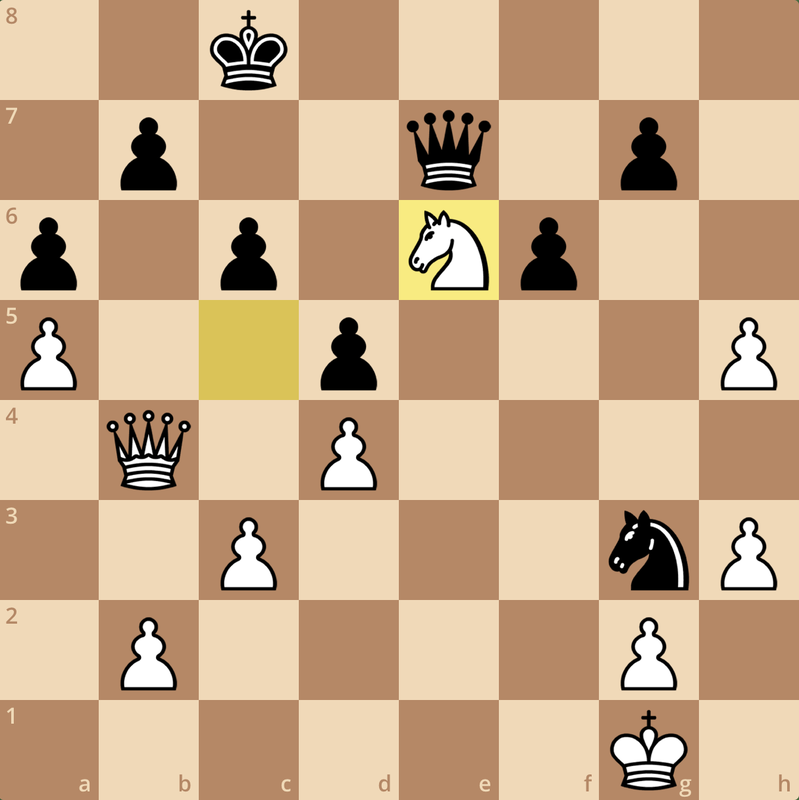 For example, were Black to stand idle, White could march his pawn to a6, giving him control of the b7 square for his rook to then win the game. Black’s logic here is that while he may be less active, if he can remain solid, White will not have enough to exploit his advantage. Let’s see if this holds true. 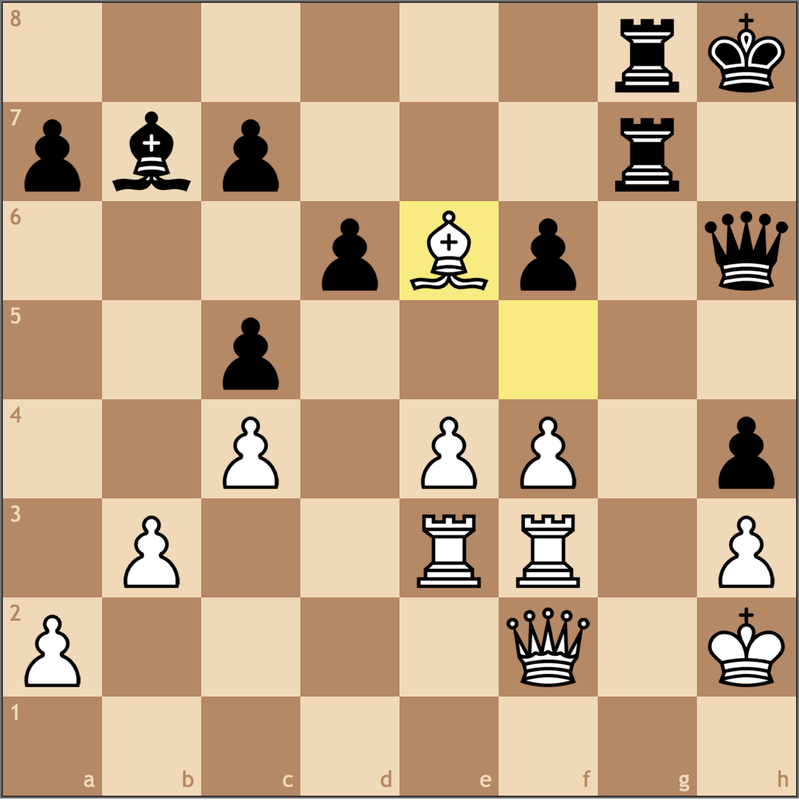 In this position it is White to move, but in the current position after 24… Rd5 it is White to move. What’s changed? White got in Rb1-b4 and now has an extra tempo to improve his position. 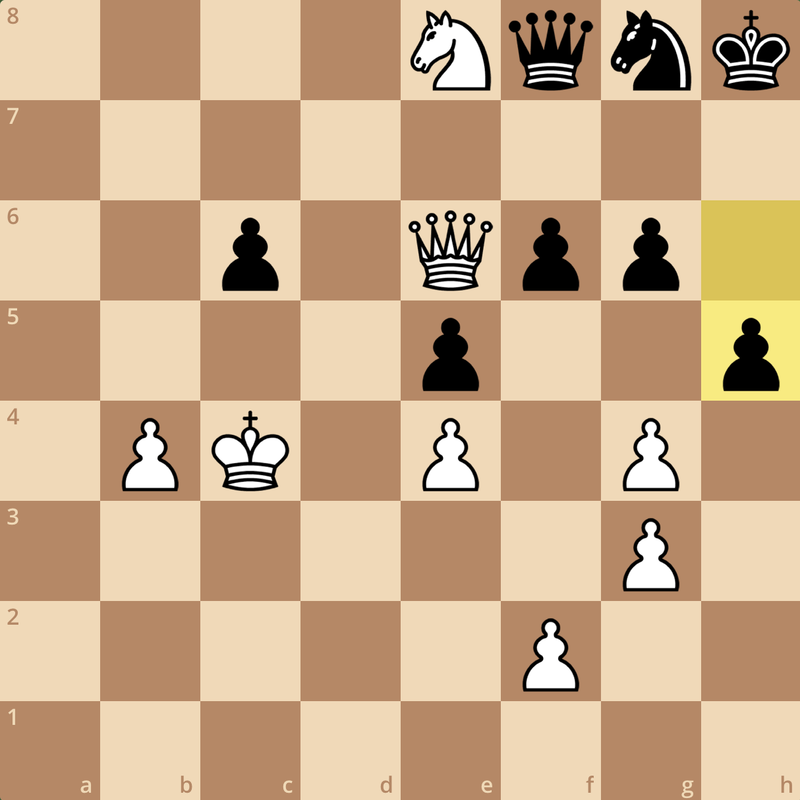 By infiltrating deep into the b-file, Black had to block out White’s rook from raiding the kingside pawns, so this line is actually rather forced. 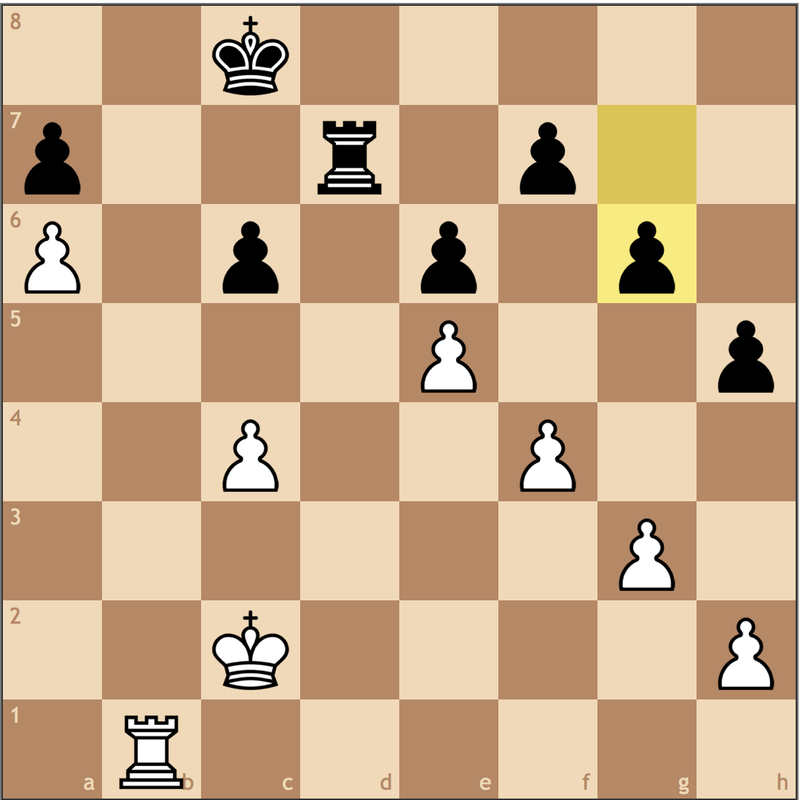 While Black should still be able to hold here, it’s small moments like these that count towards building a winning position. 25. g3 Rc5+ 26. Kb3 Rd5 27. c4 Rd2?! Here’s where Black starts to go wrong. As we mentioned earlier, the rook was no better on d5 than it was on d8, and so the same applies to d2. 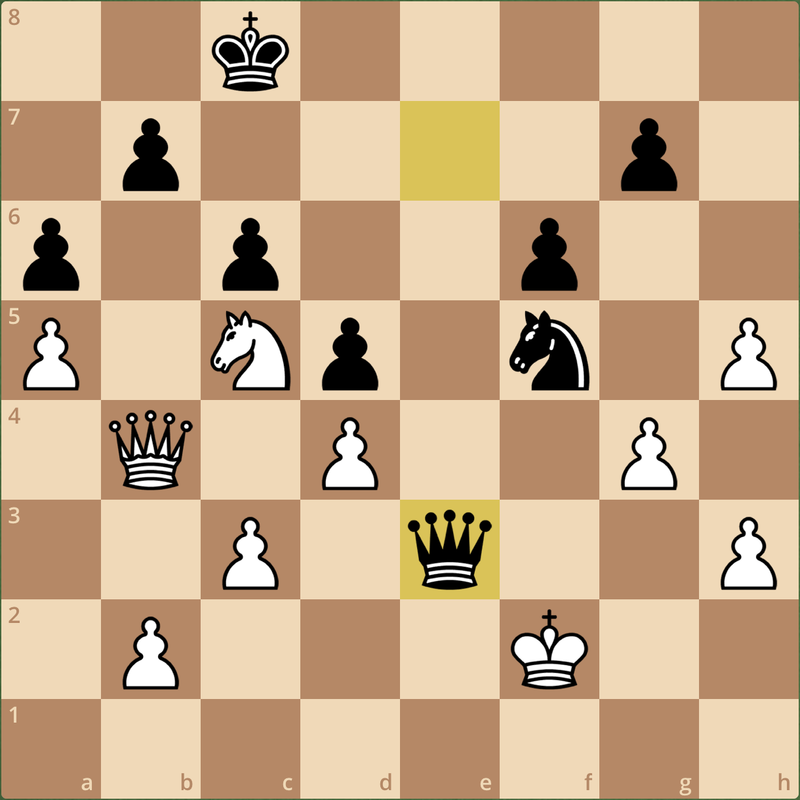 Black cannot afford to allow White’s rook to enter the 7th rank without resistance, as the a-pawn will fall, and it’s White’s passed pawn that will matter more than Black’s. Still, White can’t play 28. 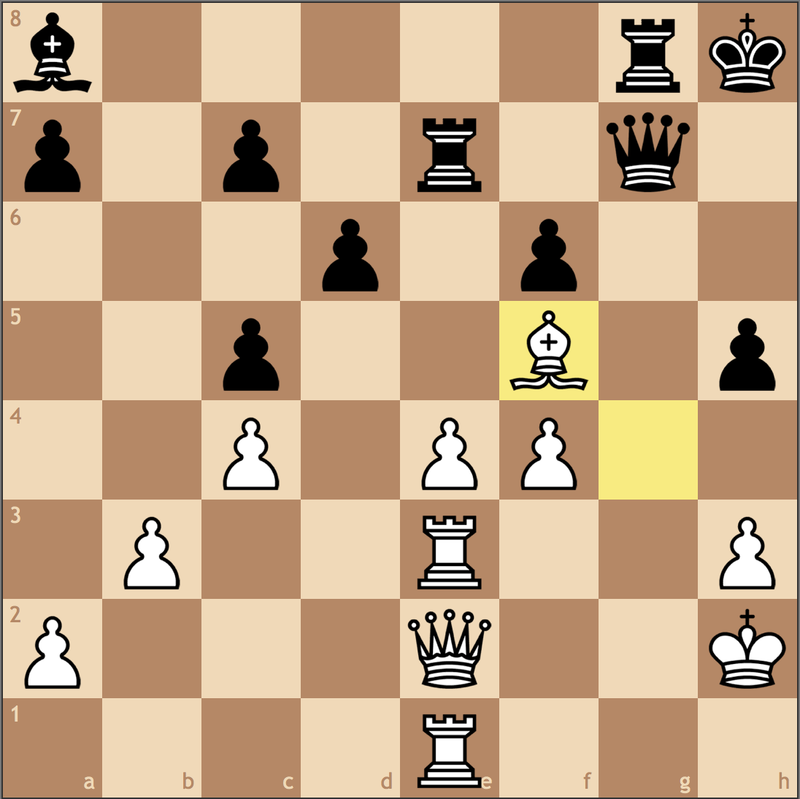 Rb7+ yet, so he makes the one move that wasn’t possible just one move ago. 28. a5! 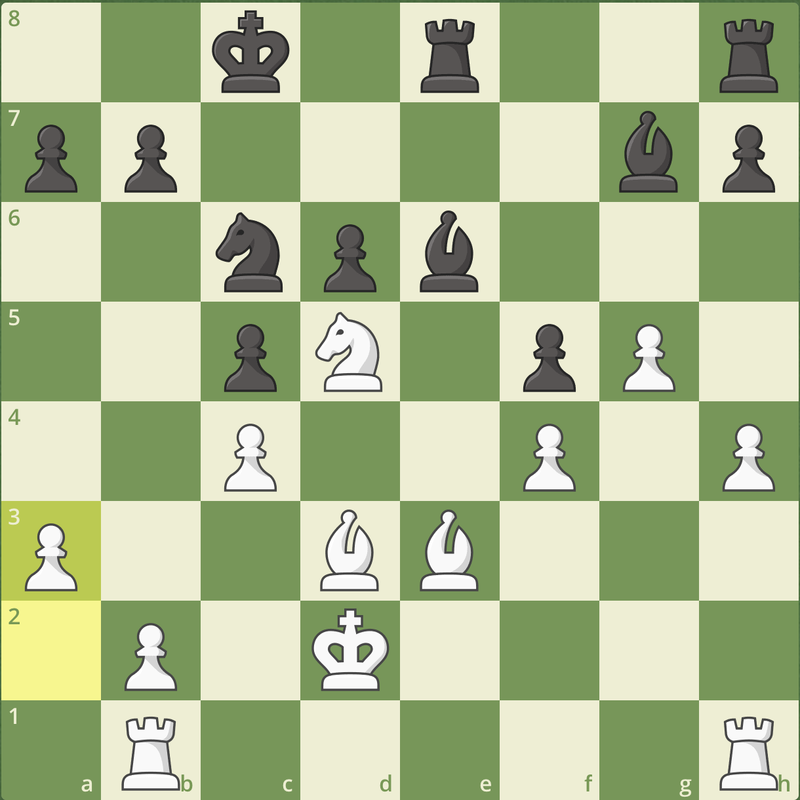 White will have to try and create a weakness on the kingside, but his rook can’t run too far astray since Black can play …Kc7-b6 and attack the a-pawn. 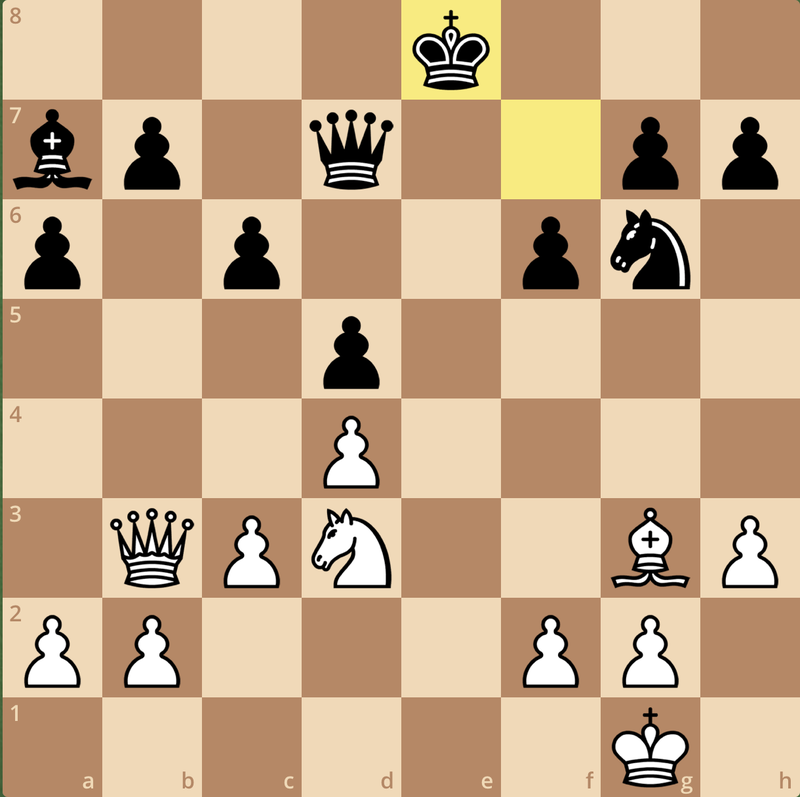 It’s an ugly position to have to defend, but since White’s king can’t get to the kingside thanks to the Black rook, Black should have good drawing chances. So how is this so different than what happened in the game? It turns out that not inserting this one check before retreating to d7 still gives White something to play for with an active king. 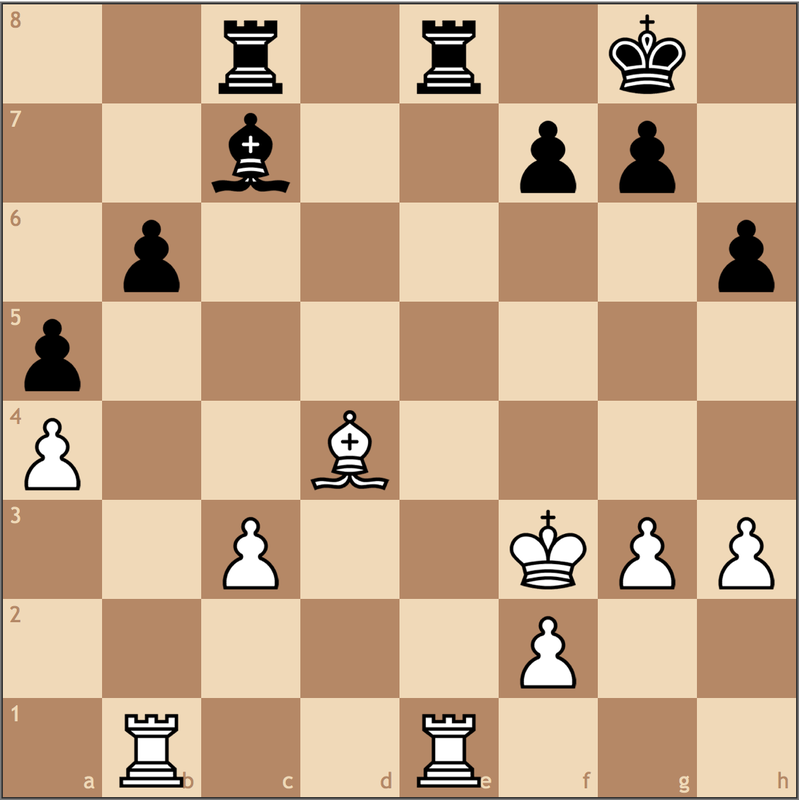 If Jobava had played 28…Rd7, White’s king can enter the fray through a4, then later b4 and c5 – but admittedly this is very difficult to win. Instead, Jobava offers Navara an oppotunity. 28…Kd8? 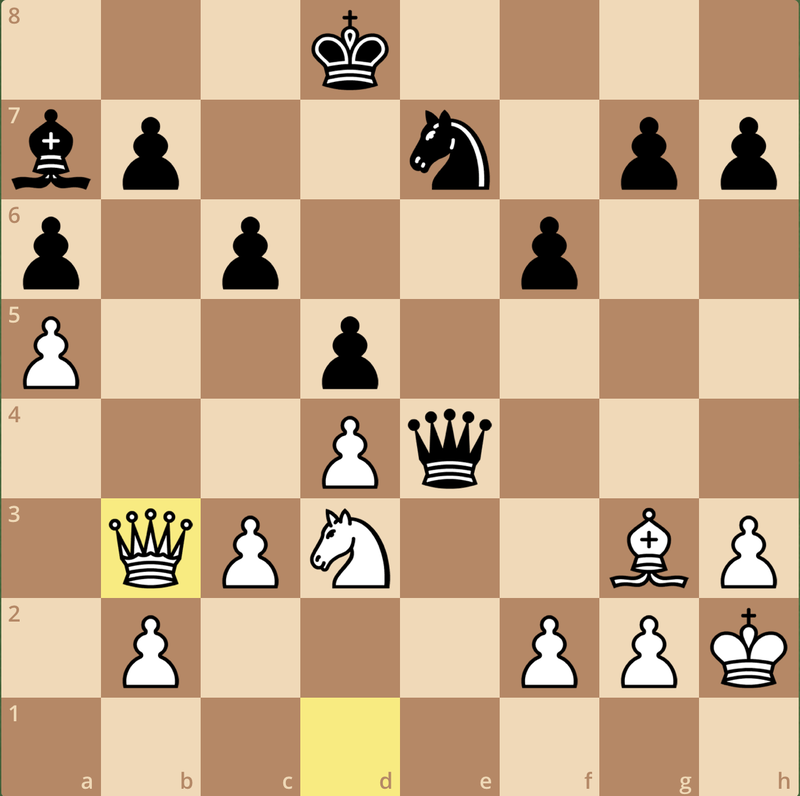 The last move underestimated a resource to draw, but this move gives White an opportunity to play for more! 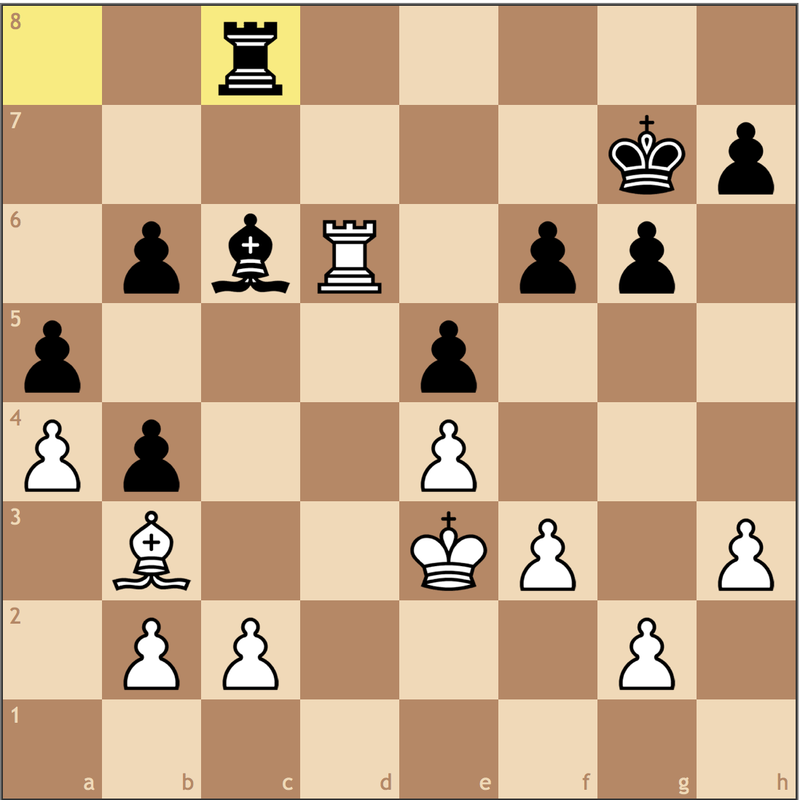 While White can’t win material, his rook would be much better placed on f8 or g8 than it is currently on b4. Navara wastes no time in reaching his desired position. 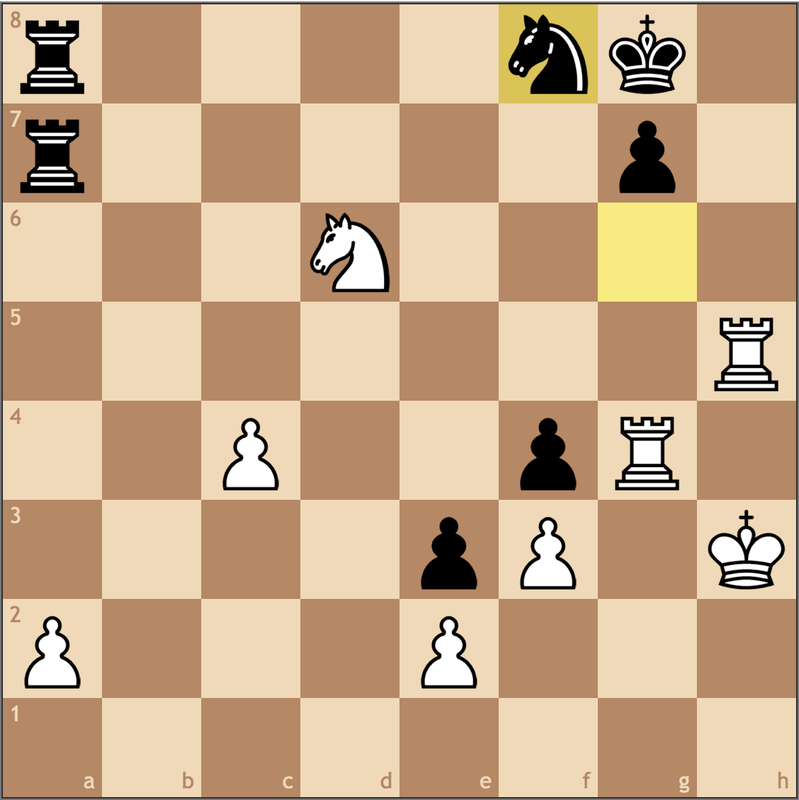 Since Black cannot make any productive moves, White decides it makes sense to open the h-file so his rook has more options. 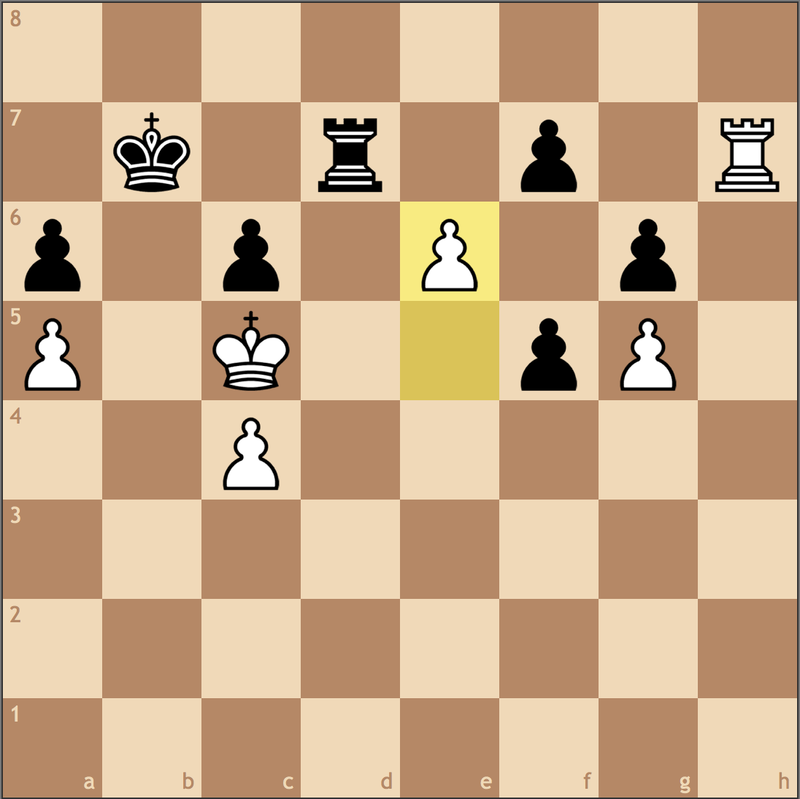 In this position, Black has three weaknesses: the 7th rank, the d6 square, and the b6 square. 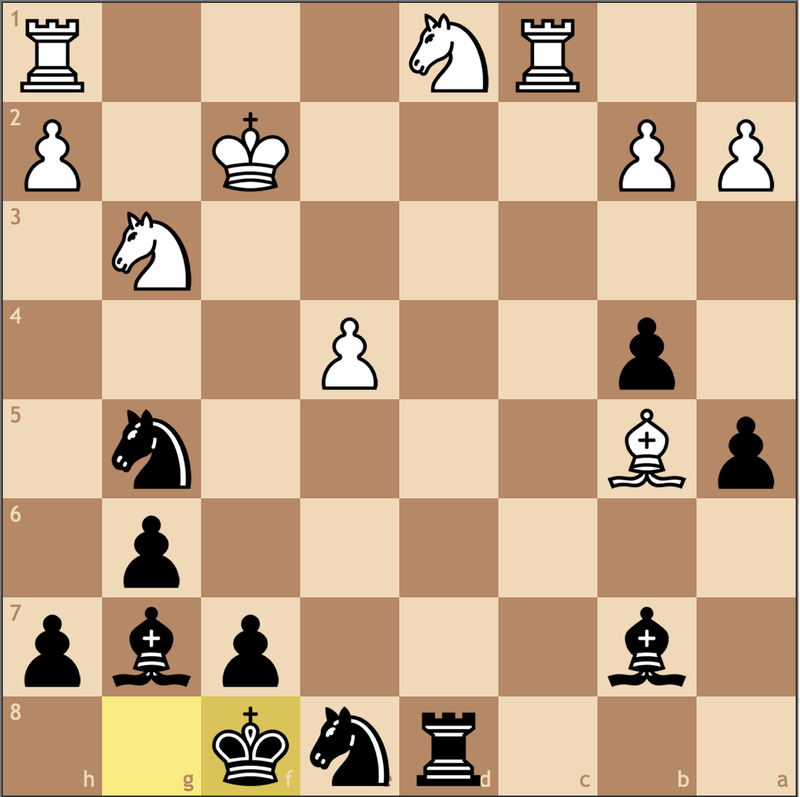 At the precise moment, Navara will relocate his rook to attack Black’s weak queenside pawn structure. 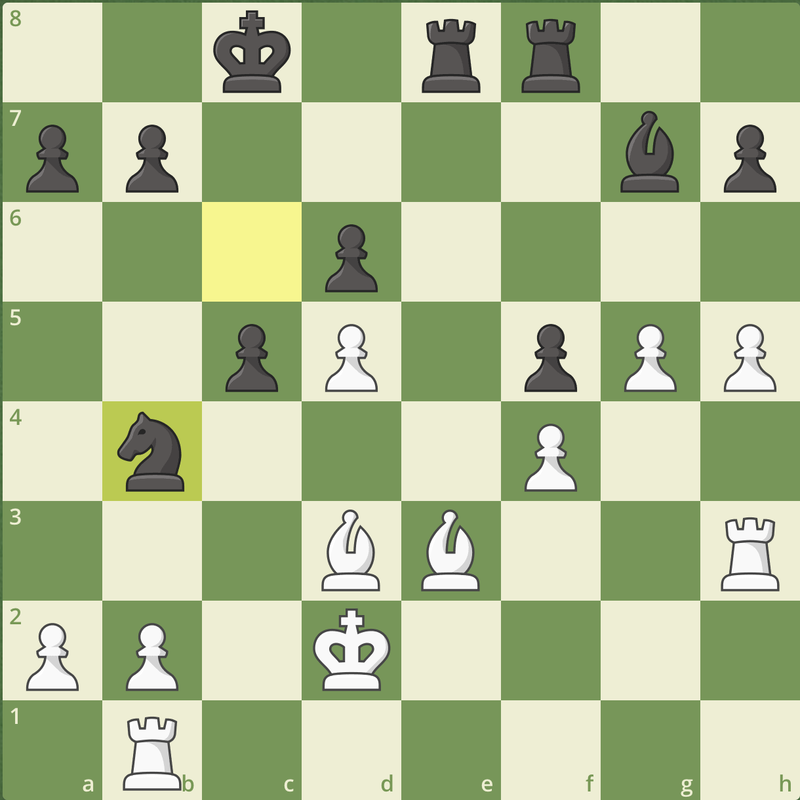 For a second it seems like Black’s rook has become active, but there’s a cute trick here to force the rook back to e7 (not d7)! 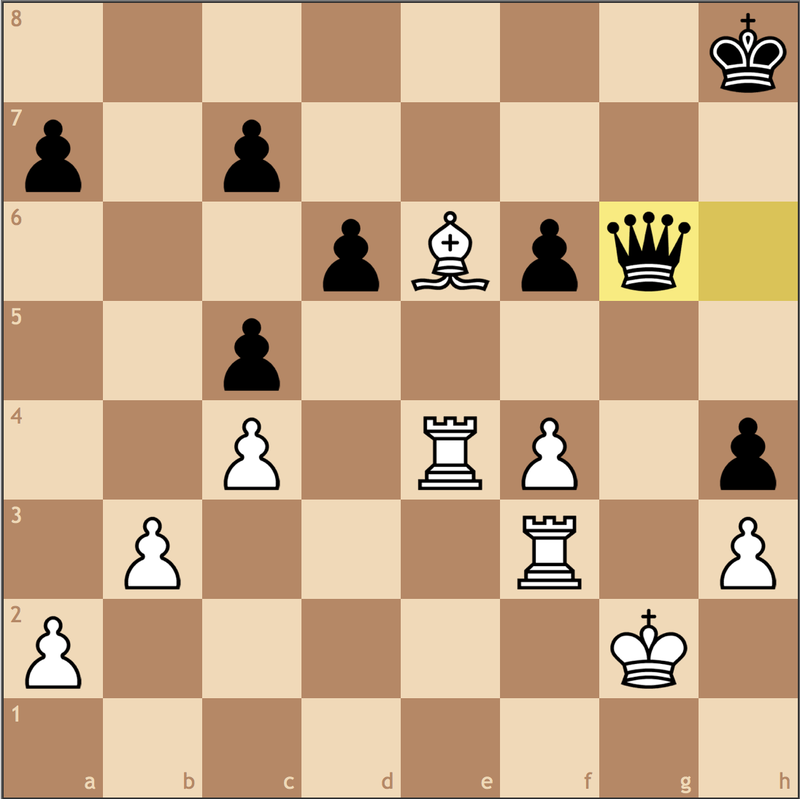 Jobava was so dissatisfied with this endgame he actually resigned to the Czech Grandmaster! 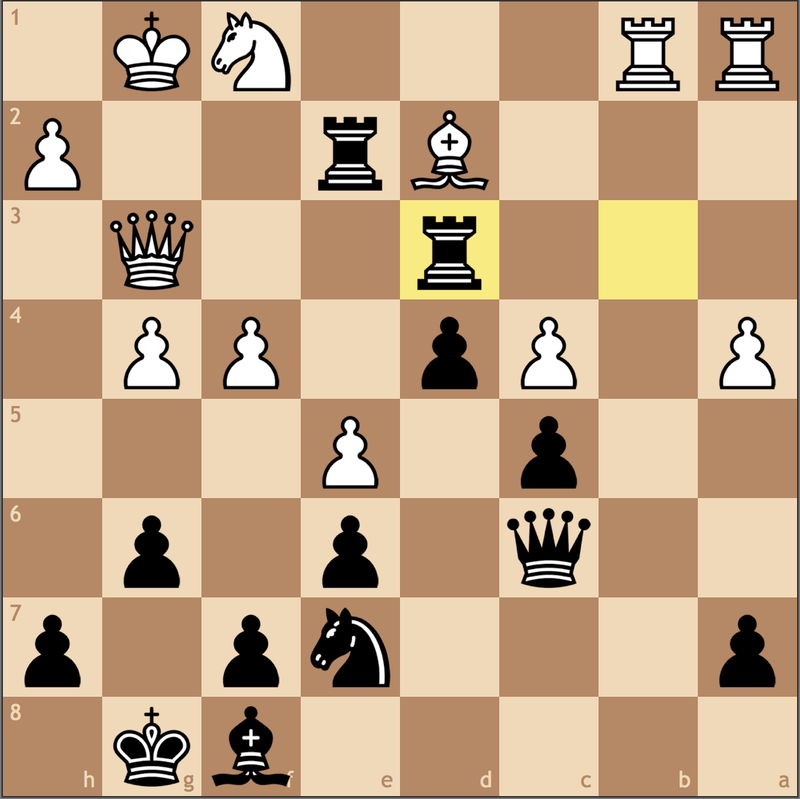 In this position, Black is more or less obliged to play 42… Re7 because after 42… Kb7 43. f5!! 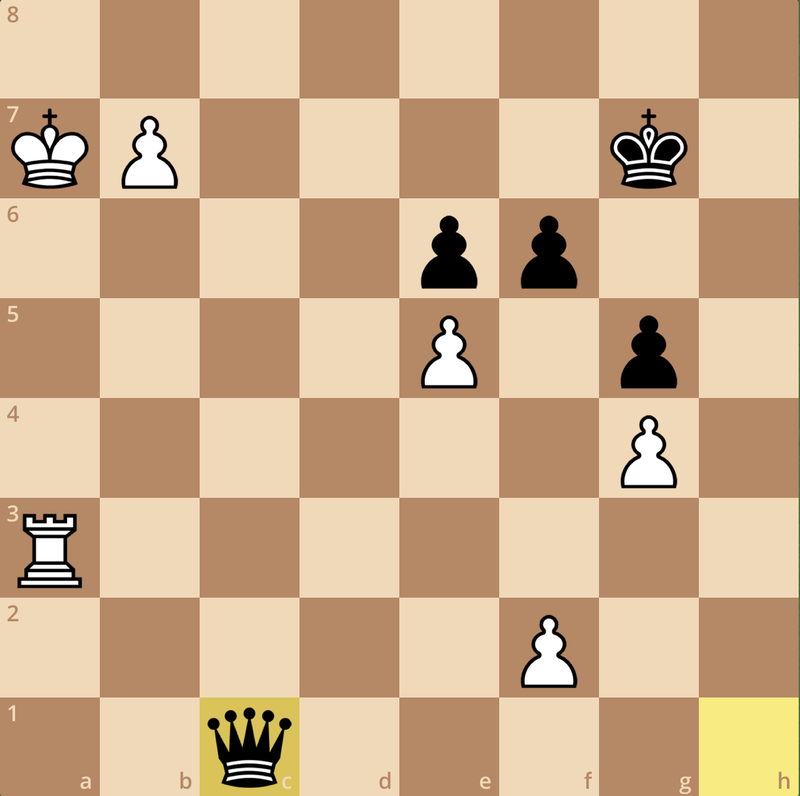 actually leads to forced mate. 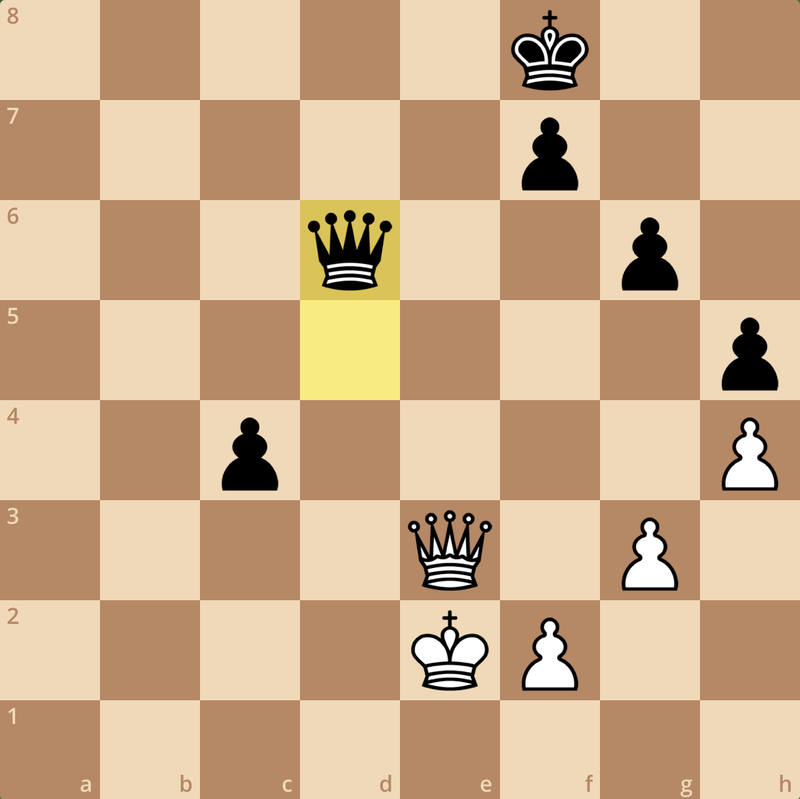 The pawn is poisoned since a move like 43…exf5 loses immediately to 44. e6 and White will have managed to trade rooks and gained a queen on the way. So 42… Re7 is the only move that doesn’t lose immediately. However this move also fails to defend adequately because now when White plays 43. 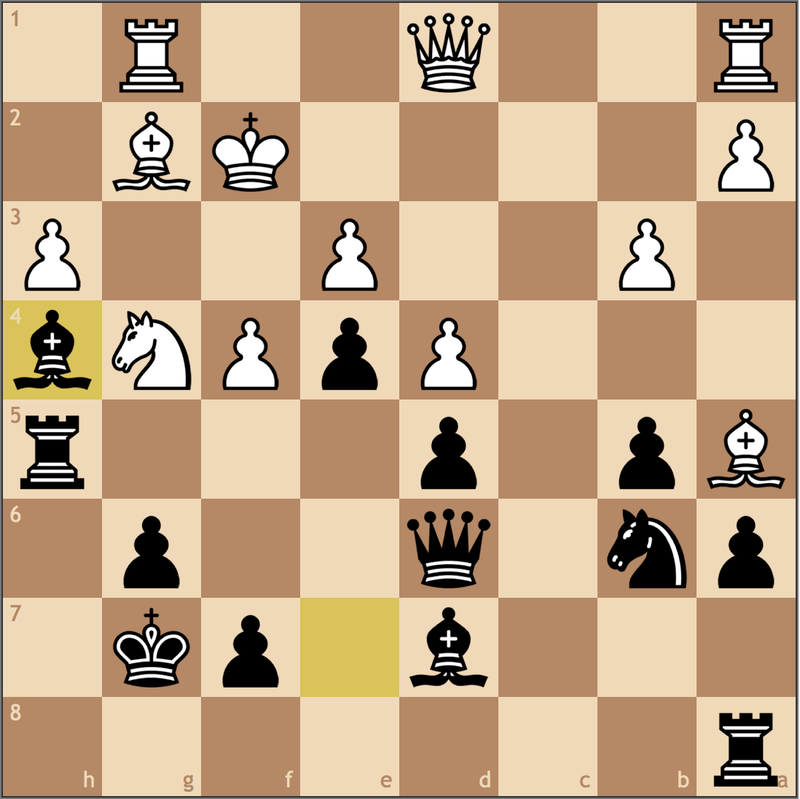 Rh2, Black can’t also activate his rook since it needs one tempo to reach the d-file again, so after 43… Rd7 44. Rb2 Rd3 45. 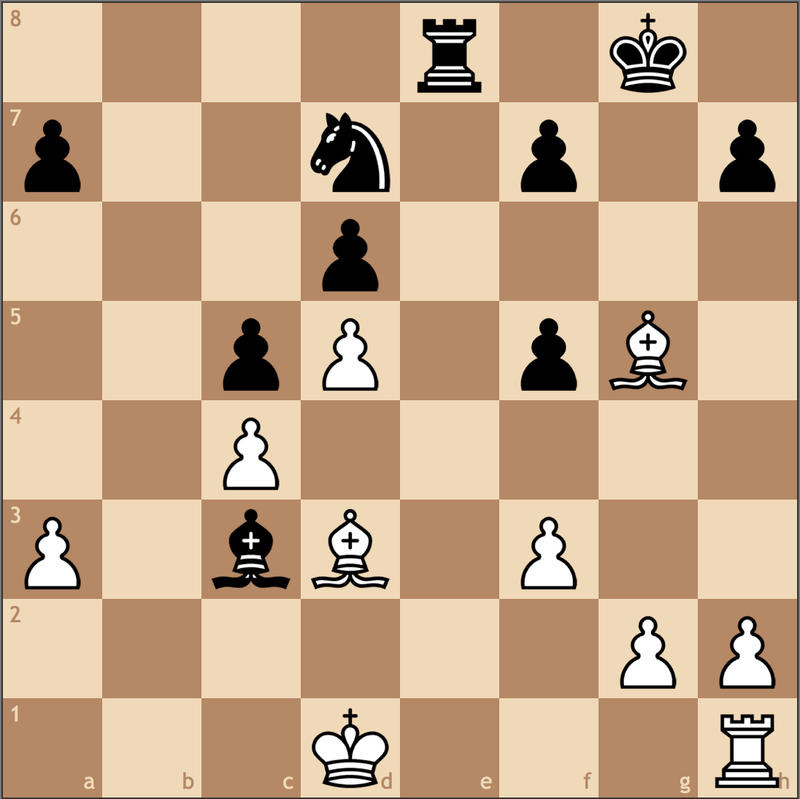 Rb6, White will win Black’s queenside, and the win of the f-pawn doesn’t help Black. 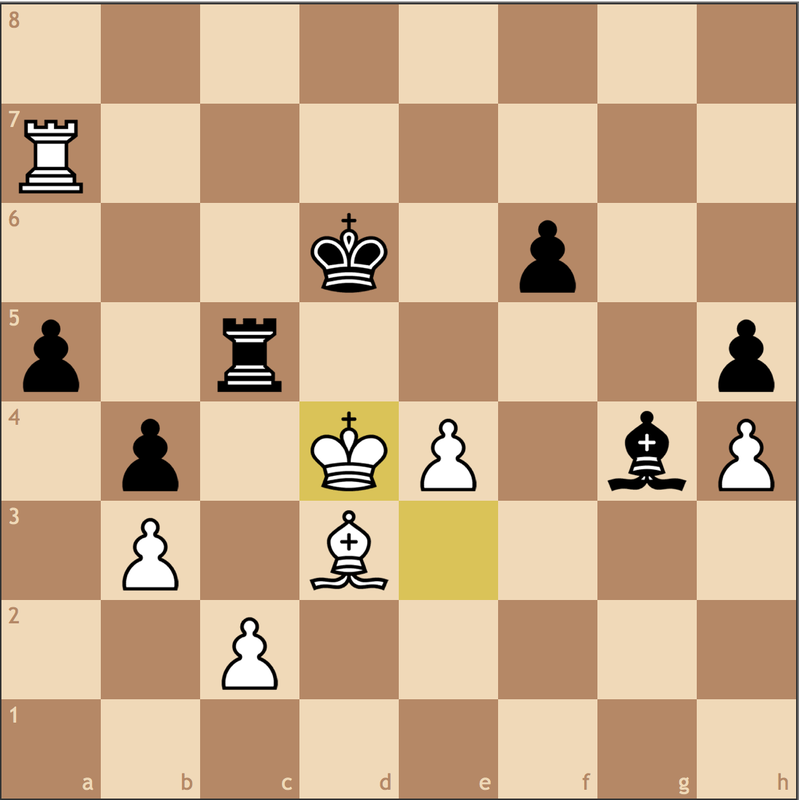 Black’s endgame was actually difficult to hold, and after only one real mistake, Jobava completely collapsed. I thought this game was instructive for a couple of reasons. 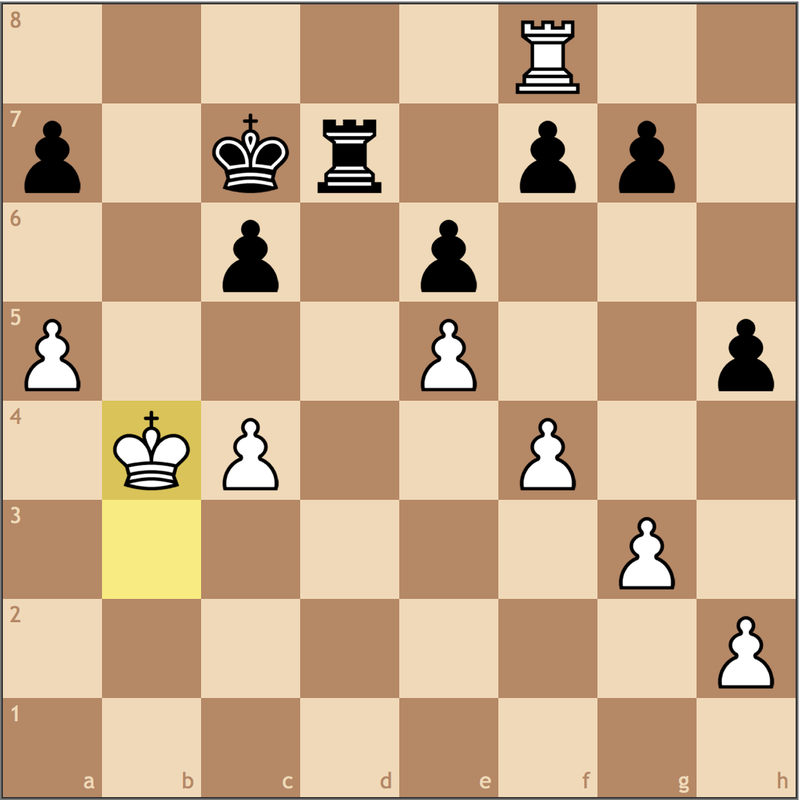 First it showed us how to press a minuscule advantage, while also using the idea of marching the a-pawn to use the b7 square. This game also showed us that sometimes its possible to hold difficult positions as long as we only have one weakness. I think Jobava may have seen this bunker idea, but thought it would fall apart in the long-run. For a human it may be difficult to hold, but it was really Black’s only real chance of saving the game. Lastly, Navara showed us the importance of gaining tempi at various points of the game. While an extra small improvement may not seem significant in a particular moment of the game, such extra moves add up and become overwhelming. 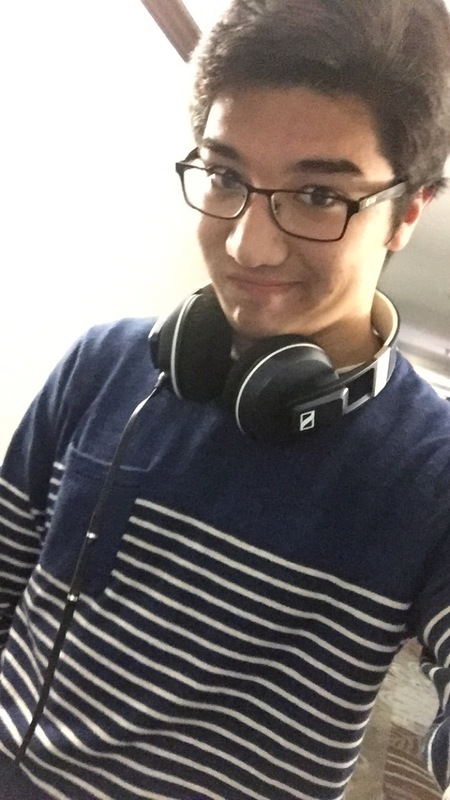 As I mentioned earlier this week, I’ll be in Washington DC for a tournament this weekend, so I won’t be able to post a video this weekend. Make sure to look out for a post next week on my performance! The Cherry Blossom Classic promises to be a tough tournament, and I’ll be hoping to continue my luck from New York! 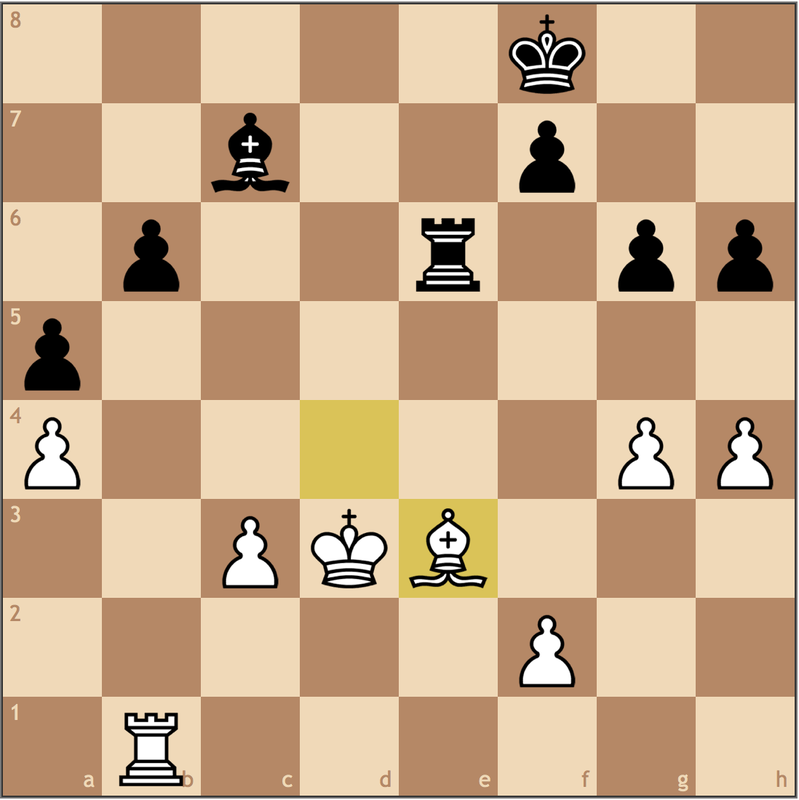 In the game, Svidler made the logical move, 48. 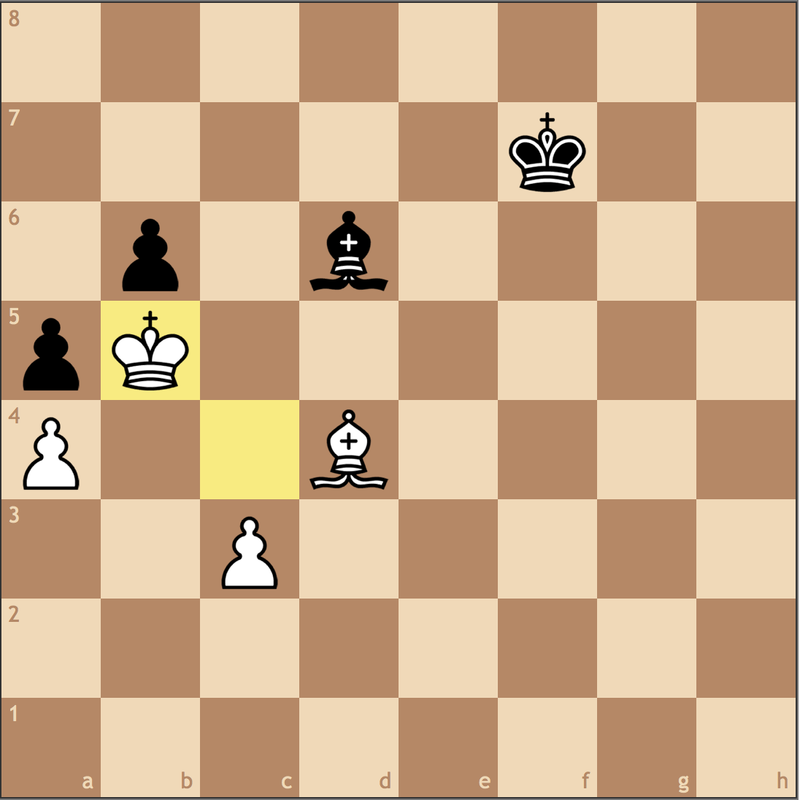 Rxf4, after which the game followed 48… Rxa2 49. Rfh4 g6 50. Re5 with a draw. 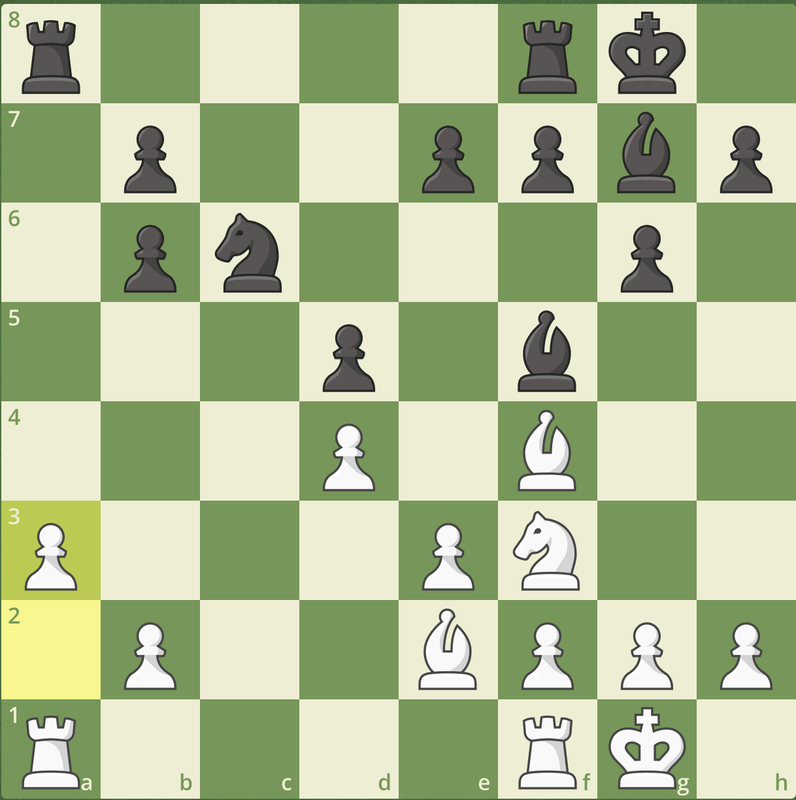 I don’t think it’s fair to compare White’s choice to that of an engine, but Stockfish’s recommendation here is particularly instructive – 48. Re5! 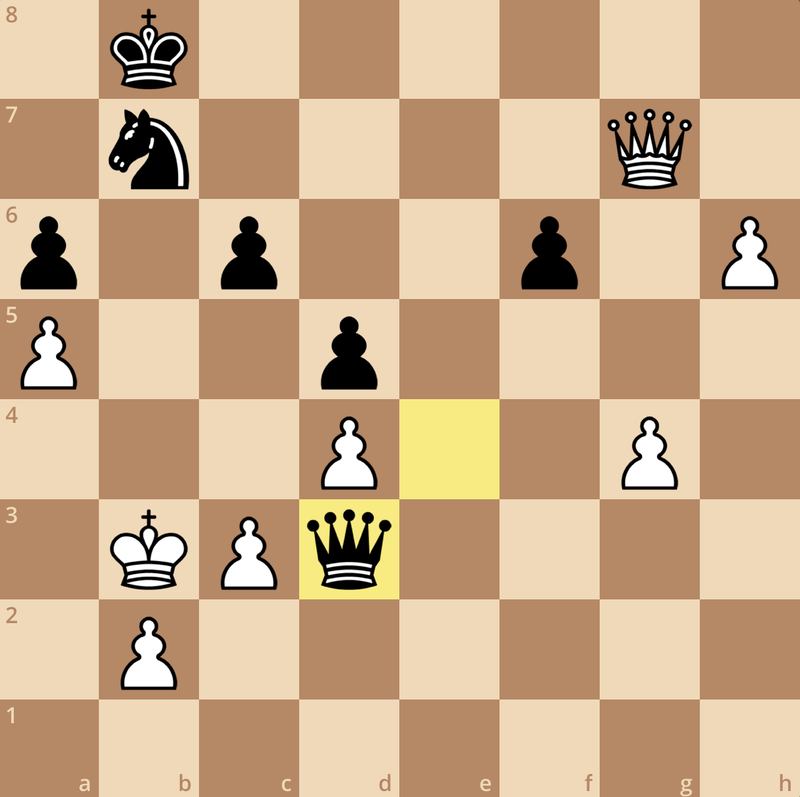 with a big plus for White. The point is that after 48…Rxa2 49. Re7 g6 50. 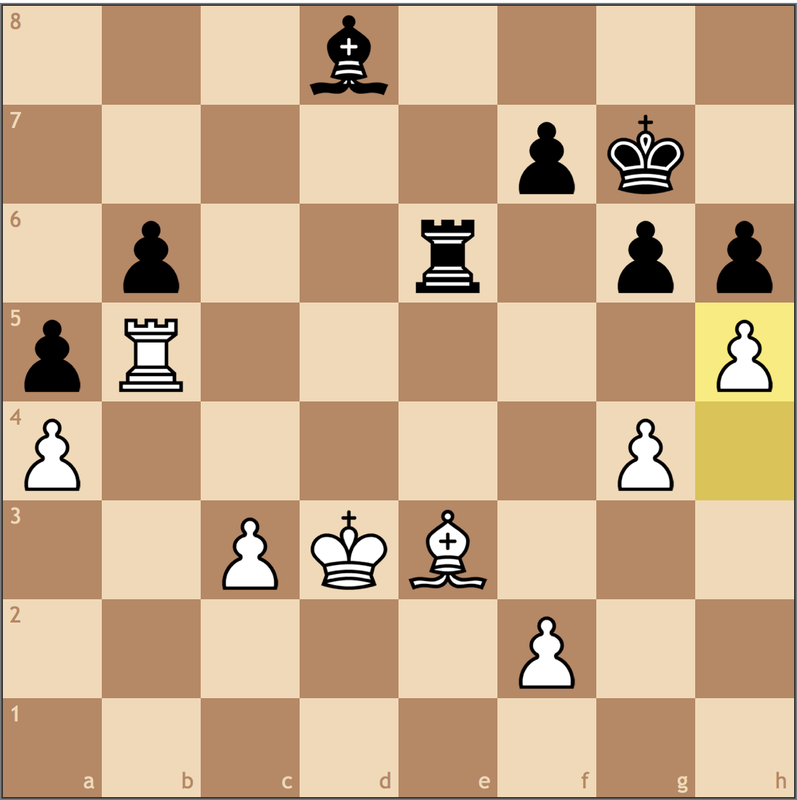 Rxf4, White’s rooks are a lot more active than Black’s and now both the e3 pawn and the 7th rank are weak. 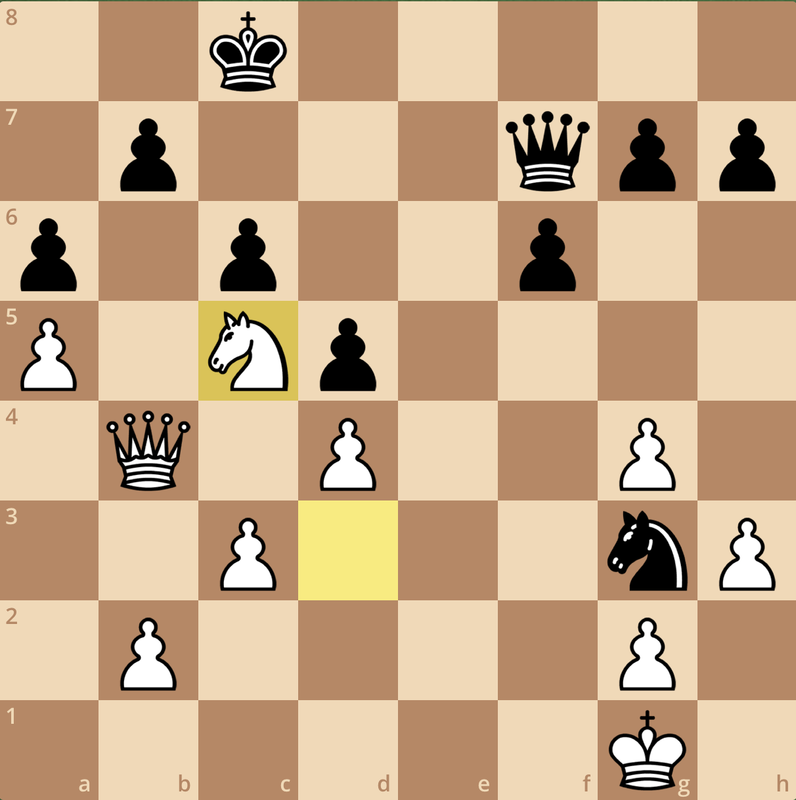 Furthermore, Black’s knight on f8 is out of commission with no pleasant square for refuge. Again, it’s hard to fault Svidler for the miss, but the engine shows us here that activity is stronger than material (for more of my thoughts on engines, here’s a post from last year). What this should tell us is that the heuristics we’ve identified thus far should always be at the forefront of our attention. However, sometimes we don’t have the convenience of having a better position. In such cases, one strategy is to strengthen our structure by gaining space in the aims to restrict our opponent. If I had to choose a “one-move” example of this, it would be from this past year’s Tata Steel. At a first glance, the position is seemingly equal. Navara has a broken pawn structure, but his activity offers enough compensation. 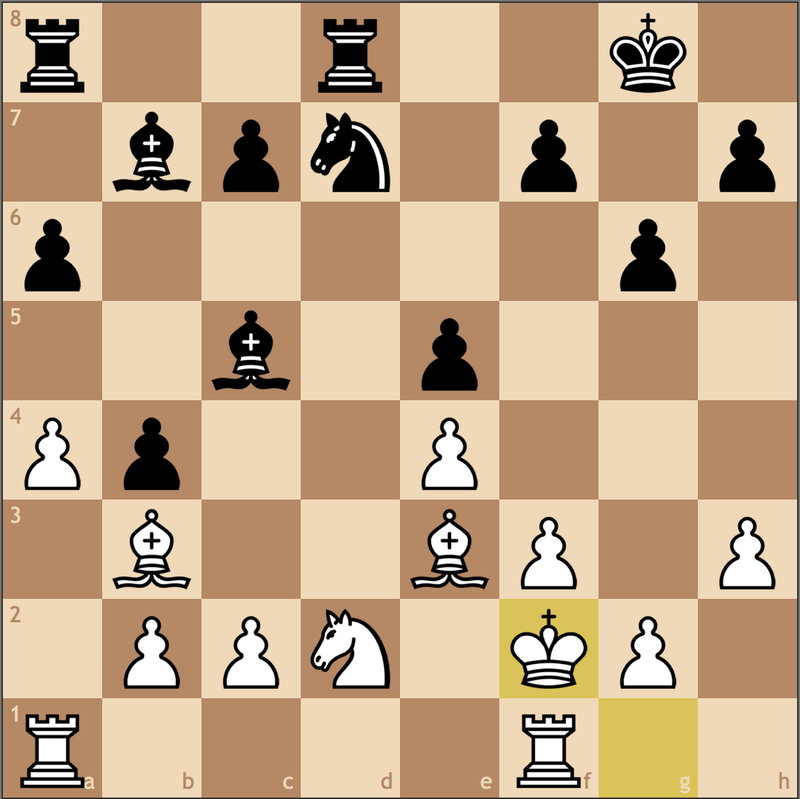 If White had moved the bishop here from d5, Black would immediately take the second rank with …Rd6-d2!, seizing the initiative and potentially the game. This is why Navara chose 35. 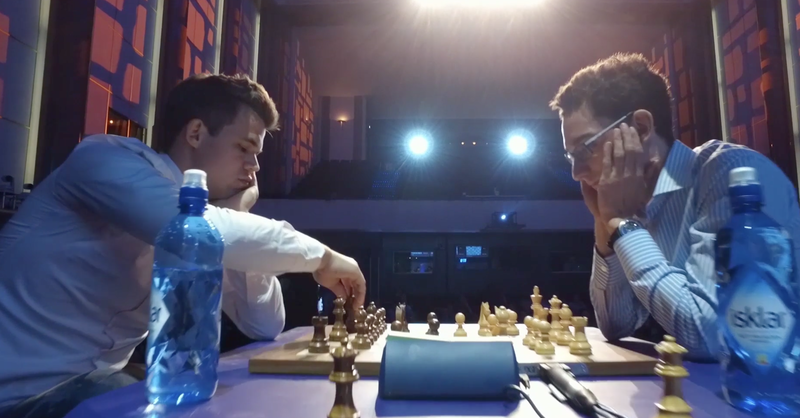 c4!, protecting the bishop, but also showing Caruana how inactive his rook really is. 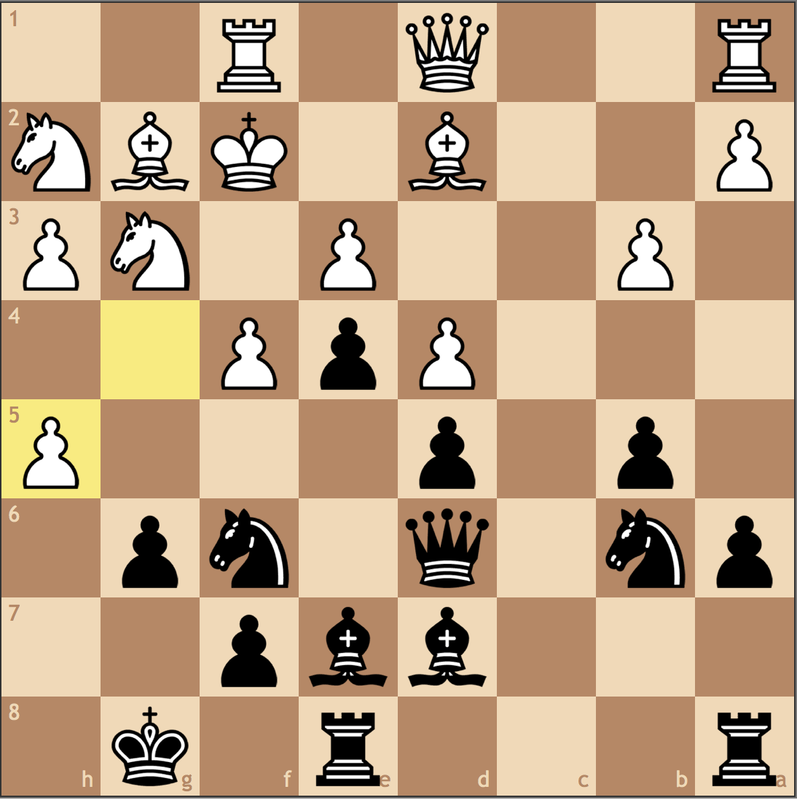 From d6, the Black rook has limited options, and can’t easily put itself on the e-file. 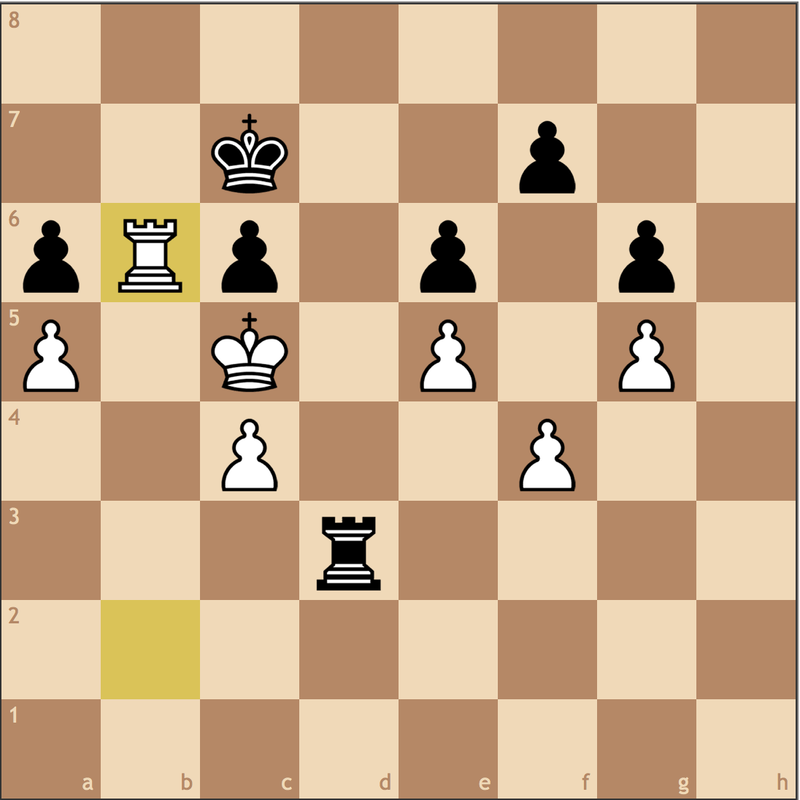 The Czech player went on to win a very nice endgame, and I encourage you to see its continuation here. 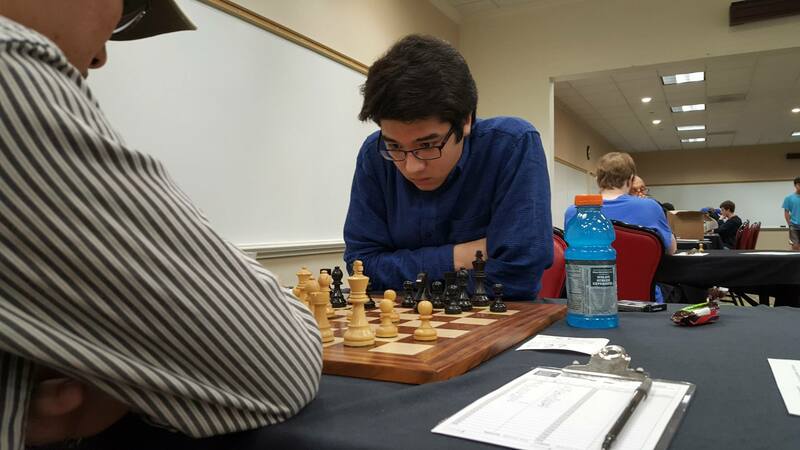 Navara is an extremely talented player, and perhaps will one day break the top ten, but as with the previous posts, the focus of today’s post is the reigning World Champion! 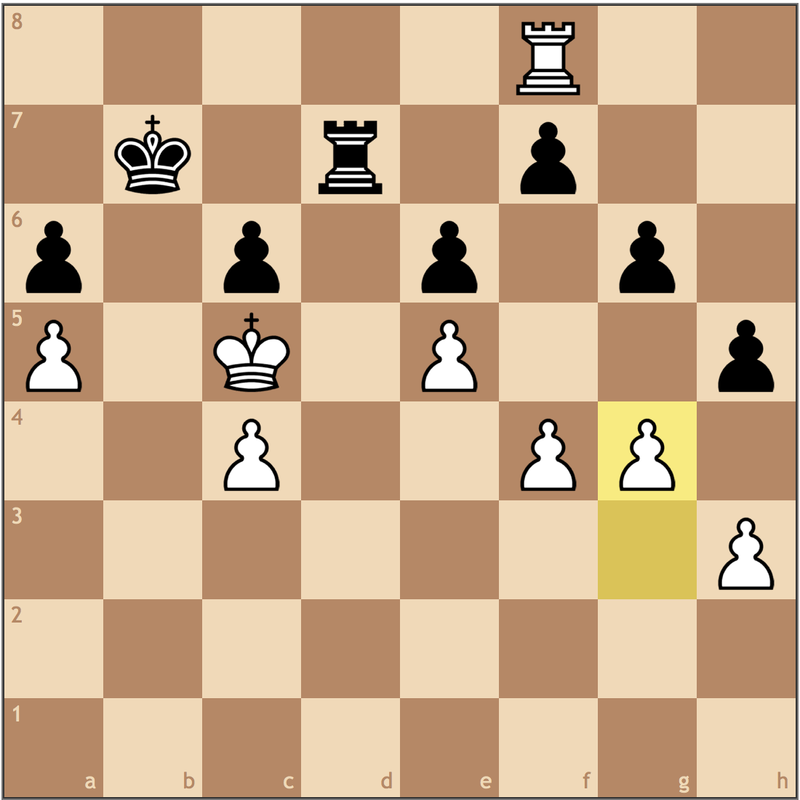 Naturally, improving a pawn structure takes more than one move, but I thought this case illustrates the aims of the expanding side quite nicely. As we have throughout this series, we’ll take a look at a few examples from Magnus Carlsen’s past victories, this time from 2012 and 2013. Before deciding on a structure, Carlsen has decided to optimize his pieces. By putting pressure on his opponent first, he will have a better idea of what structures will give him the best winning chances. 25…Be5 26. Re1 Kg7 27. Bg3! The starting point for today! 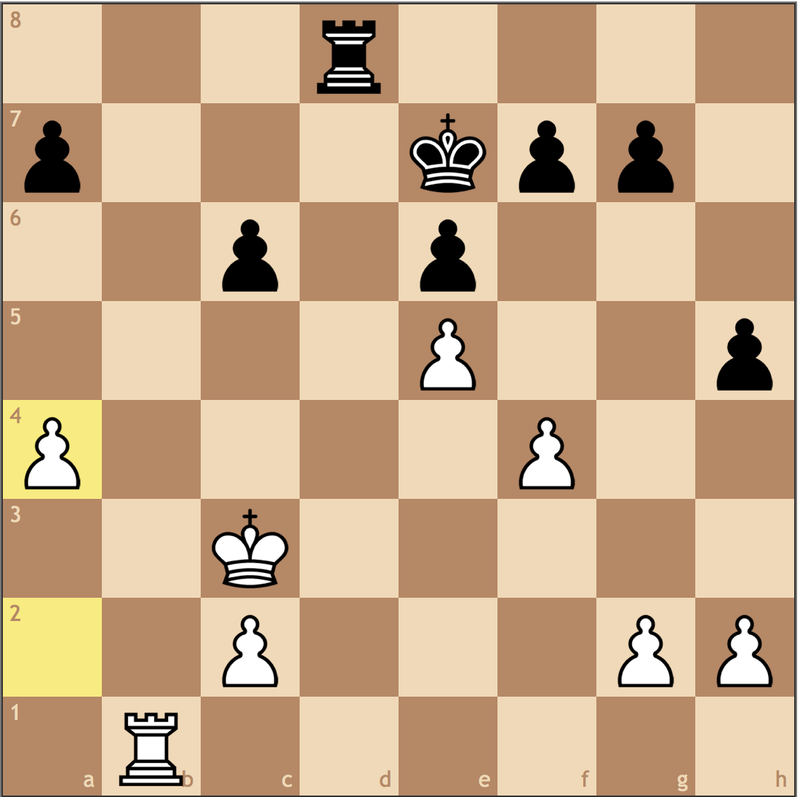 With this move, Carlsen intends f3-f4, fixing the weakness on f5, and limiting his opponent’s bishop’s mobility. Already, holding the file and keeping his position intact is getting uncomfortable. Relocating the bishop the long diagonal is a clear idea, but Carlsen wants to gain space on the kingside with his h- and g-pawns. 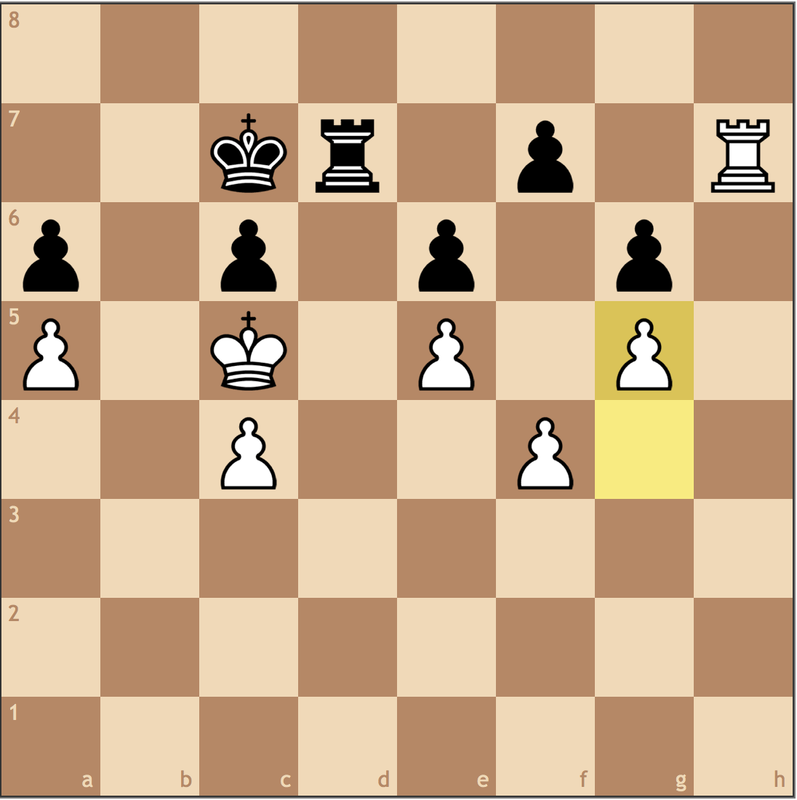 Again, there’s no rush to take on f5, the pawn can’t go anywhere, thanks to the pawn on f4. 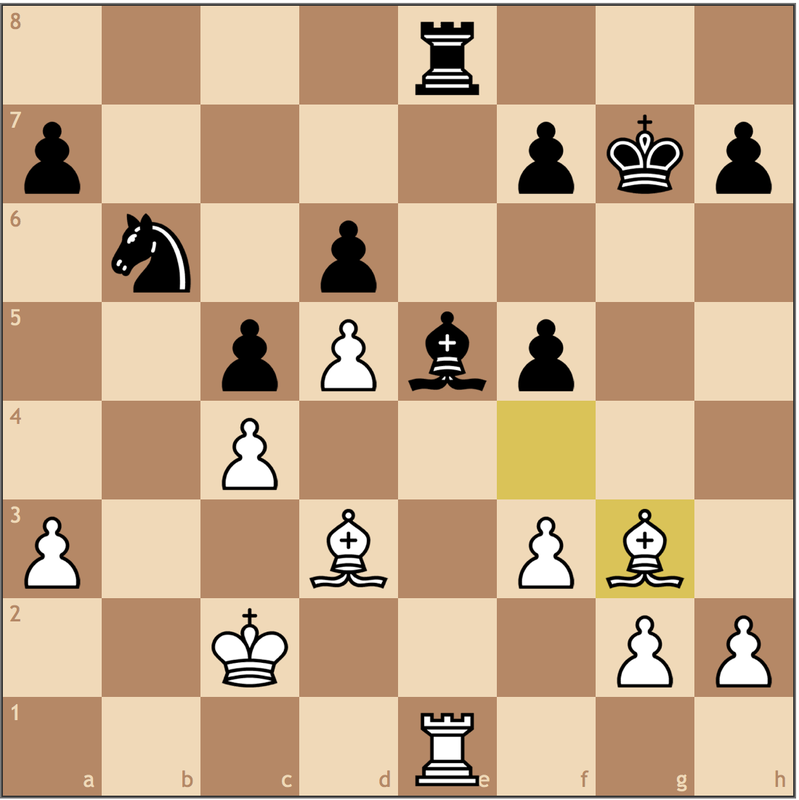 Perhaps it was premature, but Van Wely resigned here in light of 34. g4, finally winning the f5 pawn. 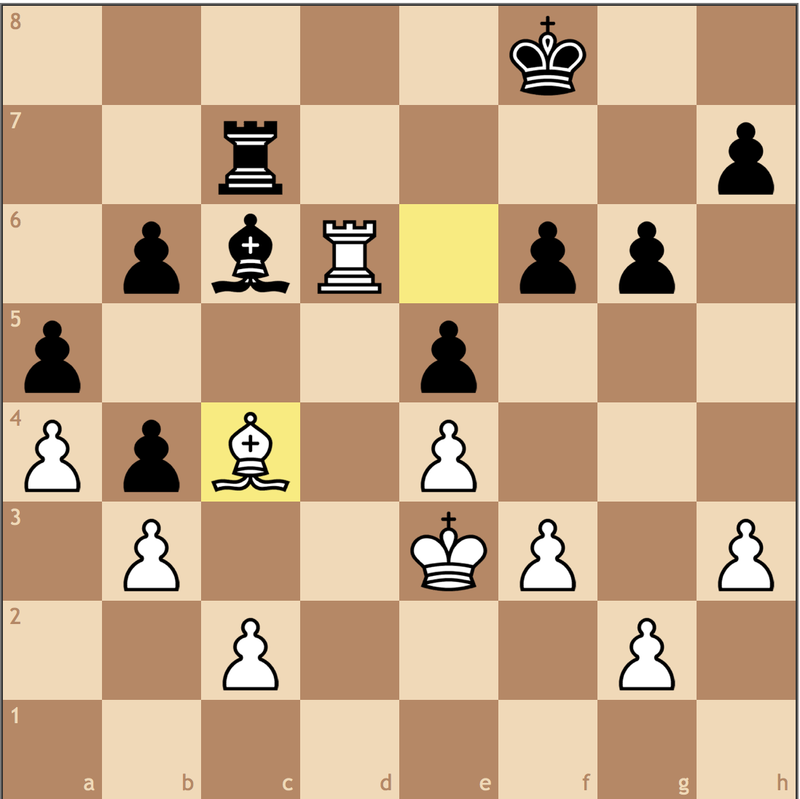 With the bishop pair and a healthy material advantage, White should win with relative ease. This is an important endgame because it shows us that long-term weaknesses can usually not be held by tactical means forever. White maximized a static advantage by fixing the f5 pawn and trading rooks, making it difficult for Black to create counterplay. In this position, both sides have exactly one weakness. 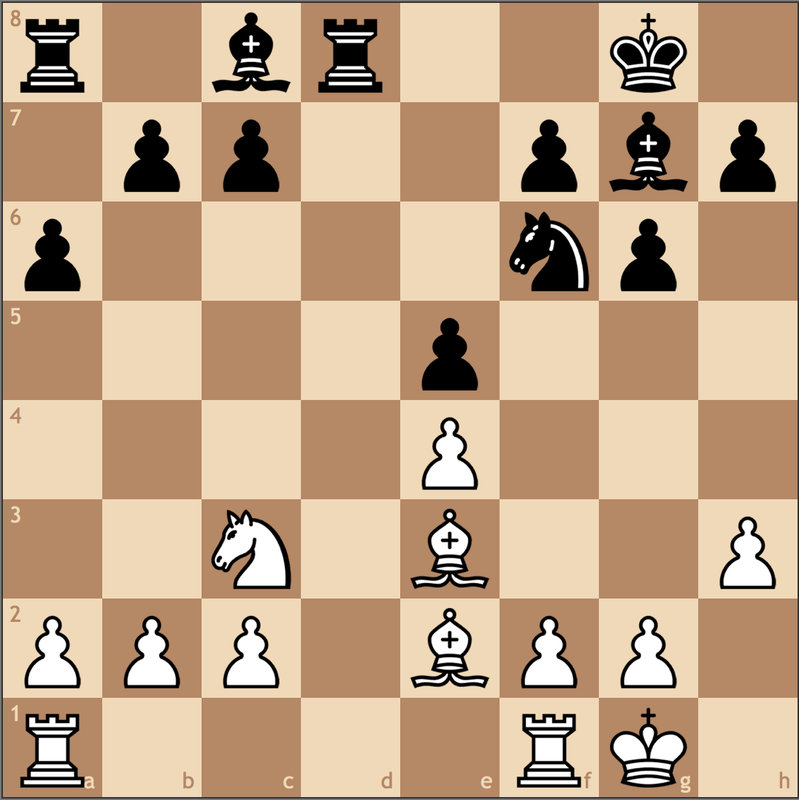 For White, the isolated c-pawn is a clear target, and for Black, the backward pawn on b6 is also an issue. I think here many players would try to exchange weaknesses, but, in this case, this mutually beneficial trade will only result in equality (Note that the immediate 29. 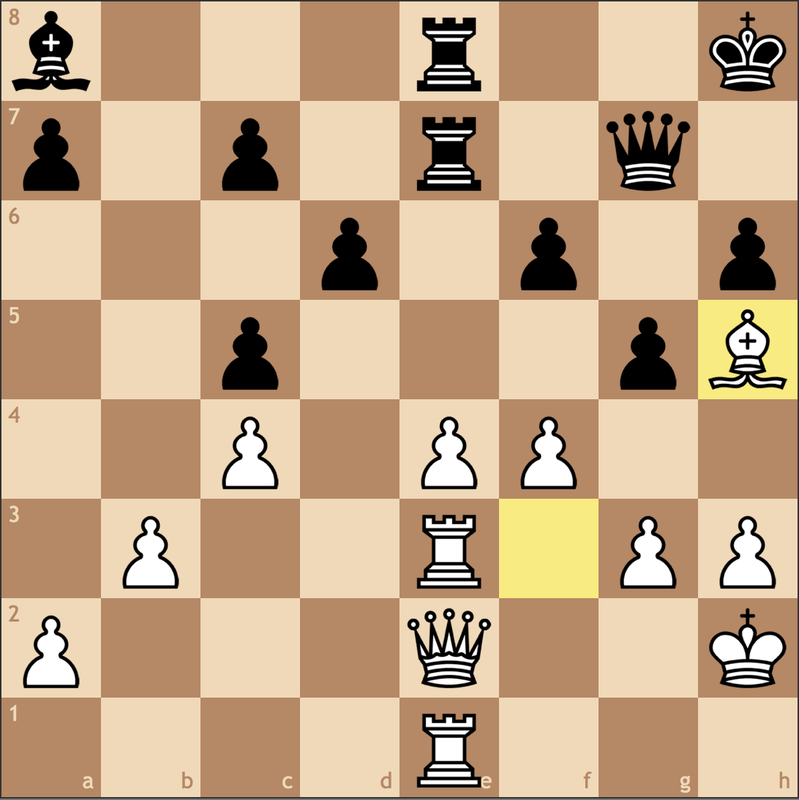 Bxb6 fails anyways to 29… Rxe1!, I mean this as a more long-term idea). 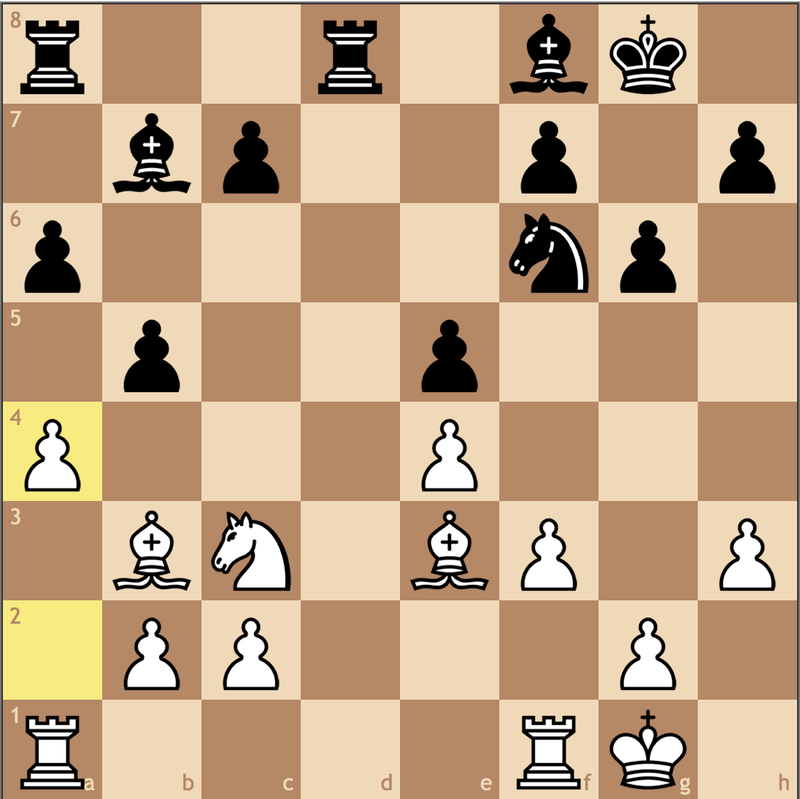 But here it could be argued that White’s position is simpler to play. The bishop on d4 is better placed than it’s counterpart on c7, and can’t easily be kicked from its outpost, thanks to the c3 pawn. Furthermore, it’s much easier for Magnus to put pressure on b6 than it is for Caruana to attack c3, so Black still needs to prove equality in this position. Knowing this, White decided that it was time to expand on the kingside. Even though it’s not yet clear how Magnus will use these pawns, we can say that he has improved his position, and now asks Black how he will relieve pressure on the b6 pawn. Caruana starts with an exchange and quickly claiming the e-file. 31…Rxe4 32. Kxe4 Re8+ 33. Kd3 Re6 34. Be3! And now it’s starting to become clear how Carlsen intends to use his kingside pawns. 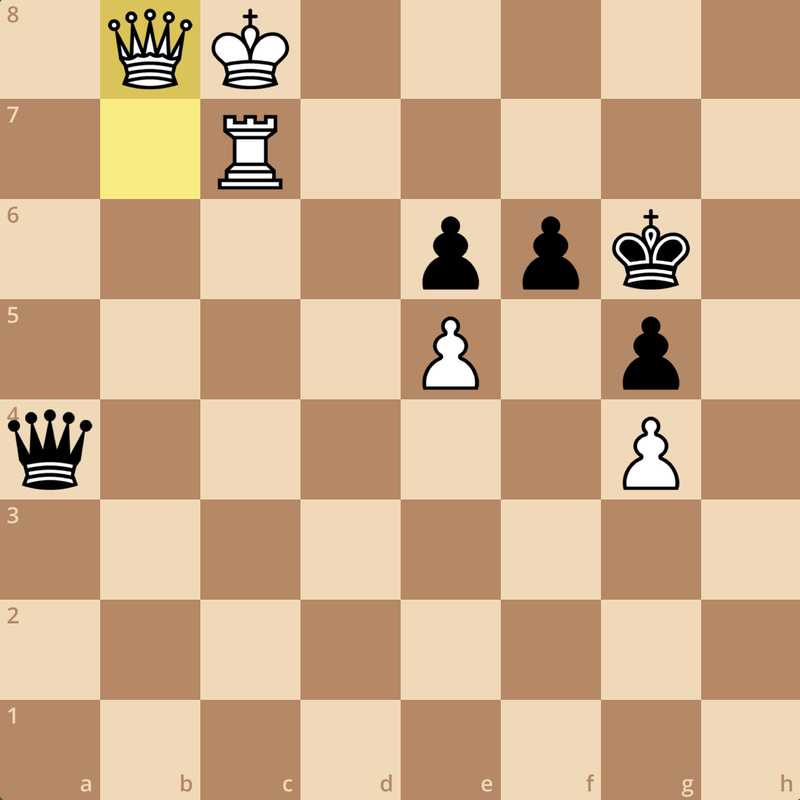 Should Black push ahead with 34…h5?! 35. gxh5 gxh5 36. 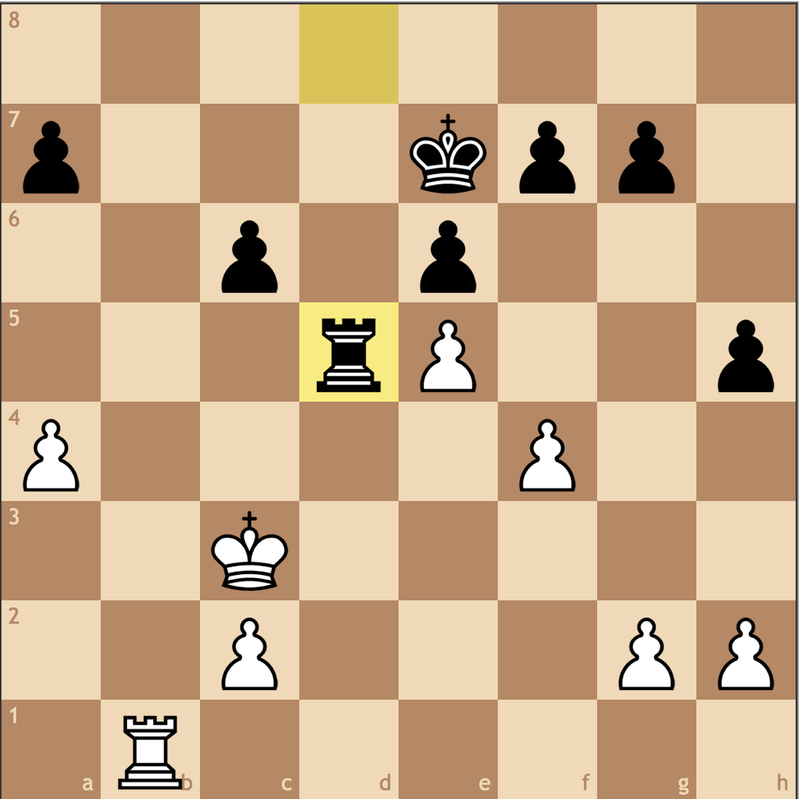 Rb5 +=, White can enjoy a long-term advantage with pressure on both b6 and h5. 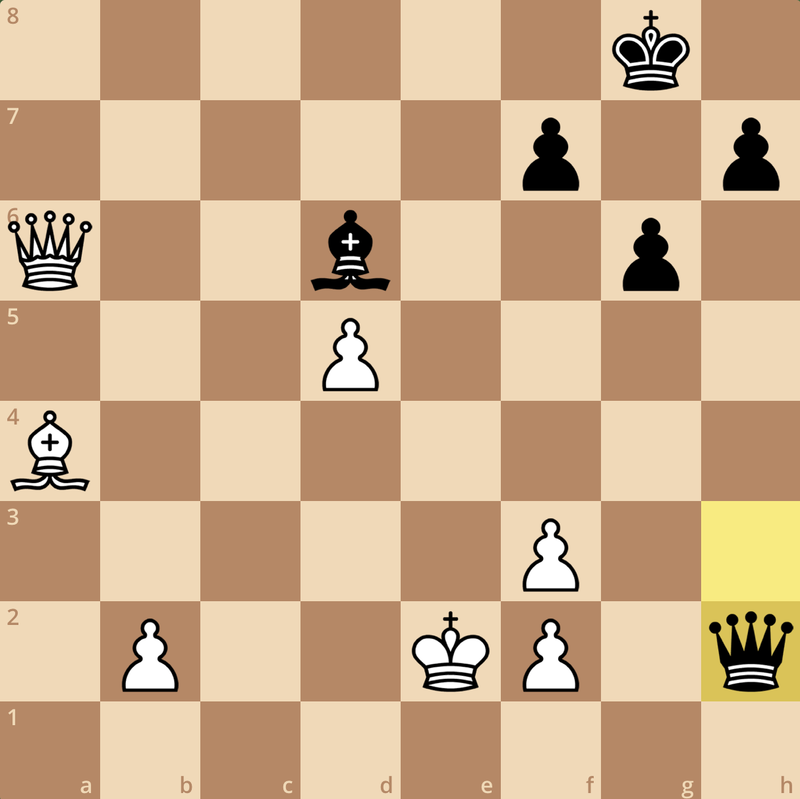 Even though Caruana has made completely natural moves, White has consistently made matters difficult for him. 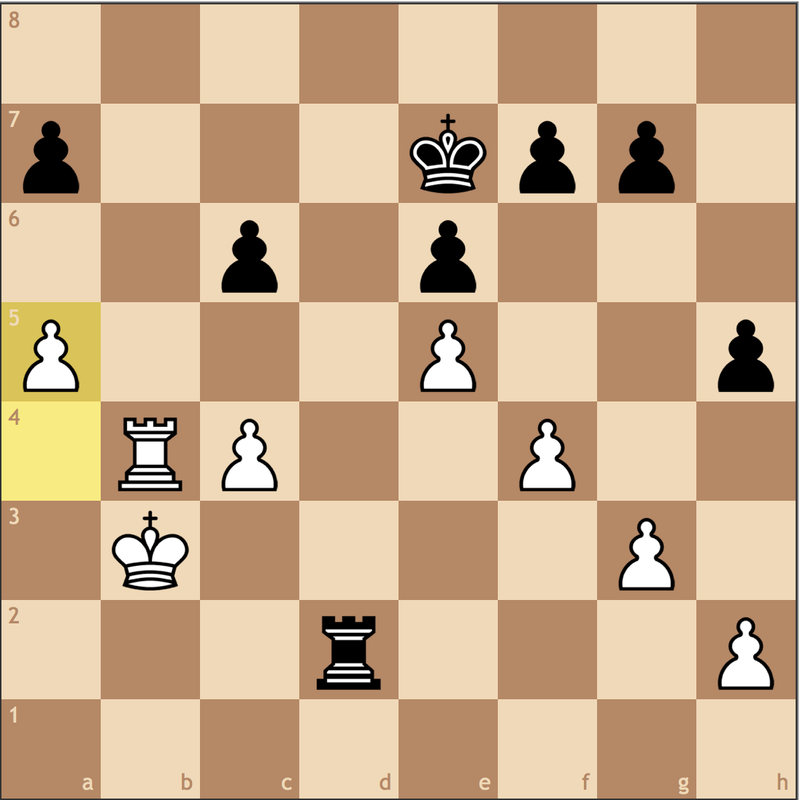 Should Black try 35…f4, he will constantly have to defend a weak h6 pawn. 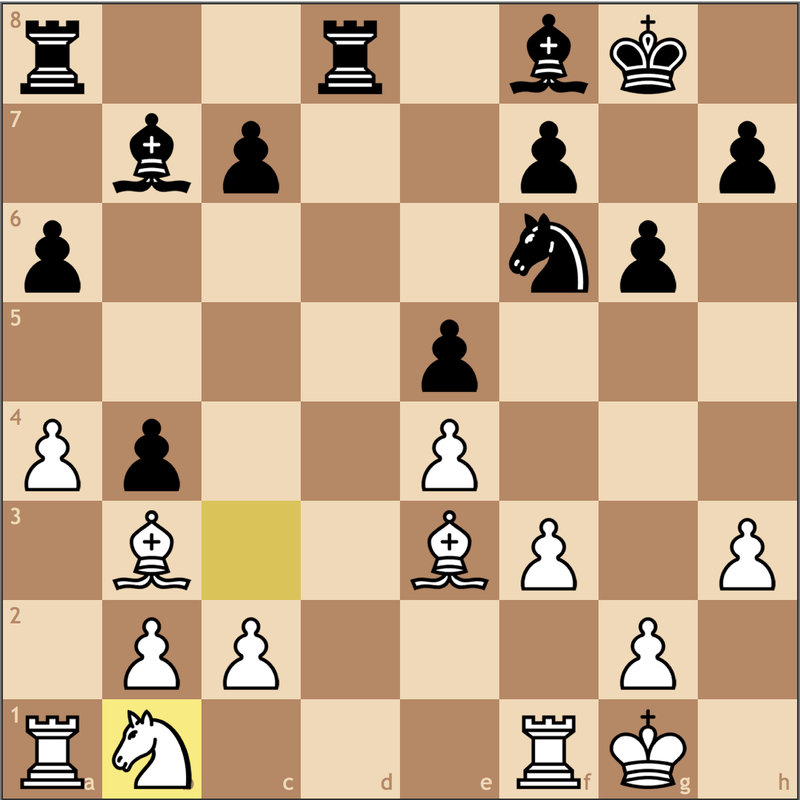 Meanwhile, White can change gears and play c3-c4-c5, only now trading weaknesses because it will be more difficult to defend a5 and h6 than it currently is with b6 and h6. 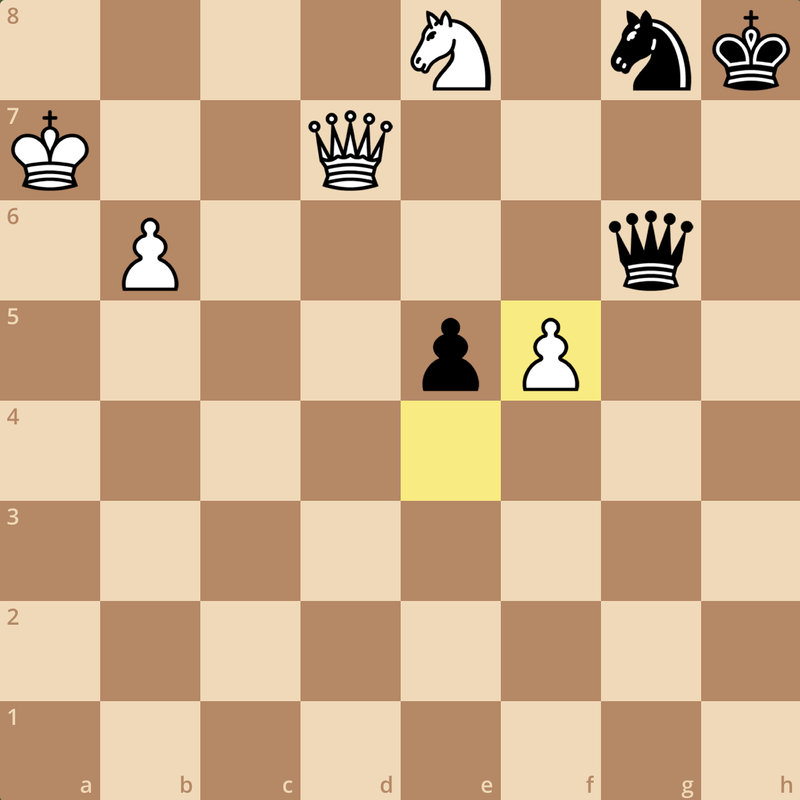 Black decided to keep his structure compact, but this means his king is stuck on g7 protecting h6 until the structure is resolved! Black has some weaknesses, but nothing nearly as pronounced as our previously analyzed games. 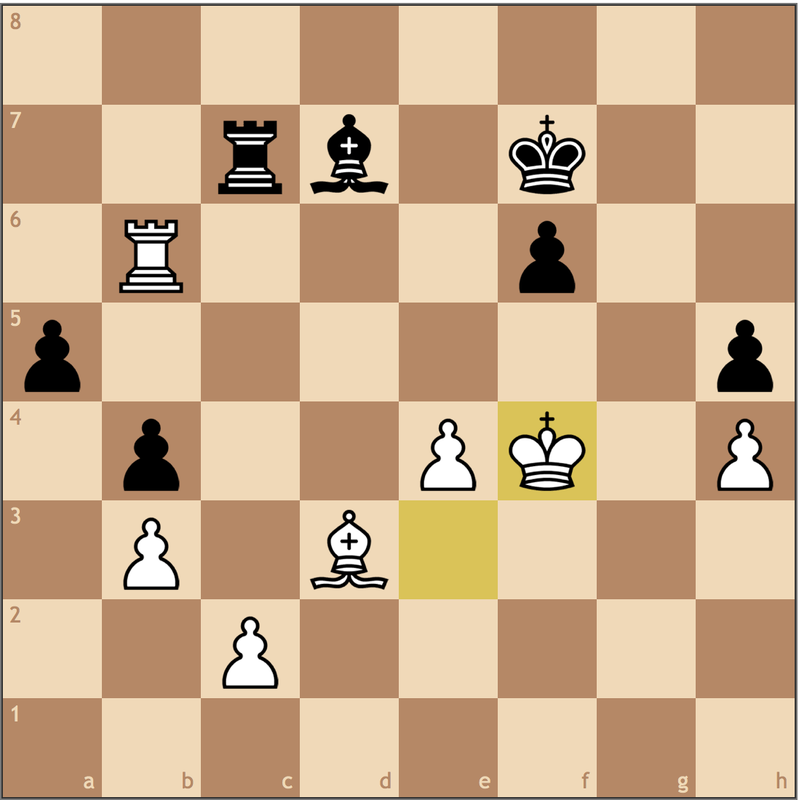 However, by improving his pieces and getting space on the kingside, White’s advantage is already becoming visual. 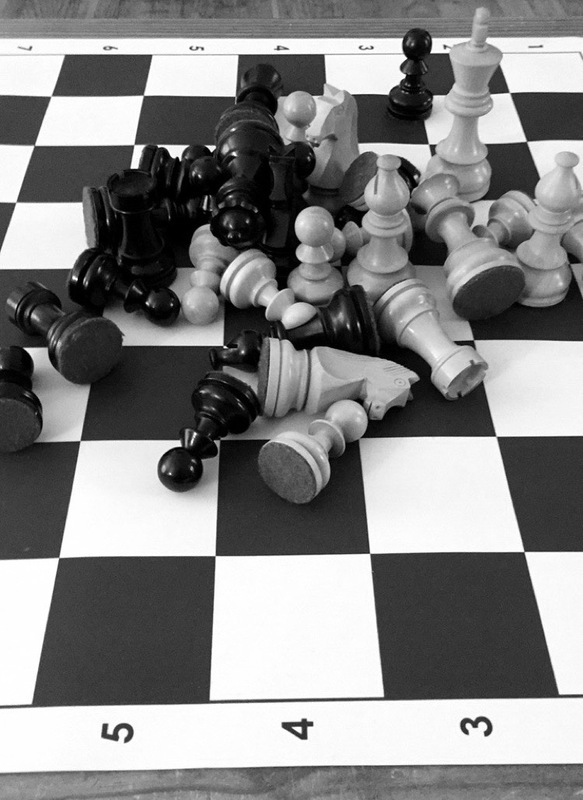 Black now is challenged to find moves that don’t make concessions. 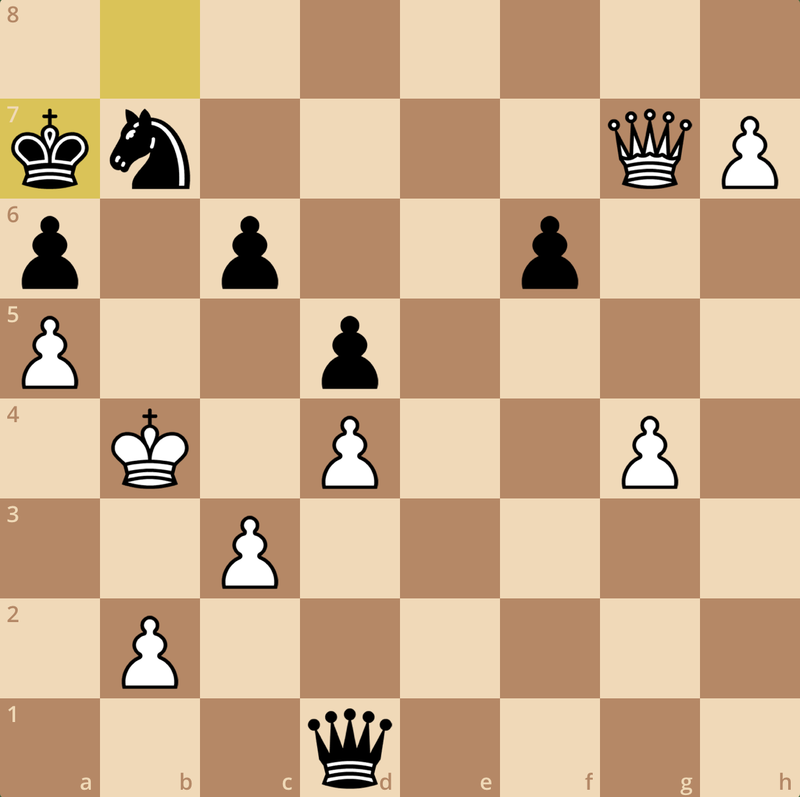 Pressuring the g6 pawn. 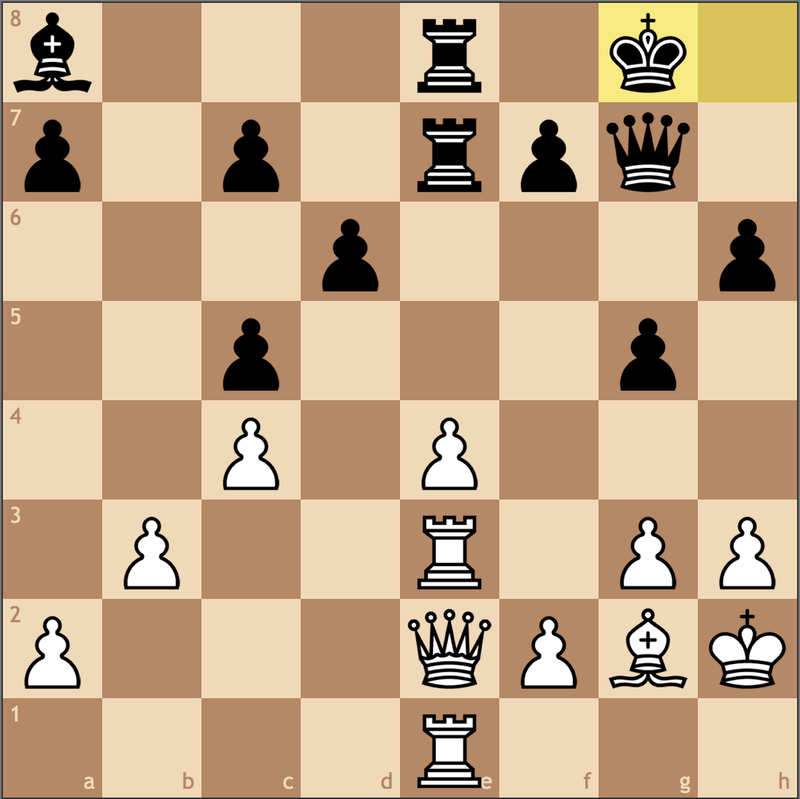 White’s intention is to make the h6 pawn much more exposed. Even if Caruana tries 41… gxf5 42. gxf5 with the belief that White’s structure also becomes weak, he’ll quickly find that he has no easy way of attacking the isolated f- and h-pawns, since b6 (and soon h6) are under fire. Sometimes, your opponent’s biggest weakness is only as weak as your strongest strength – here the damage to White’s structure is negligible. Now that Black has distanced himself from his kingside pawns, Carlsen takes on g6 with the h-pawn so he can attack h6 via h1. 44…fxg6 45. Rh1 Kf7 46. Kd5 Rd6+ 47. Kc4 gxf5 48. gxf5 Bd8 49. f6!! An incredible interference! 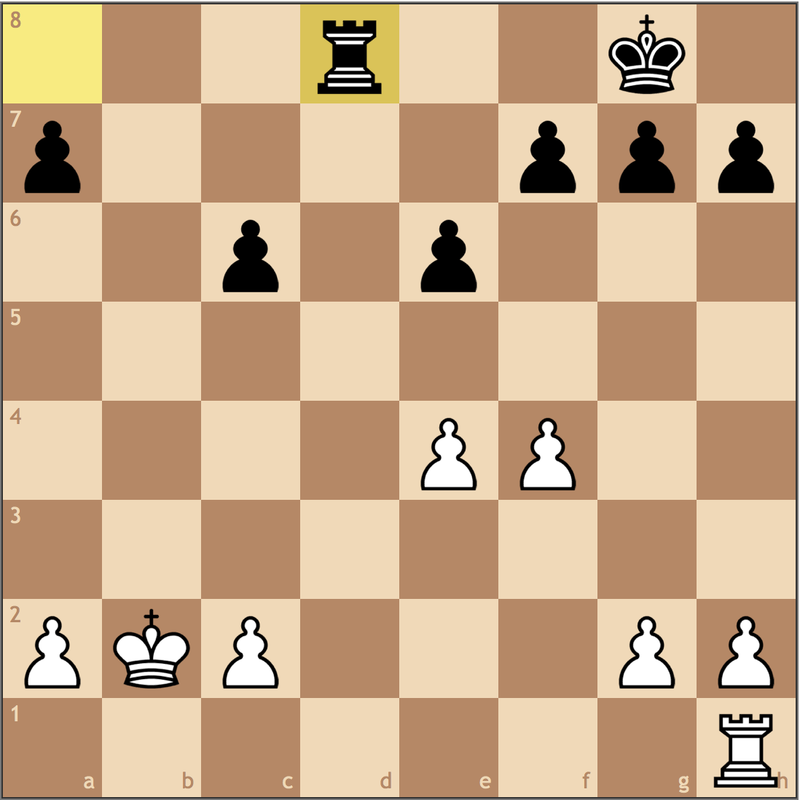 White trades the kingside pawns, with the idea that liquidating pieces will only help White since his king is closer to the queenside. 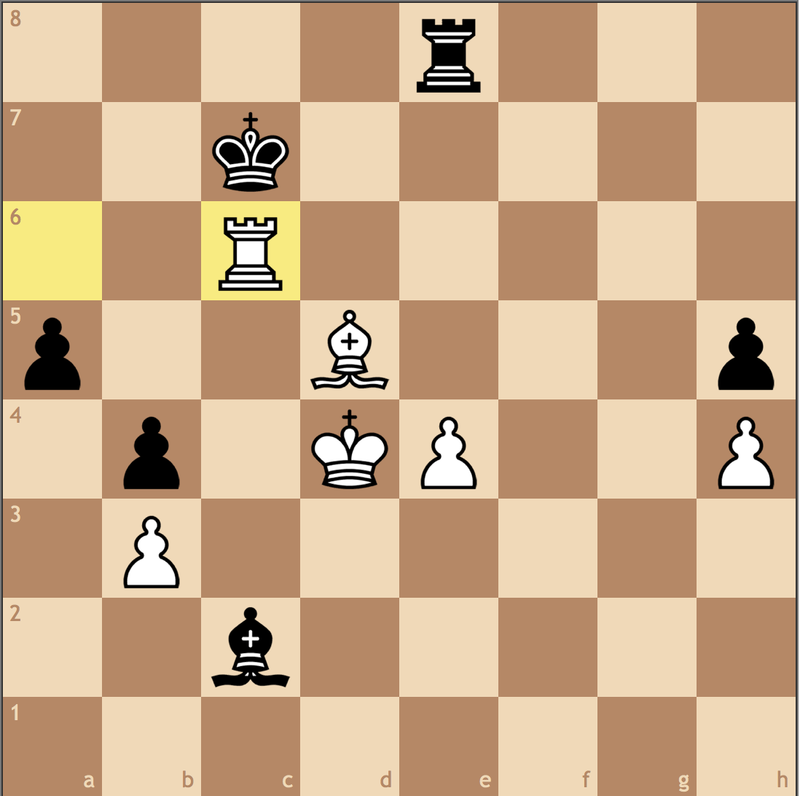 Black has to oblige, and as we’ll see, his position quickly collapses. And 23 moves later, the debate is resolved, the b6 pawn was weaker than the isolated c-pawn. It was important that White expanded on the kingside because it came with the caveat of having a better king in the final position. Black played on for another 14 moves, but the win is simple. 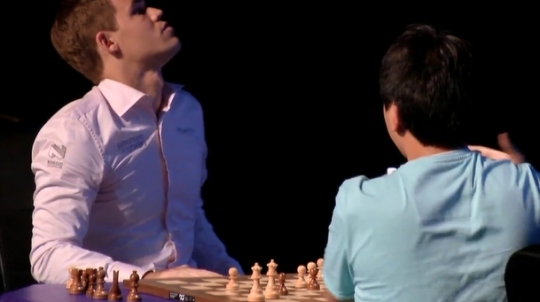 Carlsen picked up the last of Black’s pawns and then pushed his down the board. 2013 proved to be Carlsen’s year. 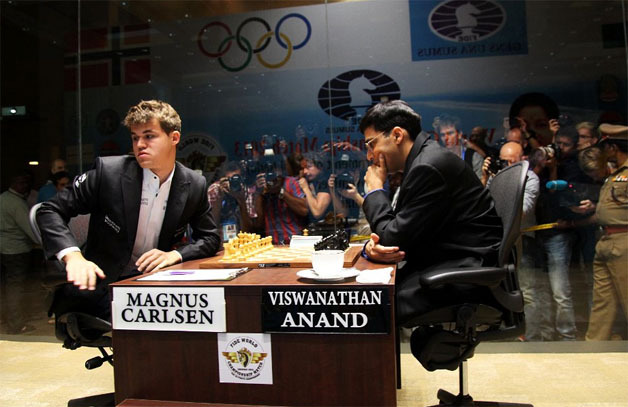 By the year’s end, he went on to beat Anand for the World Championship in Chennai. 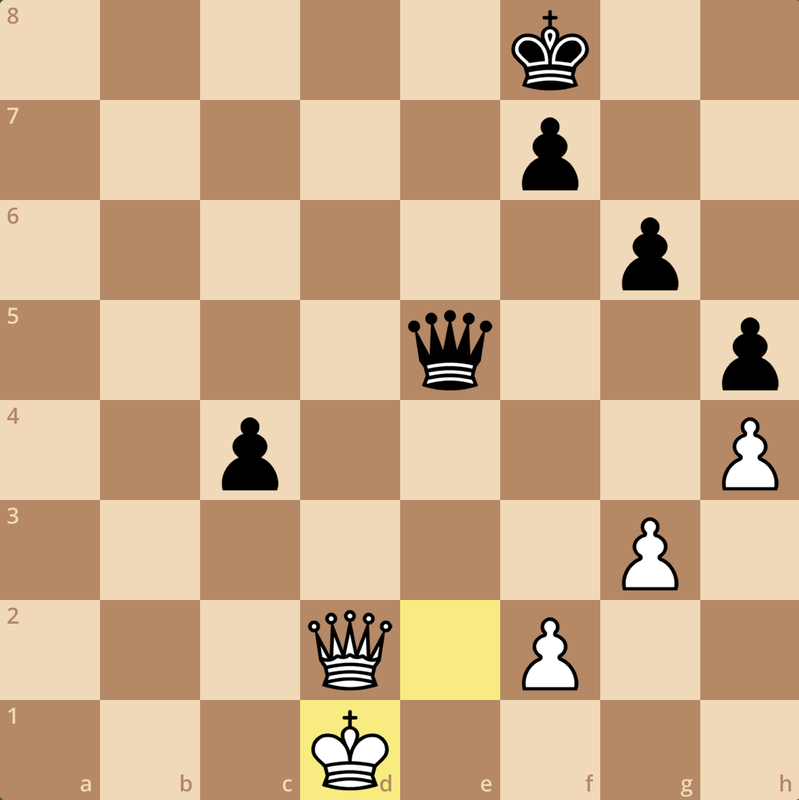 For our last example today, both sides attempt to expand in the endgame, but Carlsen’s opponent tried for too much – which ultimately proved for his own demise! Already we can see some reasons as to why 12…b5 may be questionable. 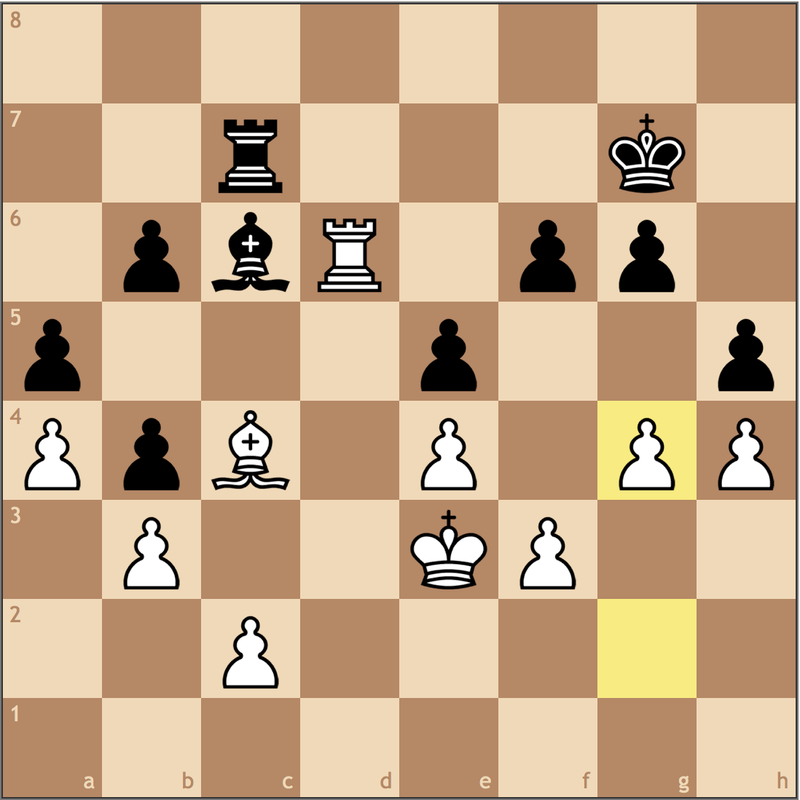 First, b3 isn’t exactly a “worse” square than c4 for White’s bishop. 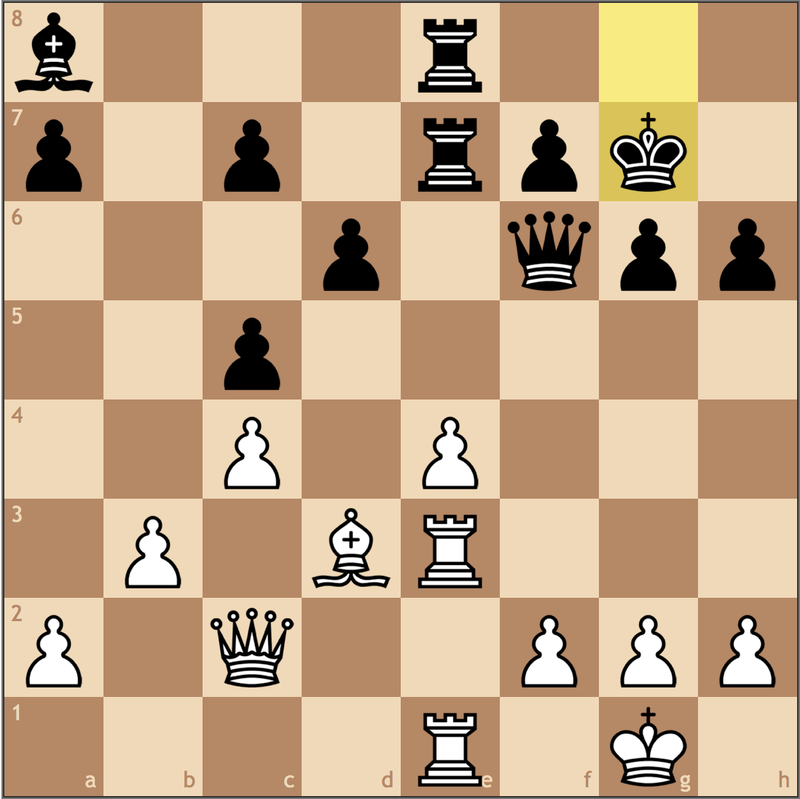 More importantly, the move a2-a4 is beckoning to be played, with the idea of undermining Black’s structure. 13…Bb7 14. f3 Bf8 15. a4! Now Svidler is faced with an uncomfortable decision. Does he take on a4 and cripple his queenside forever, or does he hyperextend with b5-b4? 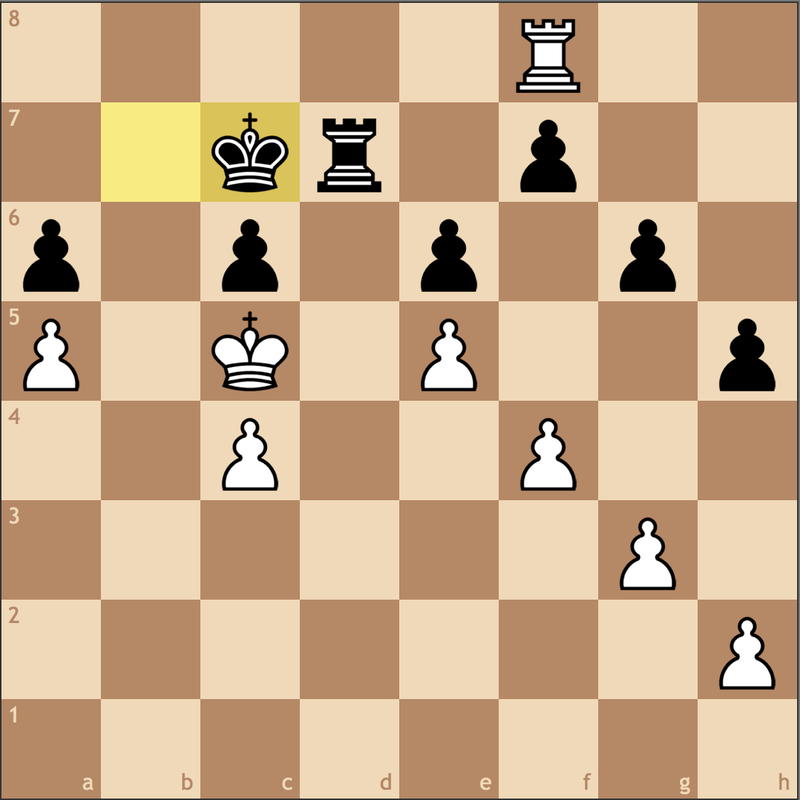 While the b-pawn push is optically pleasant, it comes with the drawback that c4 is weakened forever. 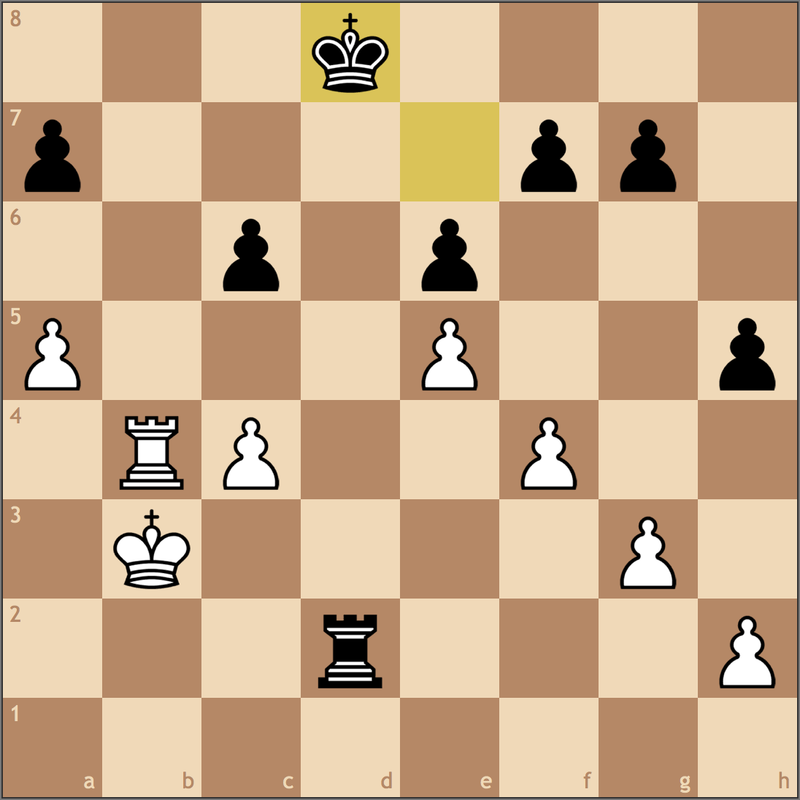 Taking advantage of Black’s hyperextension. 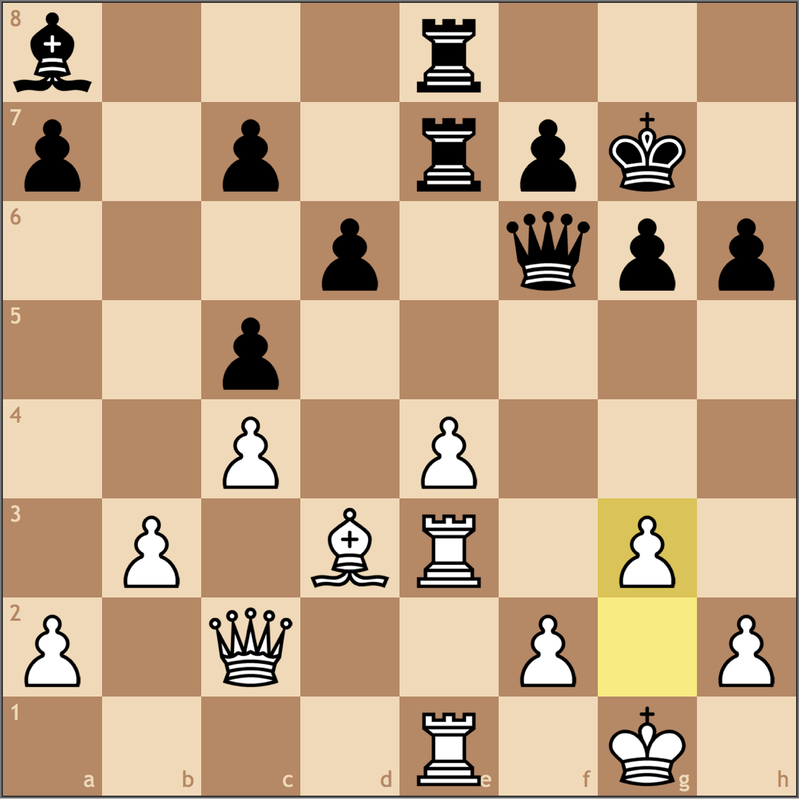 Carlsen plans a quick maneuver, Nb1-d2-c4 to put pressure on e5. 16…Nd7 17. Nd2 Bc5 18. Kf2! A nice application of a simple idea here – trade only if it helps you! Taking on c5 would activate Black’s knight, so now, if Svidler wants to trade dark-squared bishops, he must take on e3, activating the king! Phase 1 of White’s plan is complete. Magnus stands slightly better thanks to his control over c4, but Svidler has done well to not create new weaknesses. 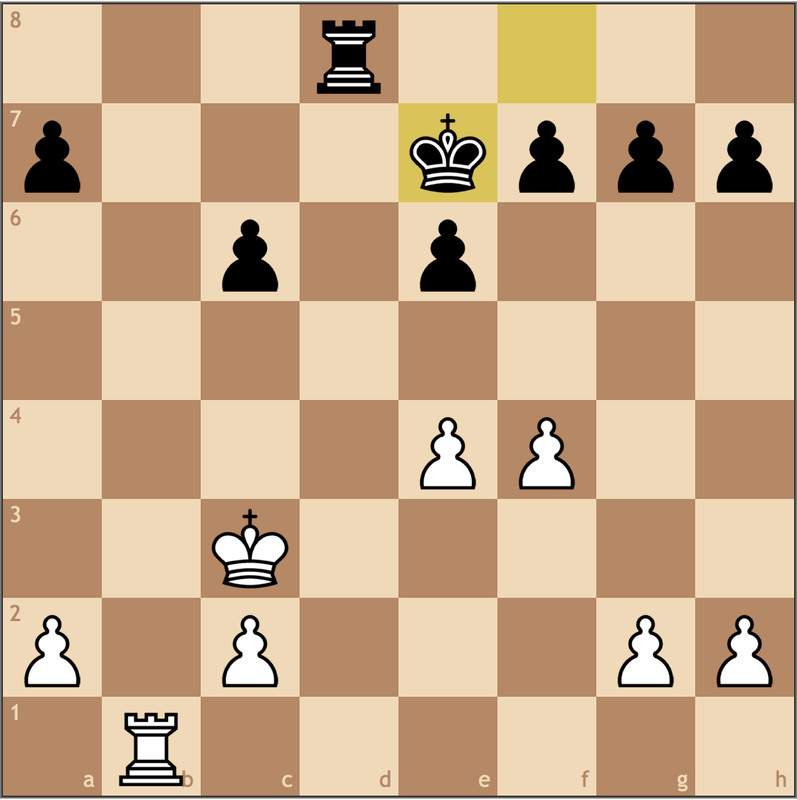 The next stage of the game is brief, as Carlsen simply grabs the d-file. Once again Carlsen is doing well, but it still seems like Svidler can hold this position. 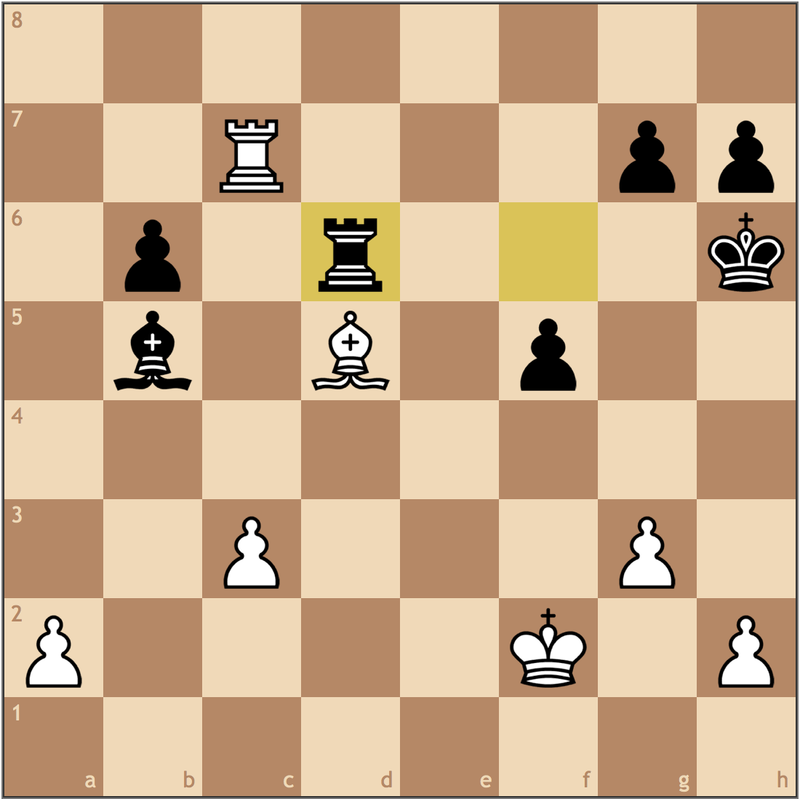 In phase 3, White finally improves his structure on both sides of the board to increase his winning chances. 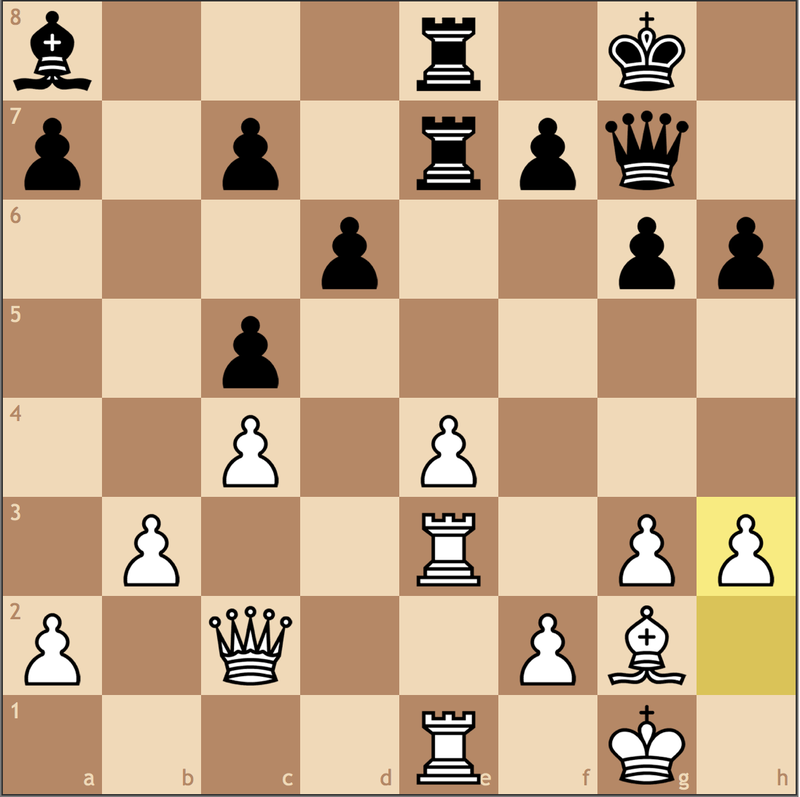 White has sealed the queenside, as now both a4 and c2 cannot easily be hit. Meanwhile, b6 is already a future target for White. But first, Carlsen plays on the whole board! 29…Kg7 30. h4 h5 31. g4? Svidler must make another tough decision. 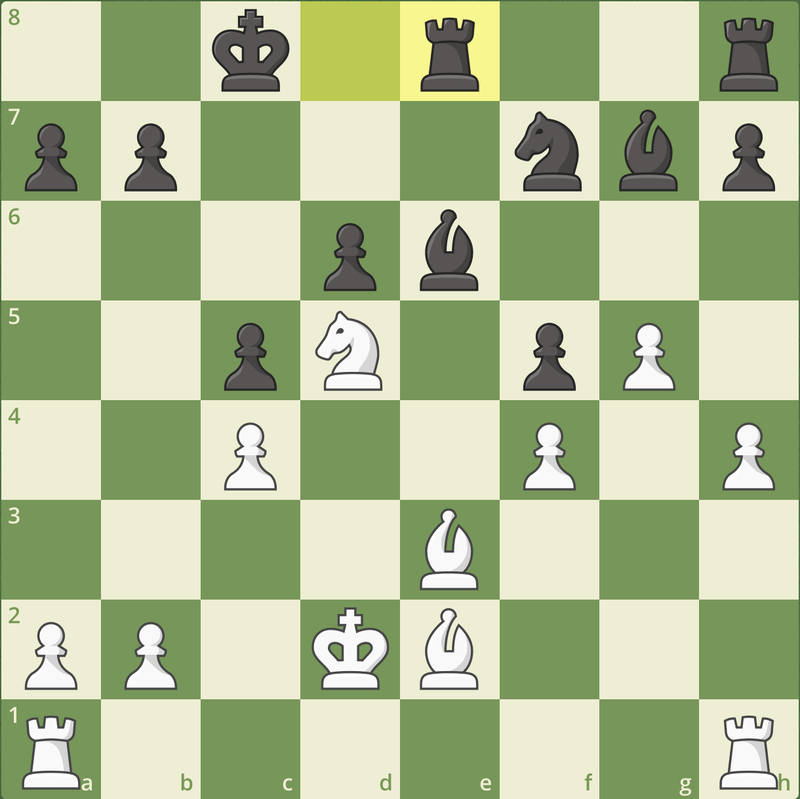 Does he take on g4, allowing White the opportunity to create a passed h-pawn in the future? 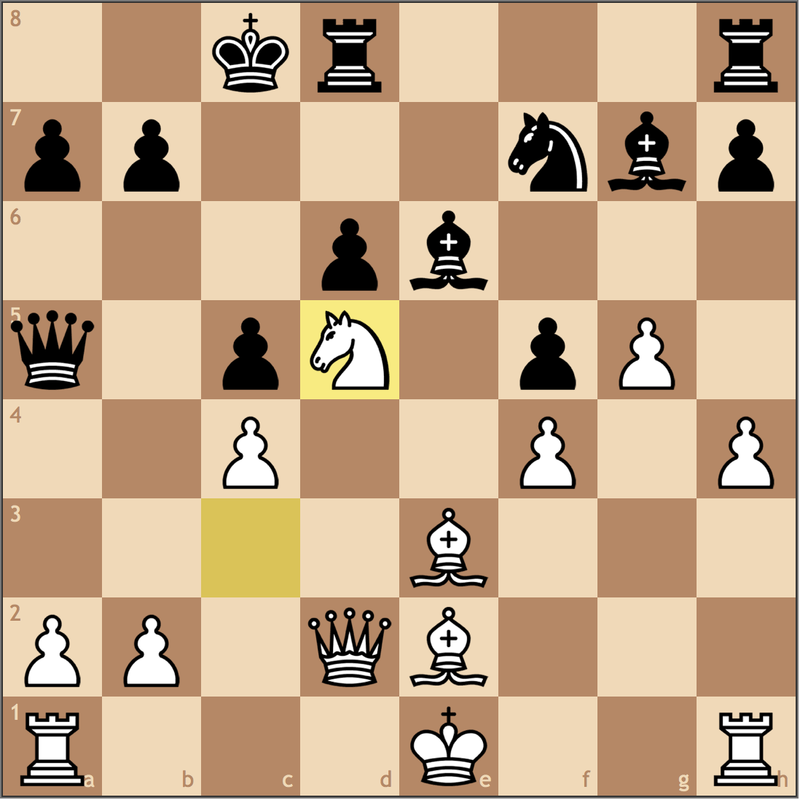 Or does he allow White to take on h5, creating another target? 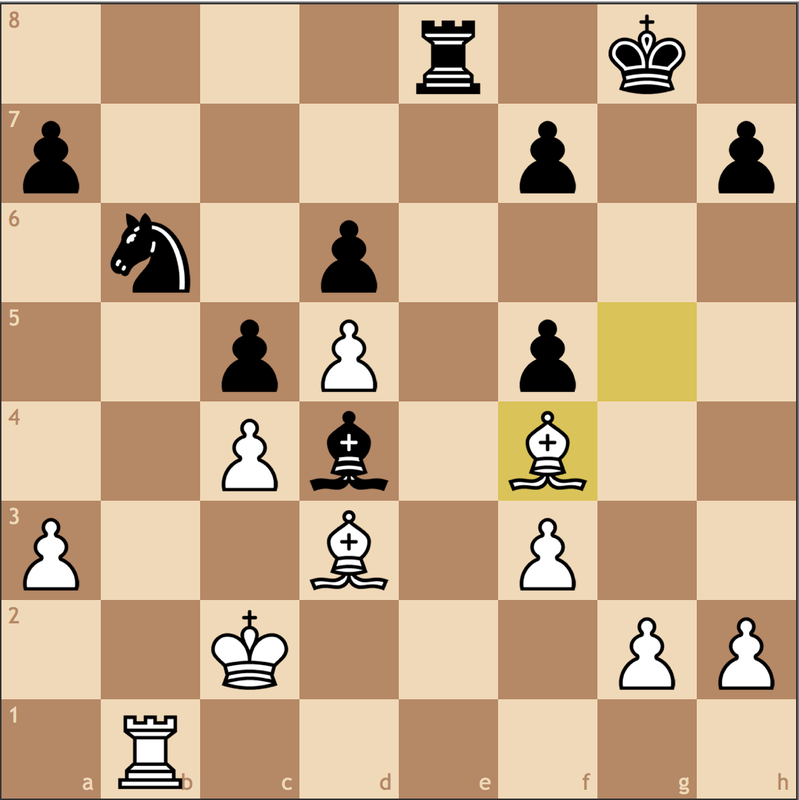 As it turns out, Black actually missed a chance to equalize here with 31…hxg4! 32. fxg4 Bxa4! 33. 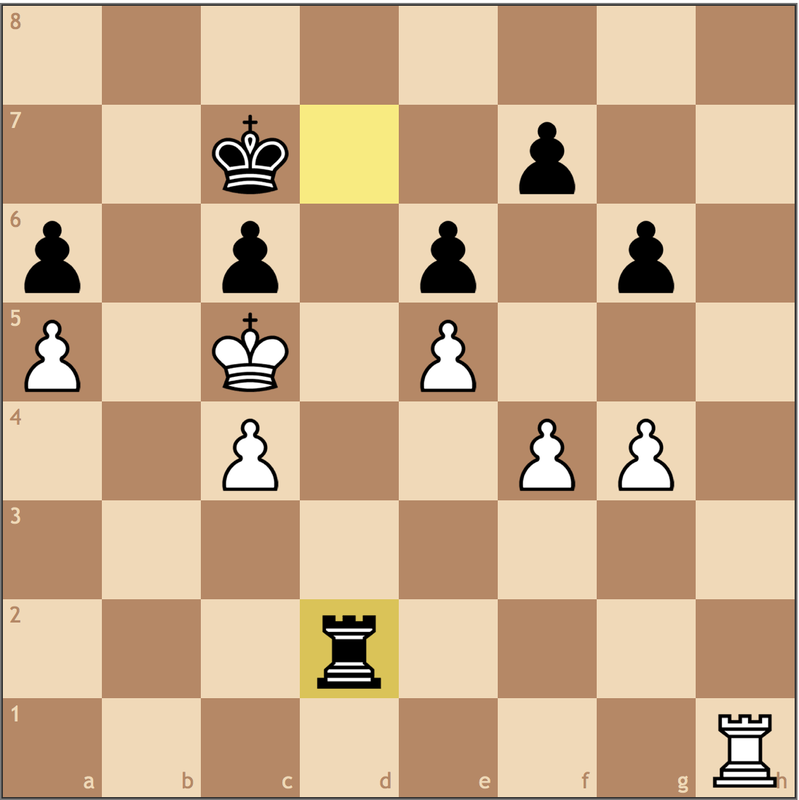 Rxb6 and Black has a lot fewer weaknesses in the position. Carlsen was better if he found the prophylactic 31. 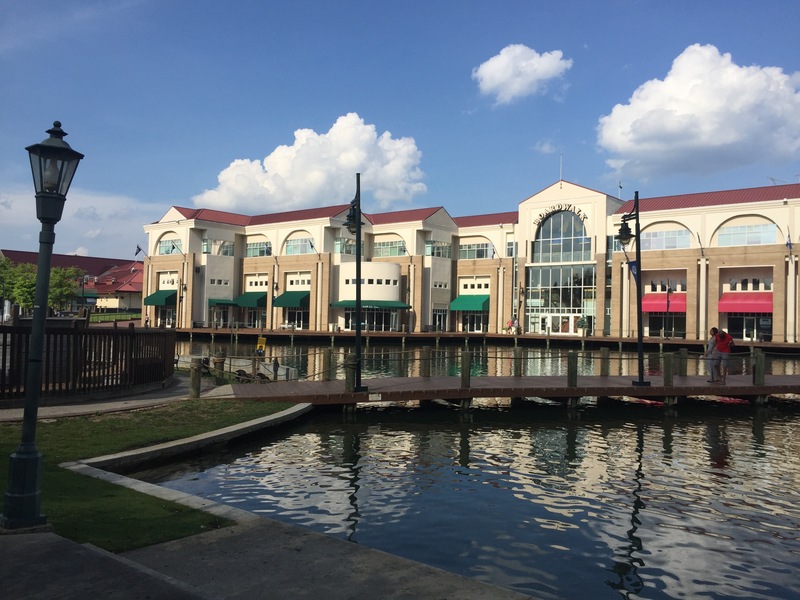 Bd3!, removing the idea of …Bxa4 and planning an f3-f4 push. 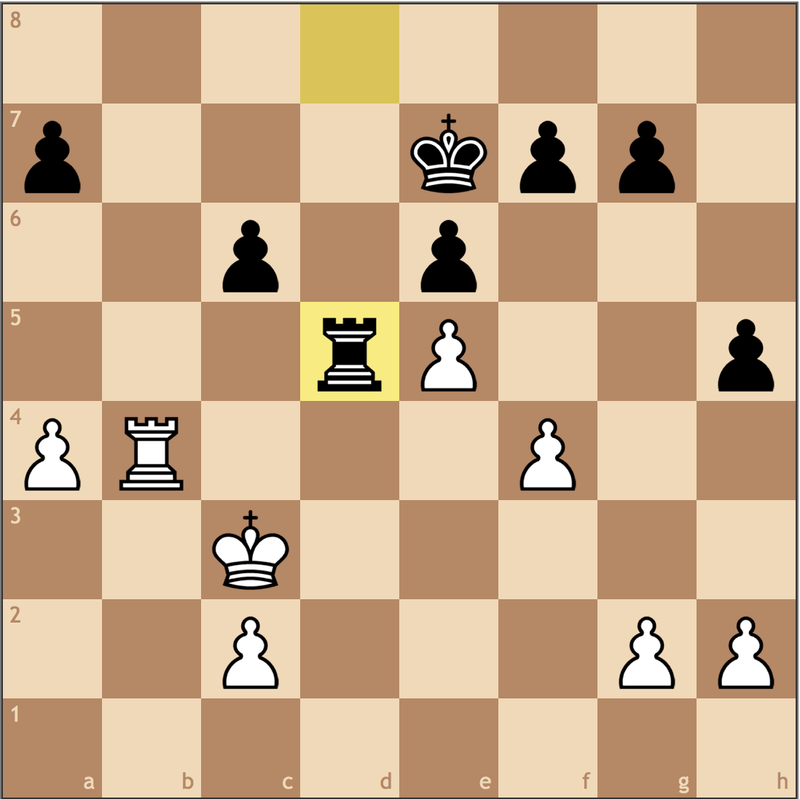 The endgame is still complicated, but White still has an edge. 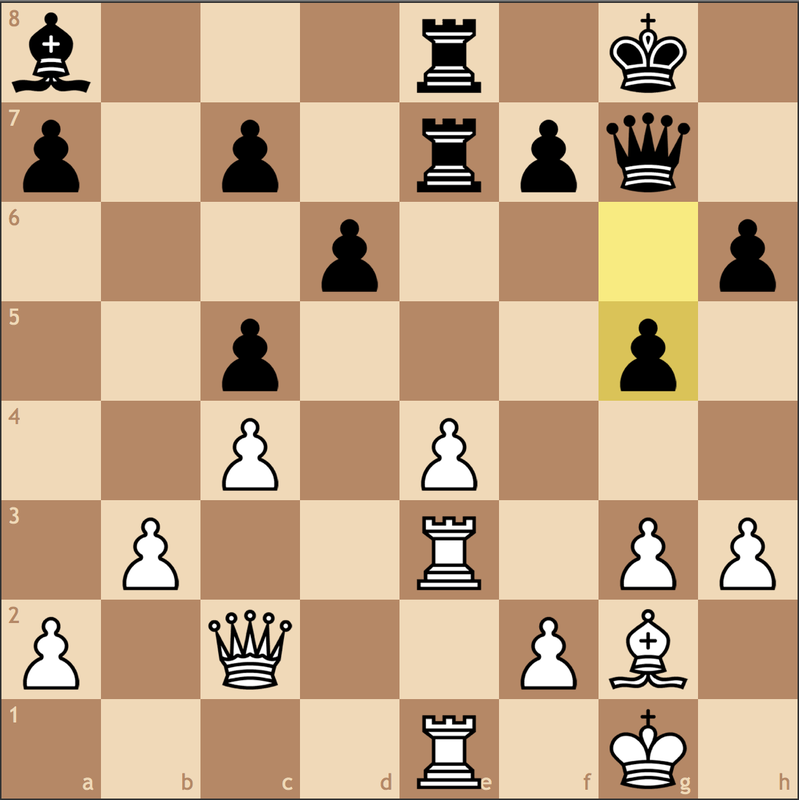 While Black may have gotten rid of his b6 weakness, he now has targets on a5, f6, and h5. 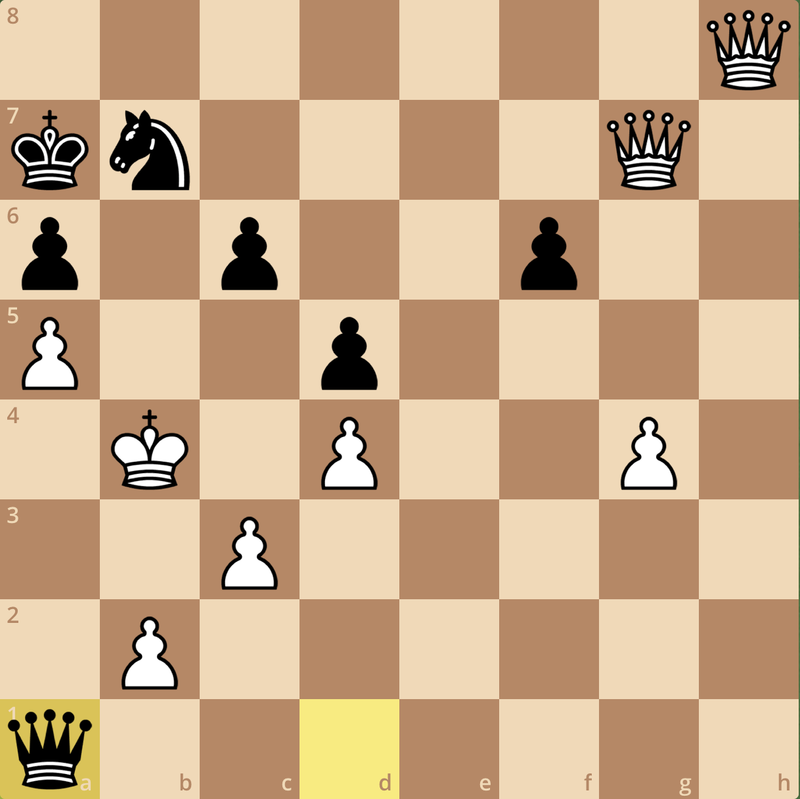 Even though Black isn’t lost here, White is still for choice. Winning this endgame won’t be simple, but by trading the e5 pawn for his f-pawn, Carlsen opens up dark squares in the center for his king. 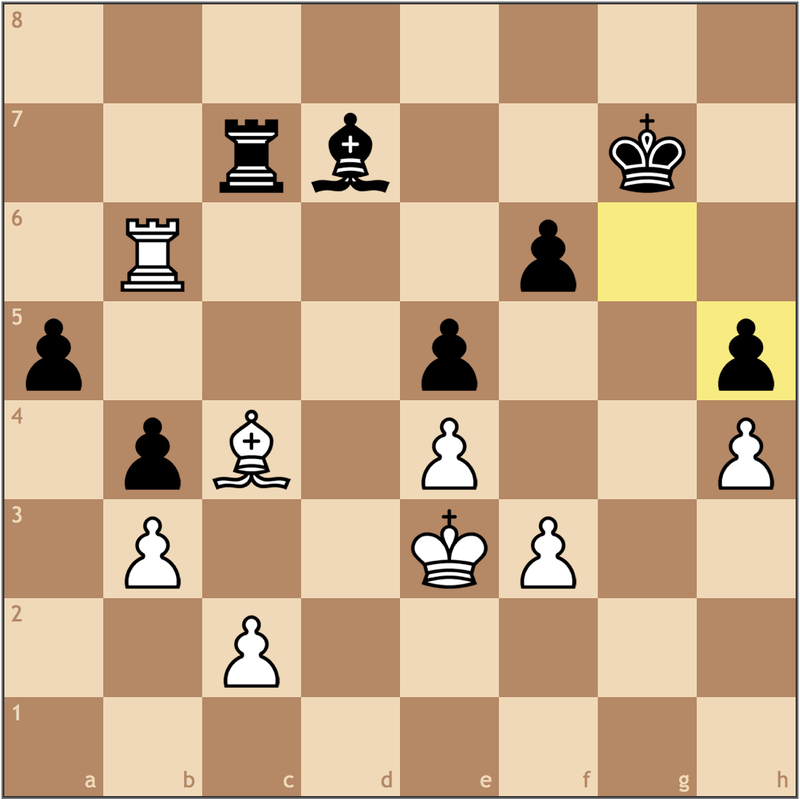 After getting his rook onto a better square, Magnus centralizes the king by moving it to d4. 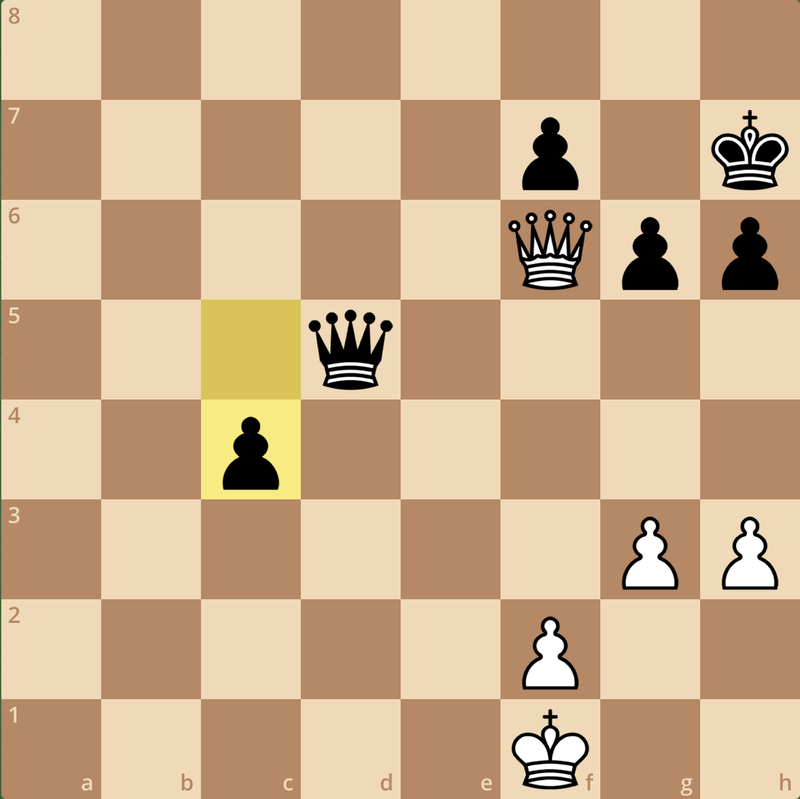 Now with a centralized king, White has slightly better winning chances. 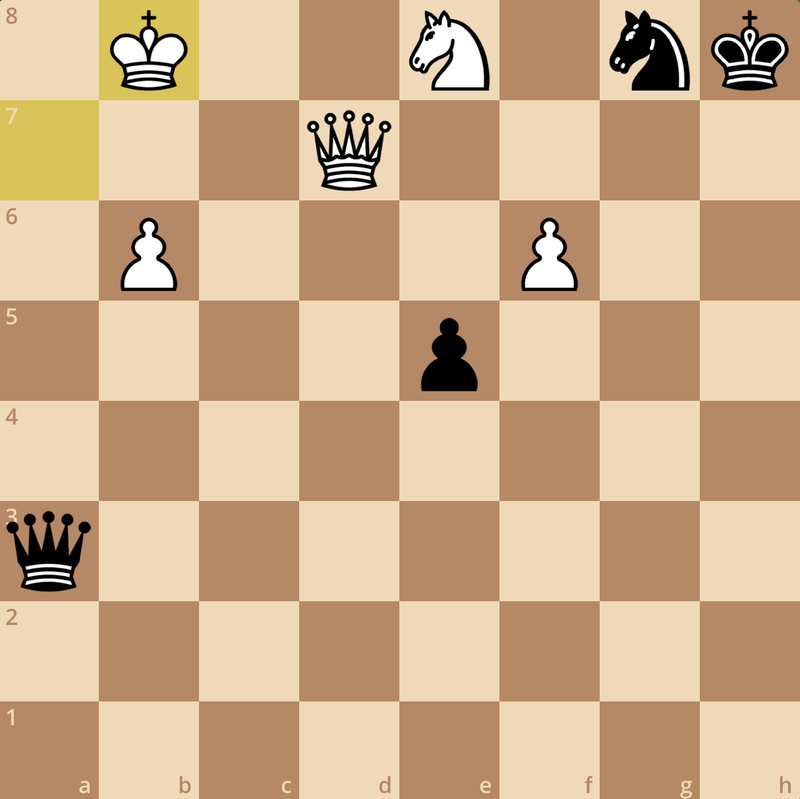 White will now bring his bishop to c4, reducing the Black rook’s options. 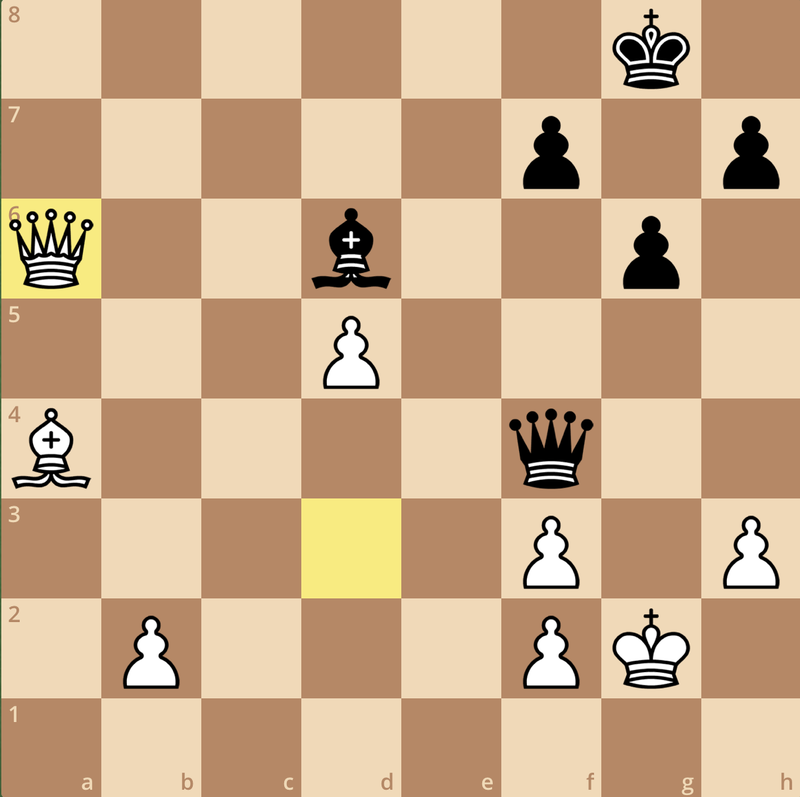 With this move, White is in full control once again. 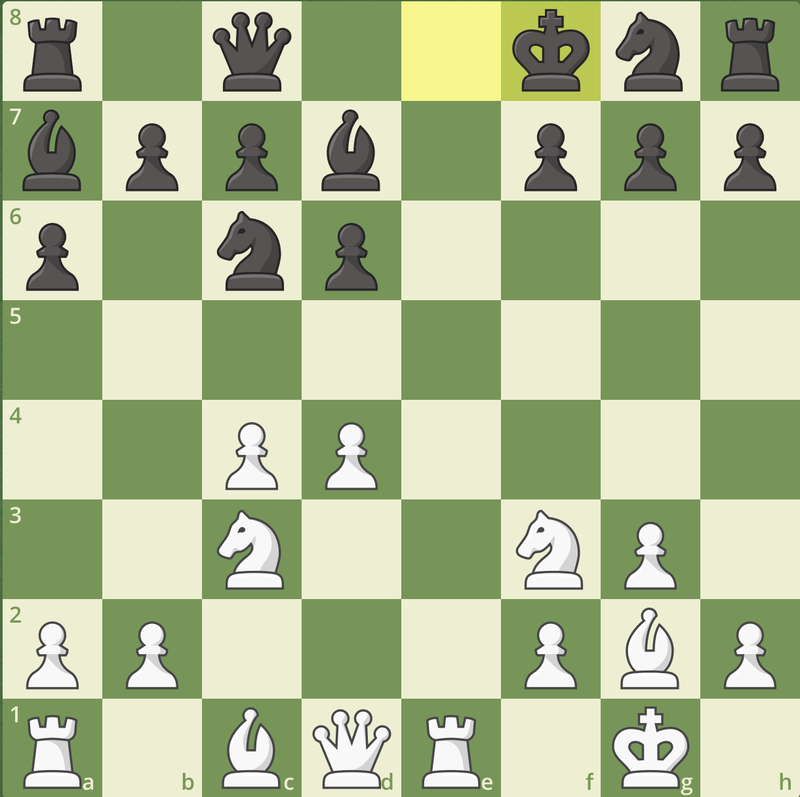 Black’s rook only has two moves that don’t immediately drop a piece, and each of Svidler’s three weaknesses are much more difficult to defend. A simple oversight by Svidler in a position that was already lost. This game gave us both good and bad examples of expanding the structure. 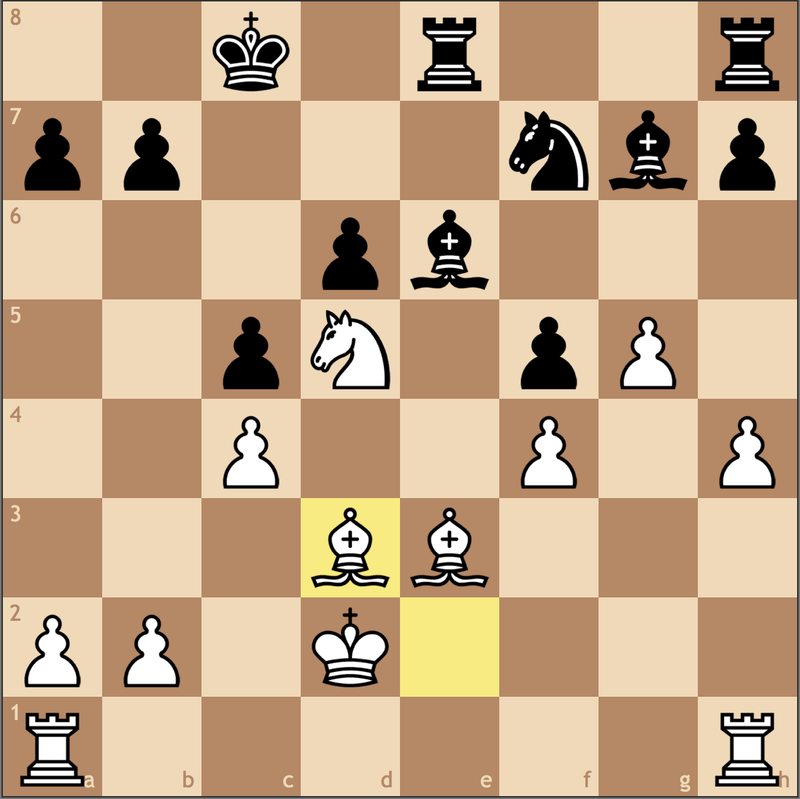 Early in the game, Svidler pushed too quickly, giving White counterplay on the queenside and a great outpost on c4. But this wasn’t enough to win. 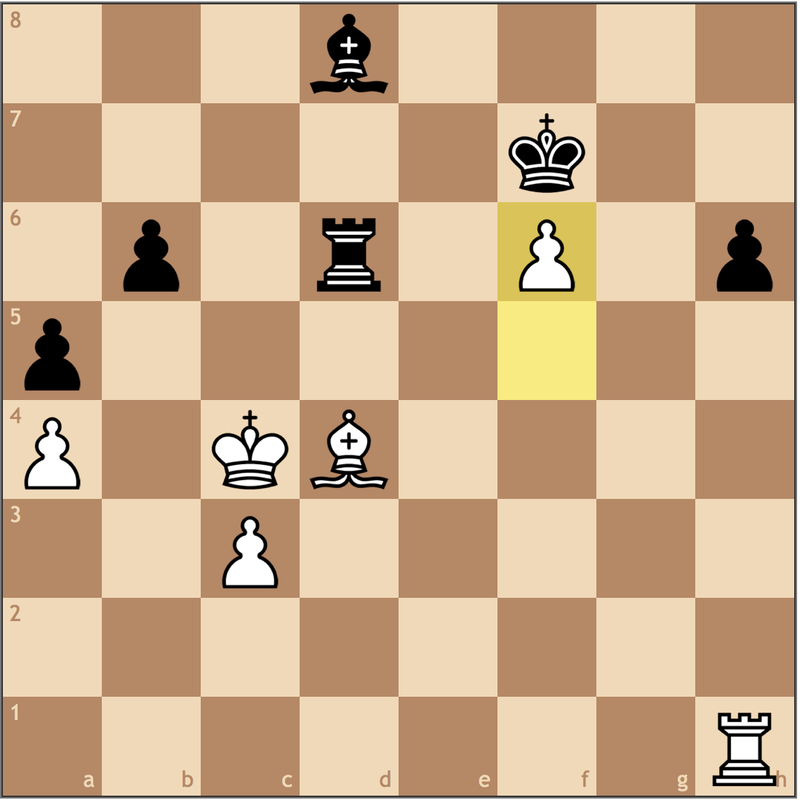 By expanding on the kingside (the one blunder aside), Magnus managed to break Black’s pawn structure. 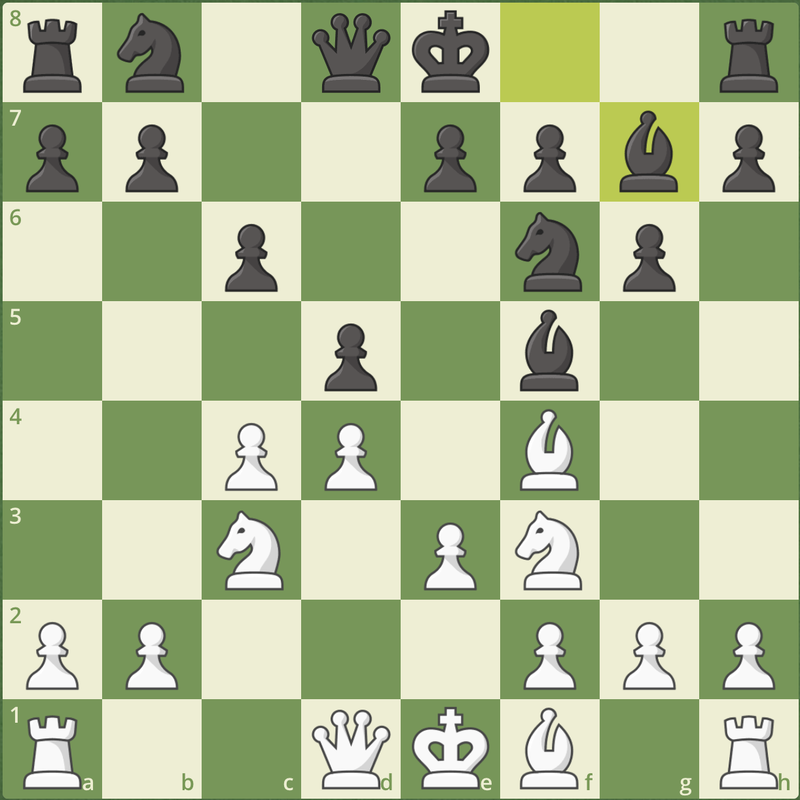 In today’s post, we discussed how in seemingly equal positions, we can increase our winning chances by improving our pawn structure and gaining space on each side of the board. Often times it isn’t enough to have one weakness in the position, so often changing the structure (in our favor) gives us more attacking options and plans to stretch out our opponent. I’ll be playing my first tournament in over a month this weekend at the Marshall Chess Club in New York City, so I won’t be able to post my usual video on Sunday. Look out for my next post early next week, where I’ll hopefully be sharing what turned out to be a good performance!